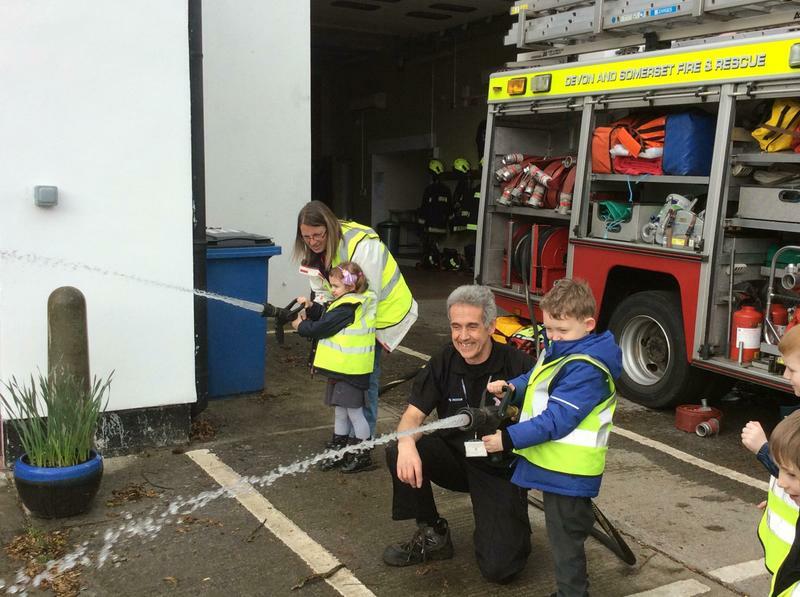 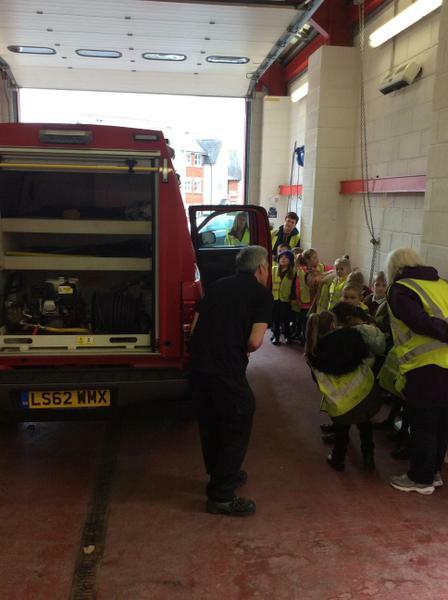 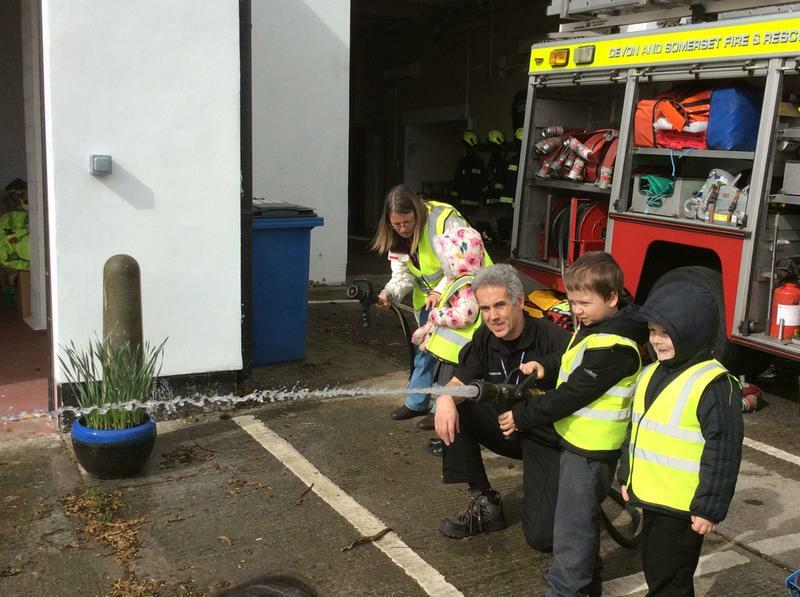 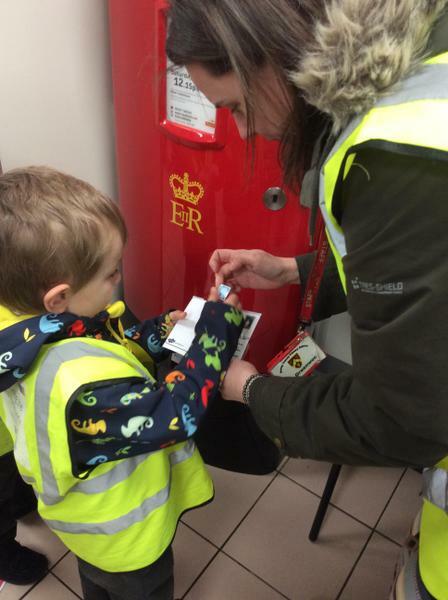 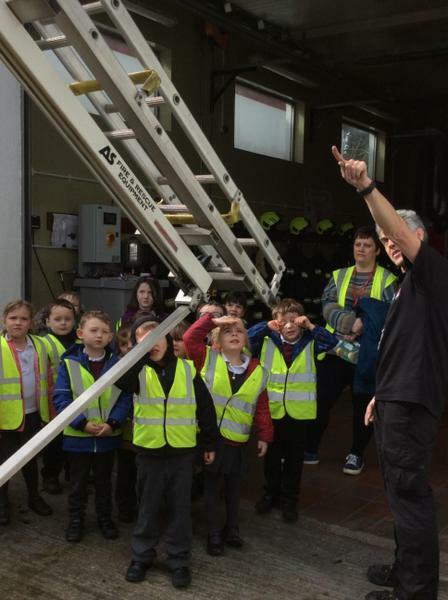 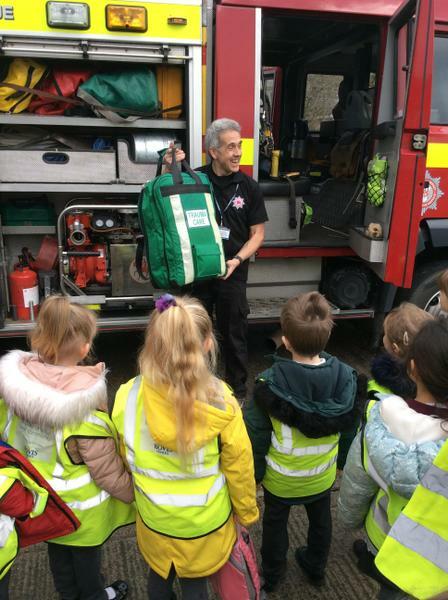 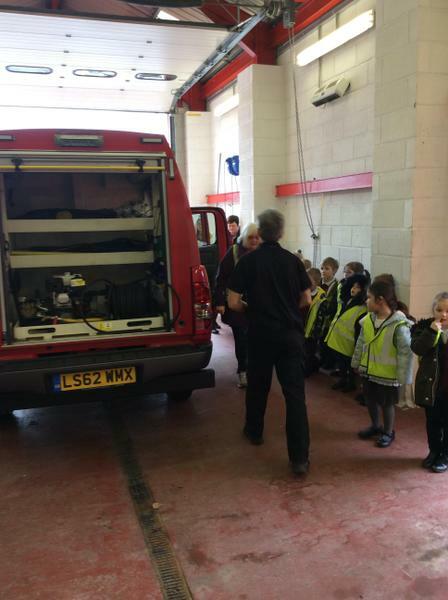 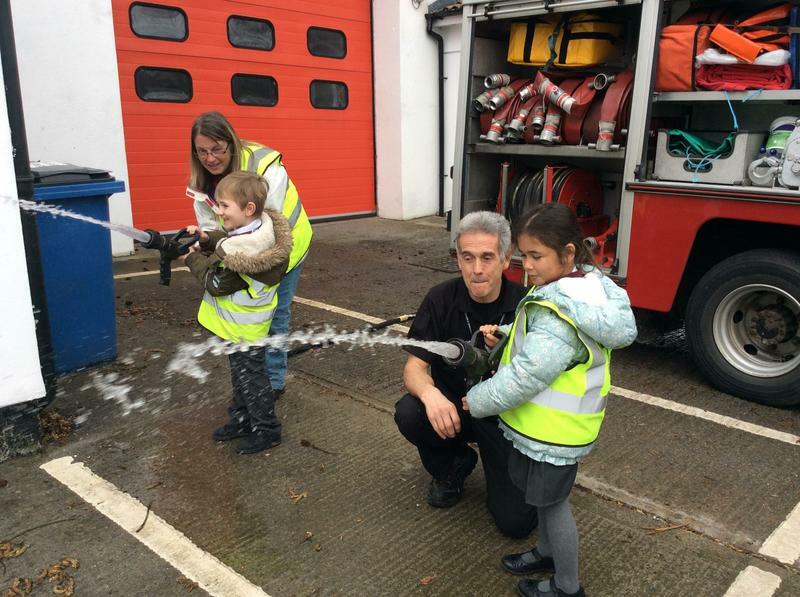 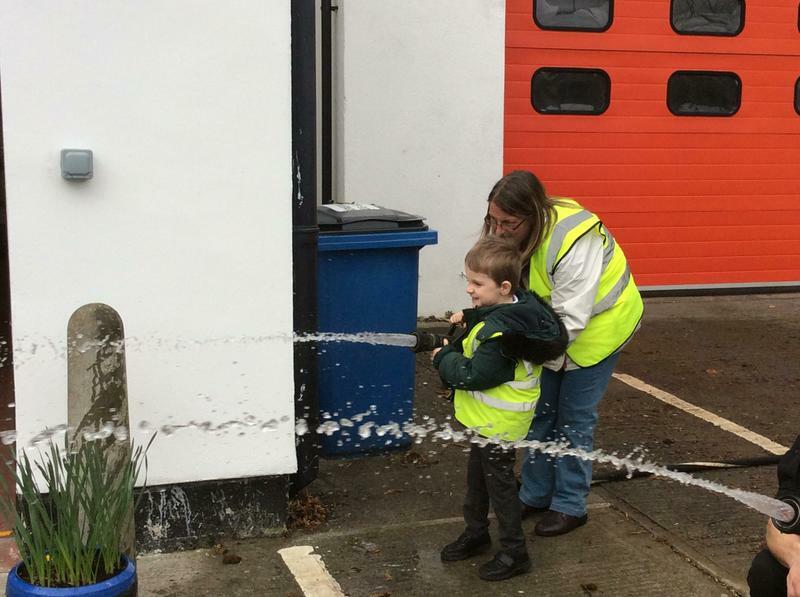 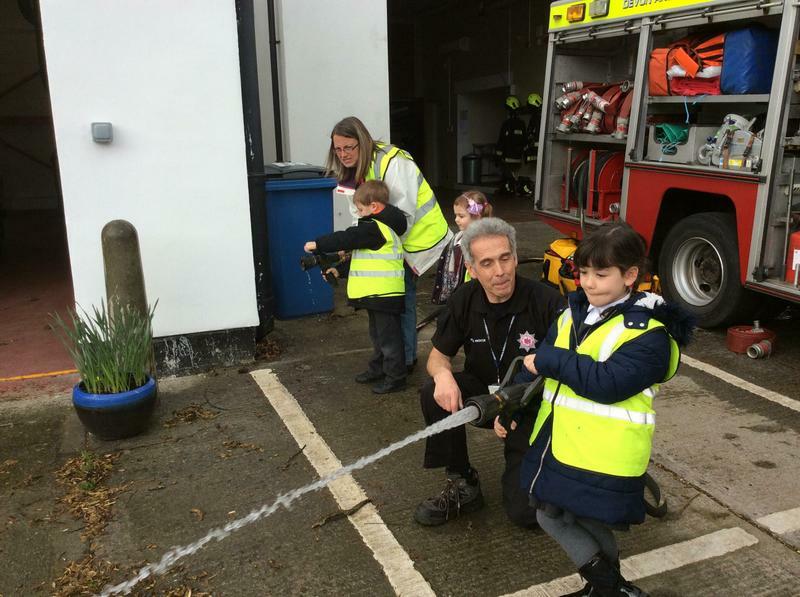 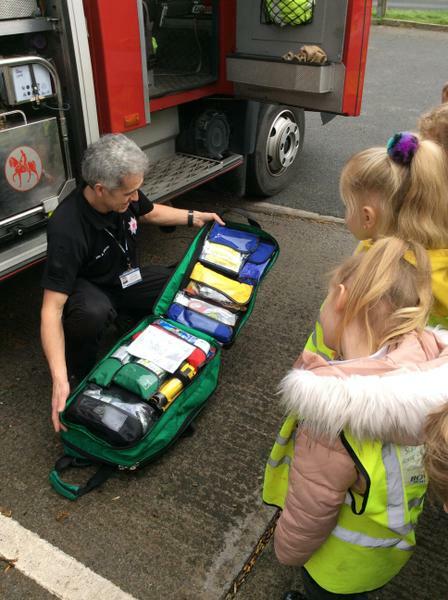 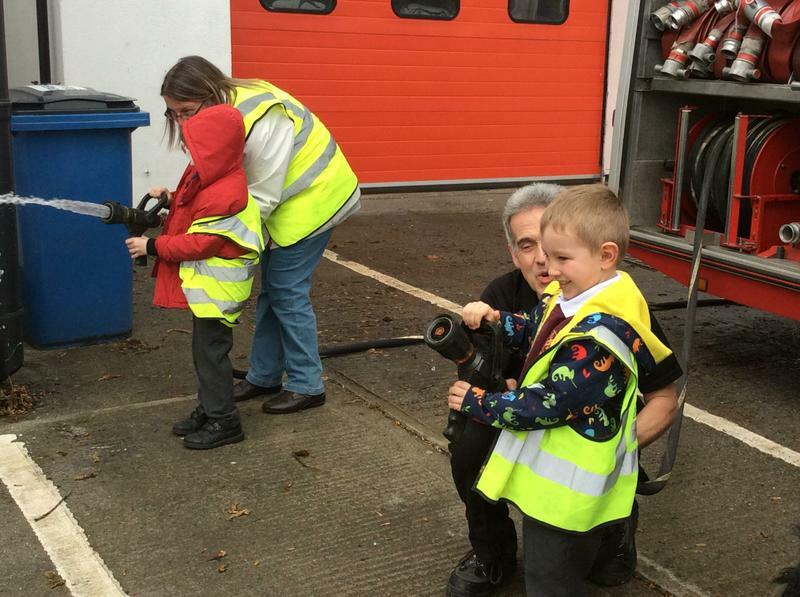 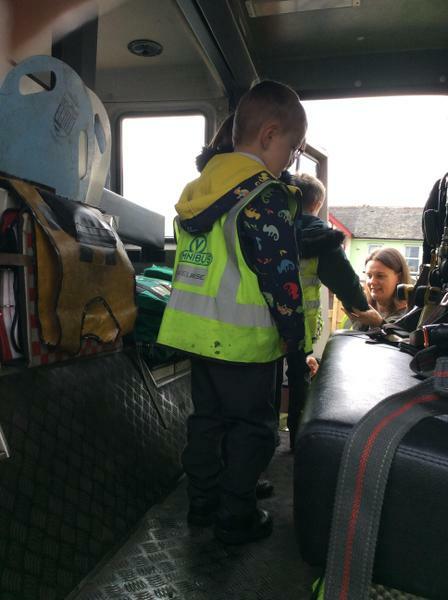 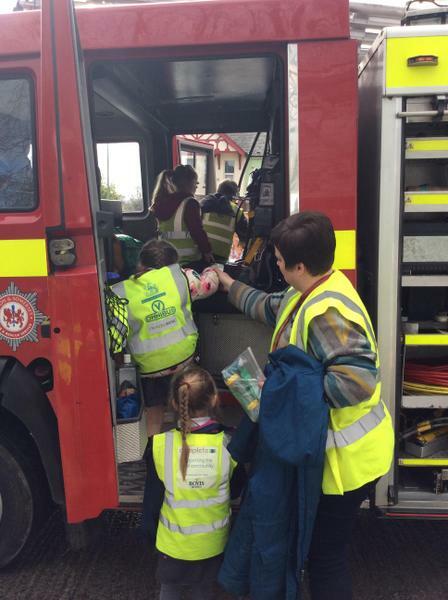 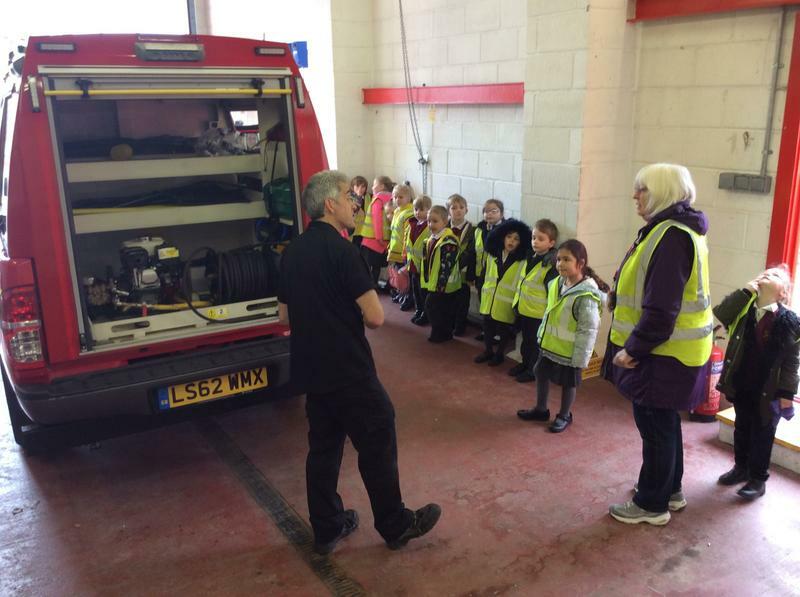 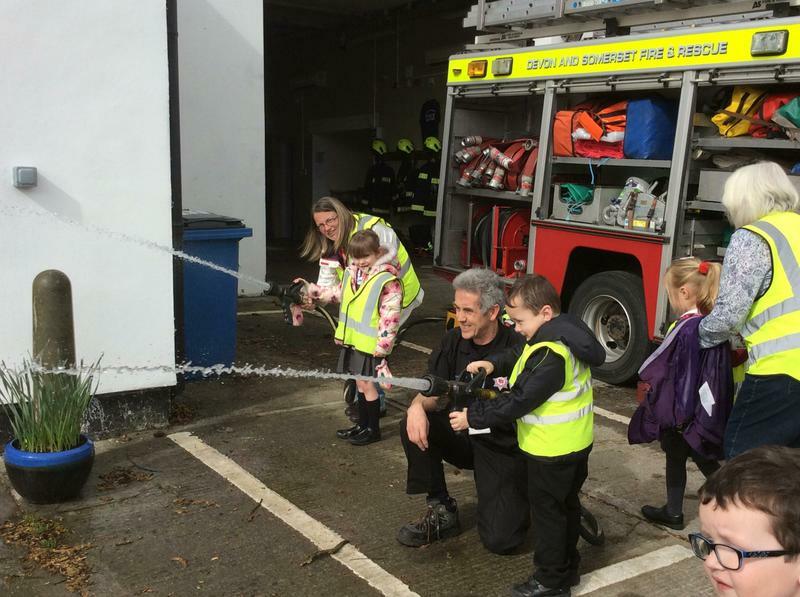 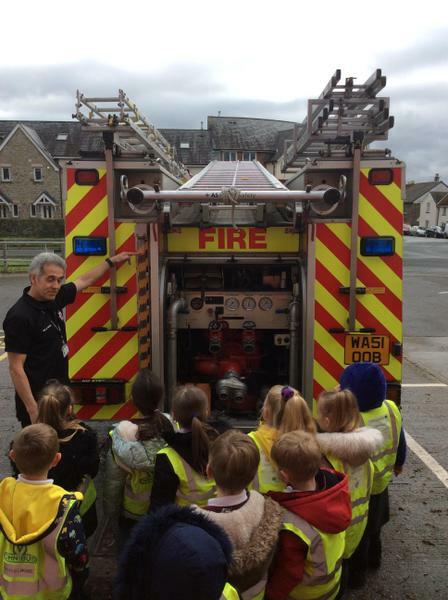 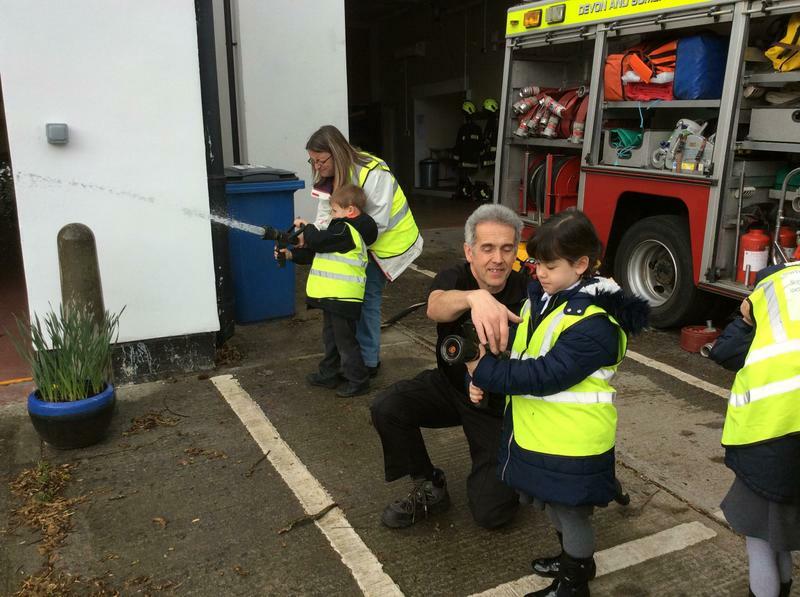 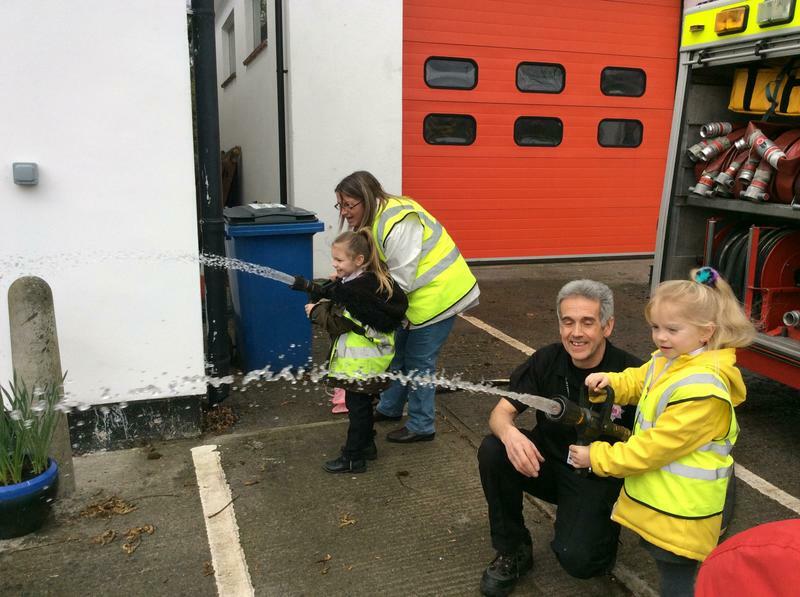 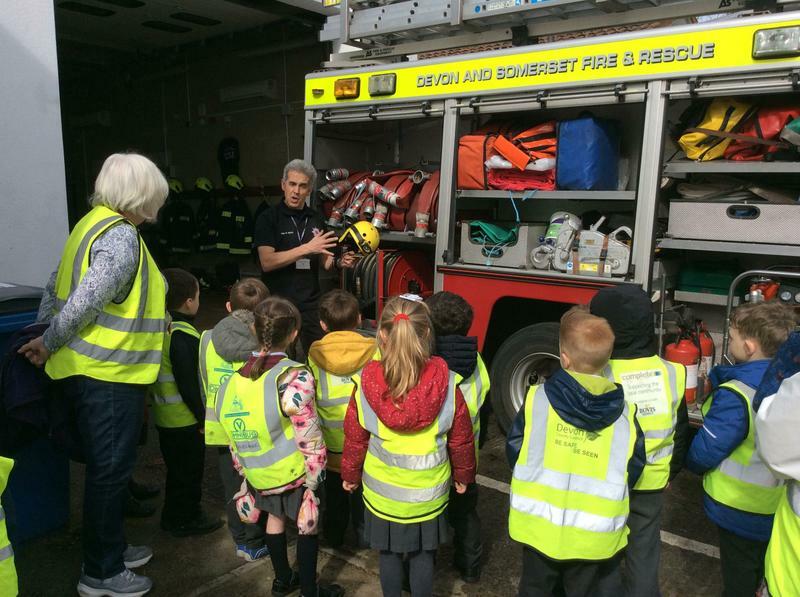 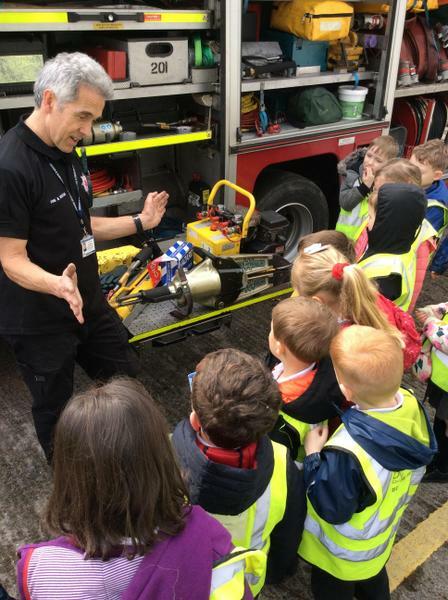 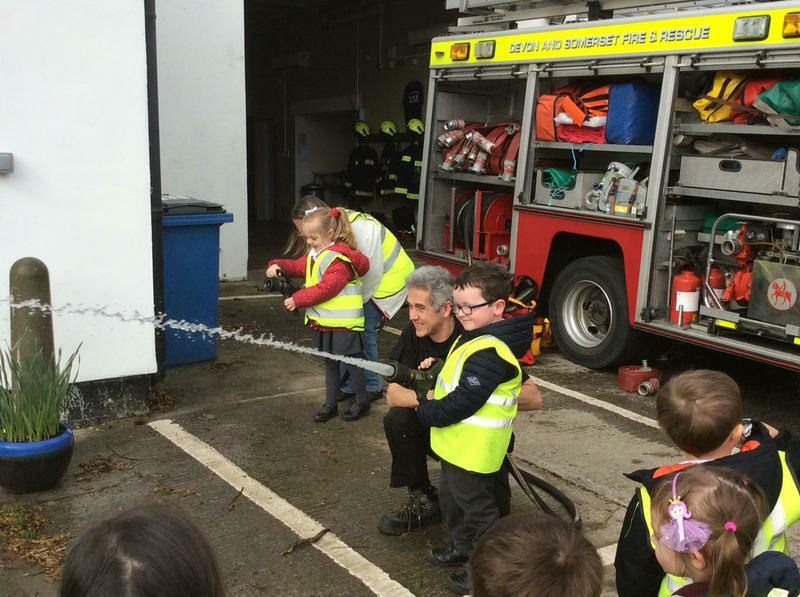 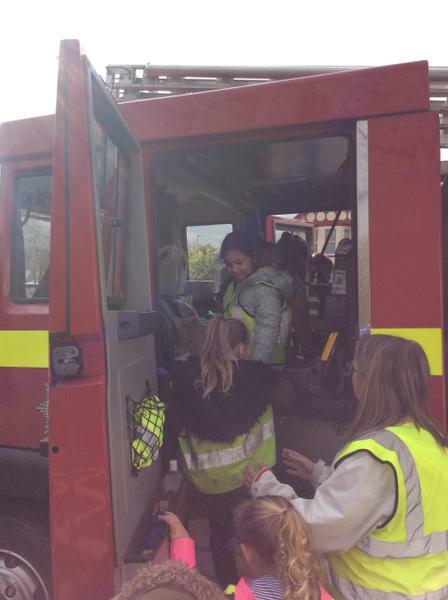 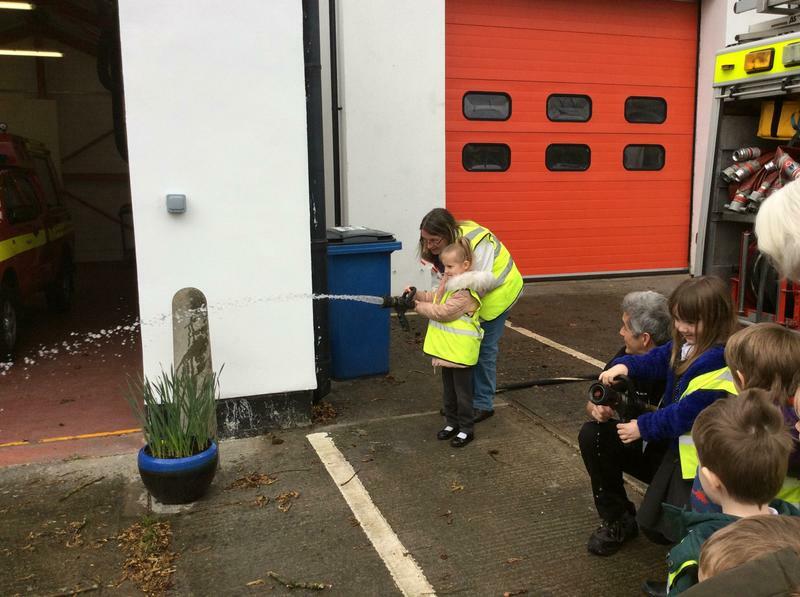 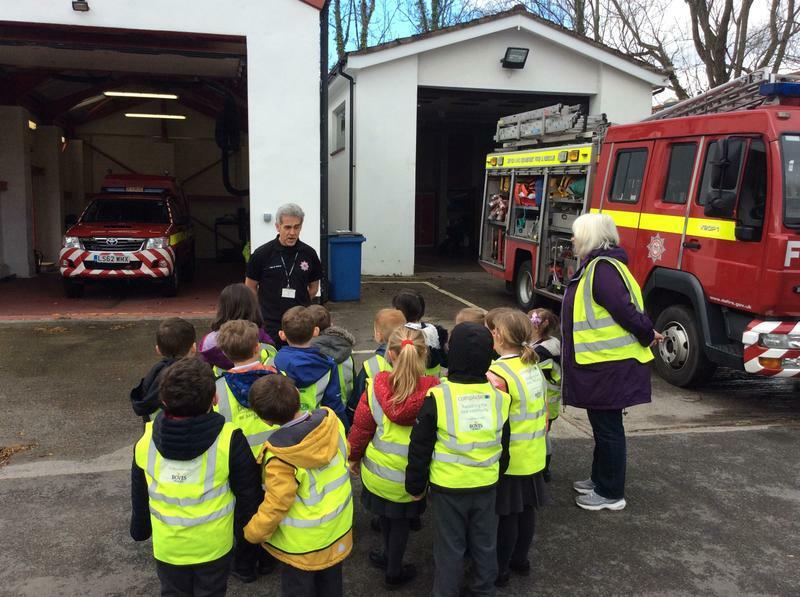 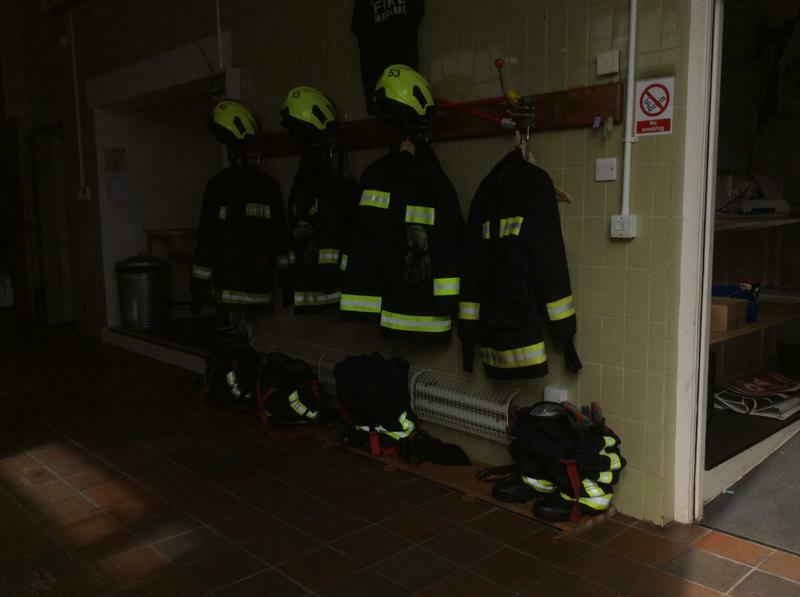 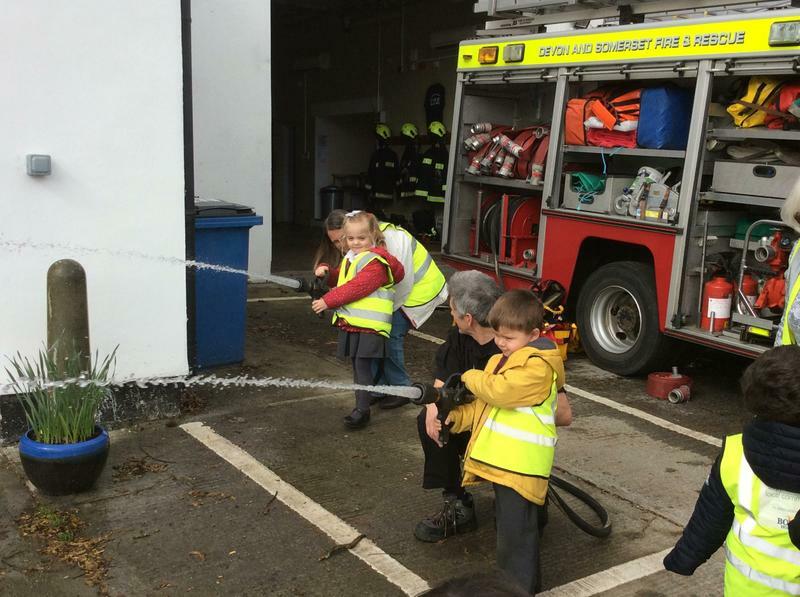 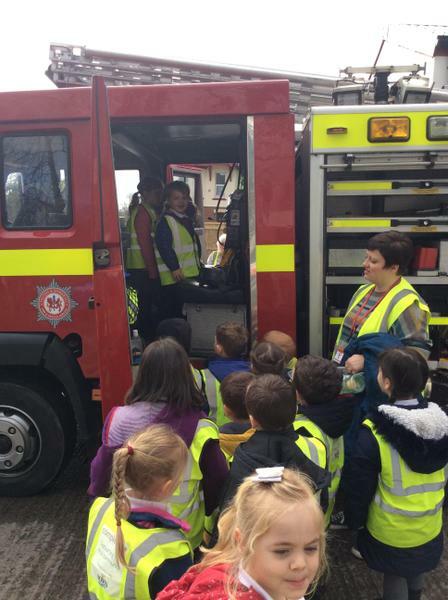 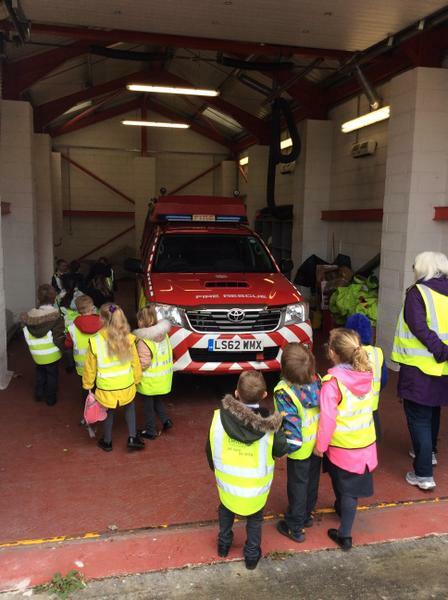 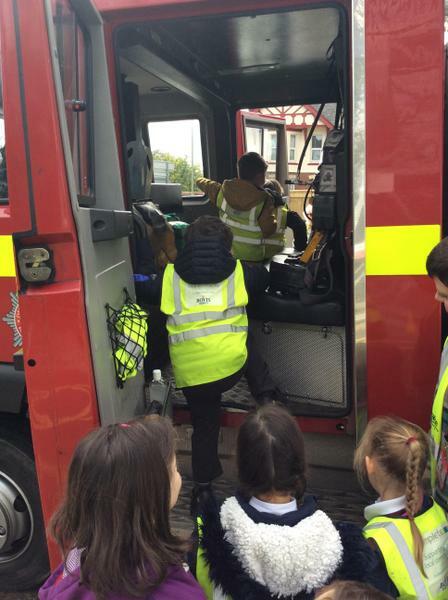 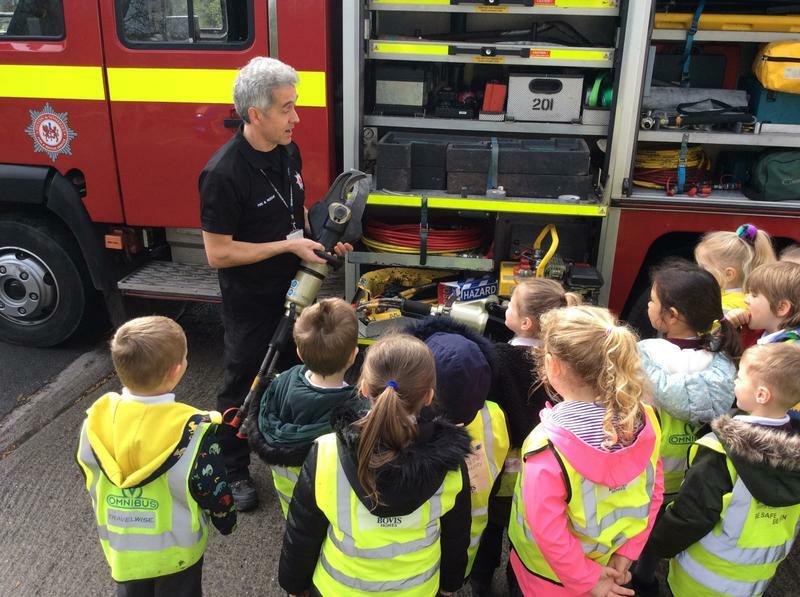 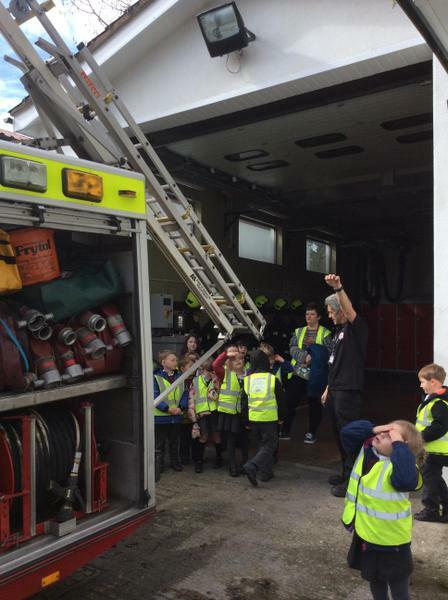 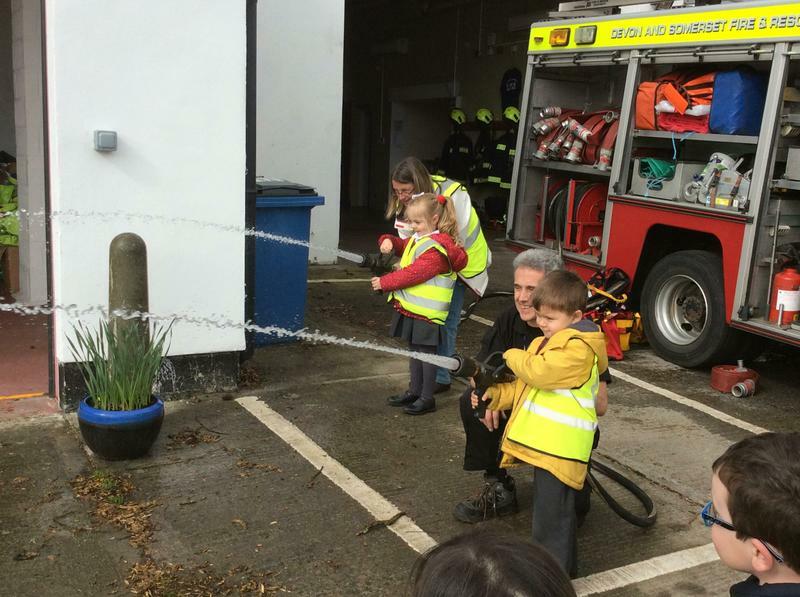 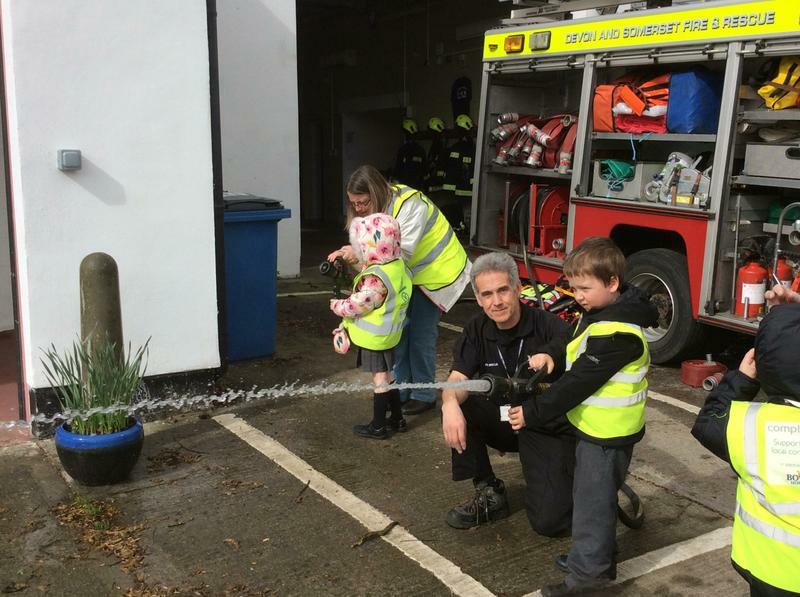 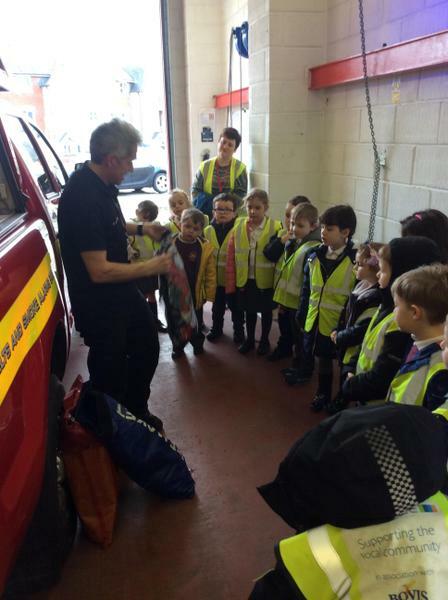 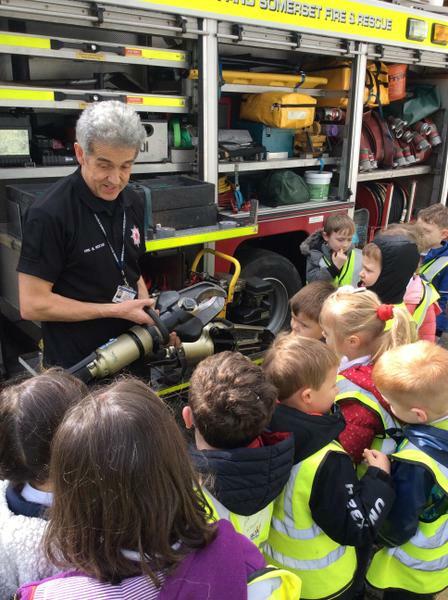 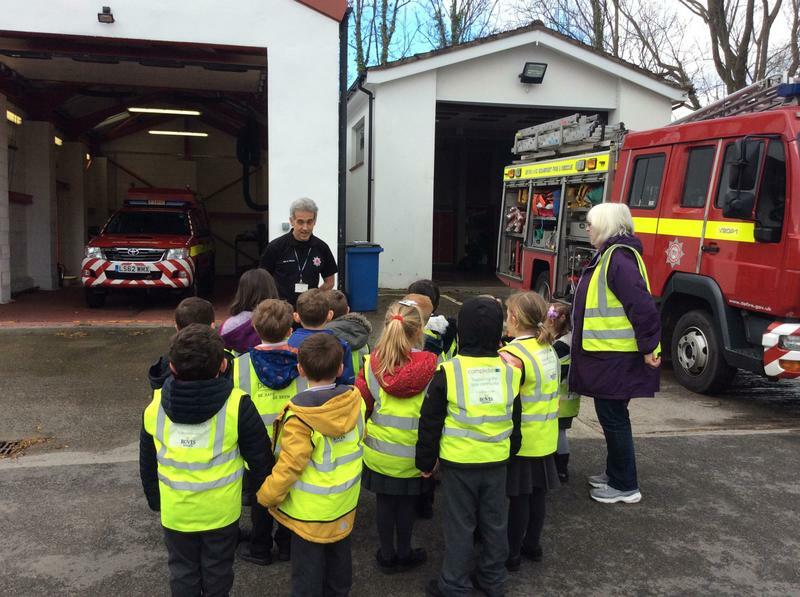 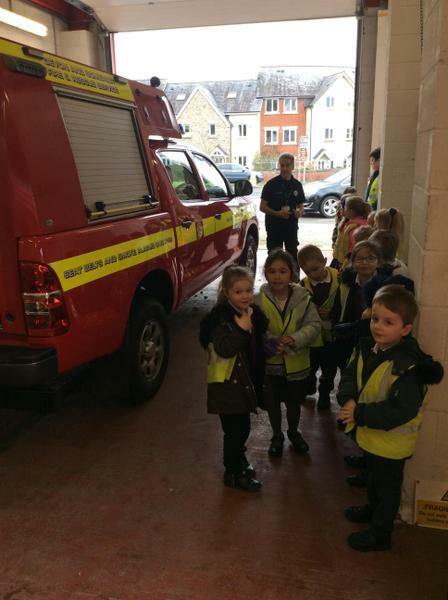 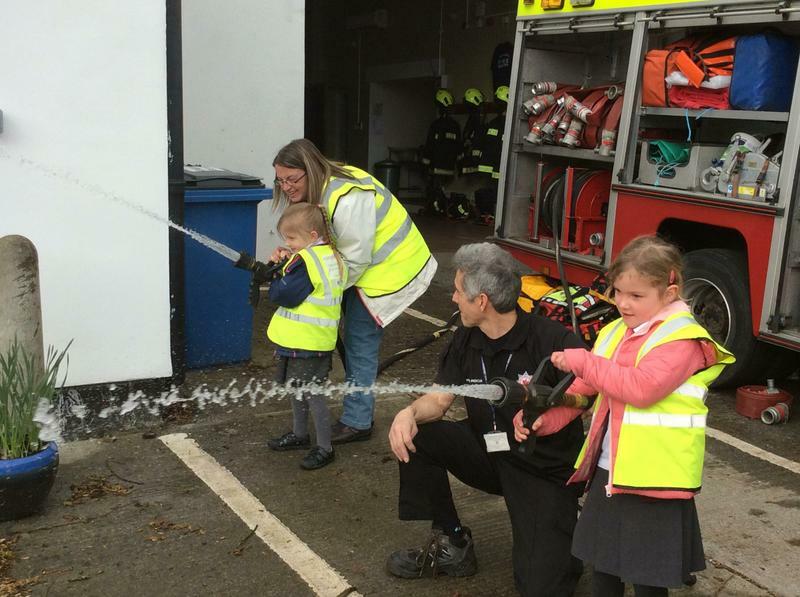 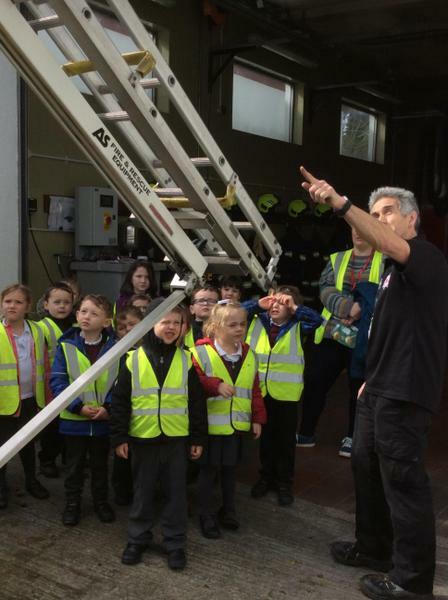 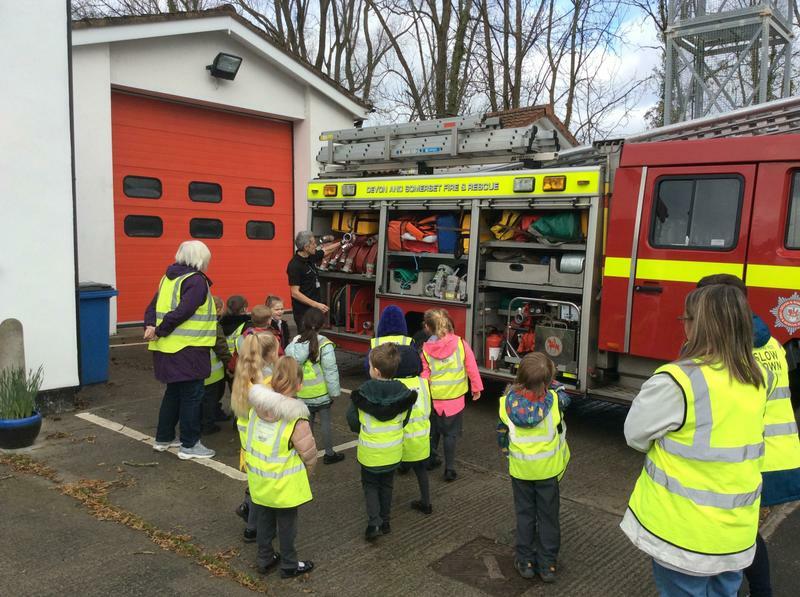 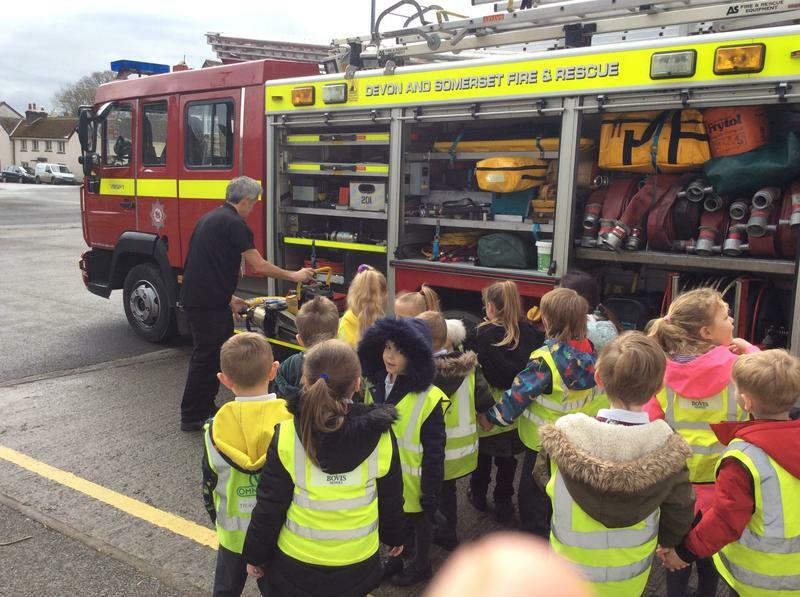 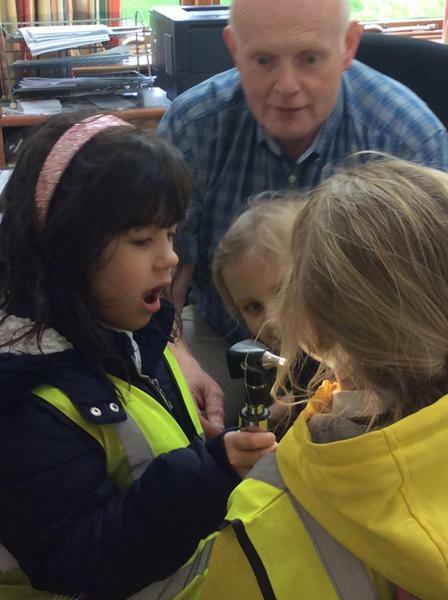 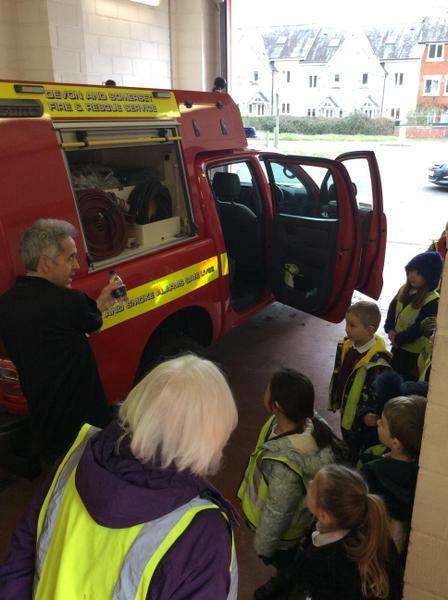 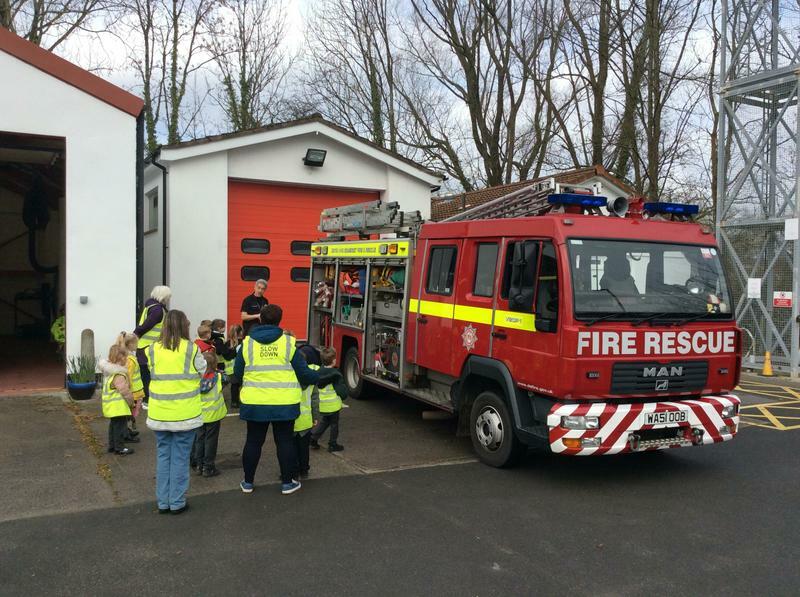 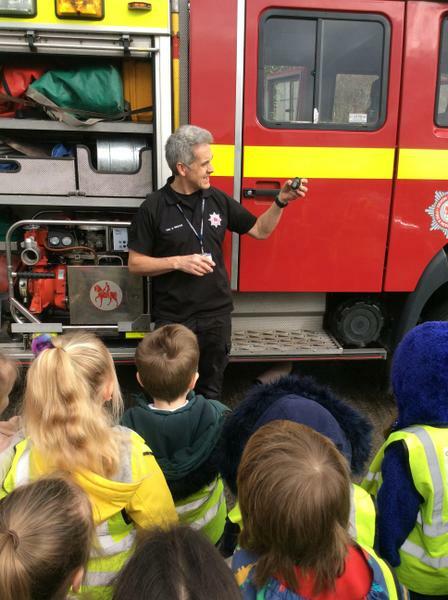 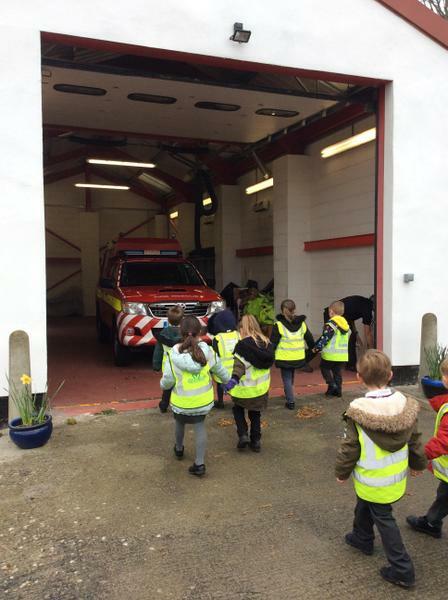 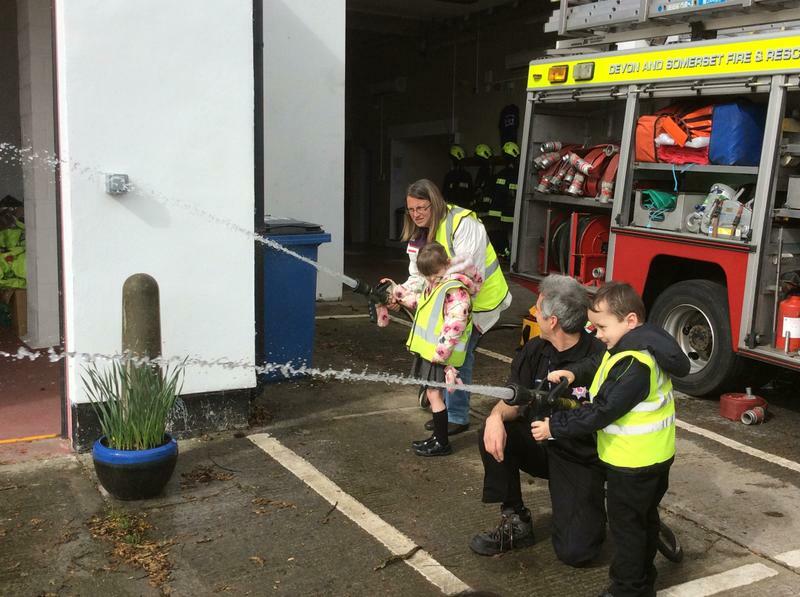 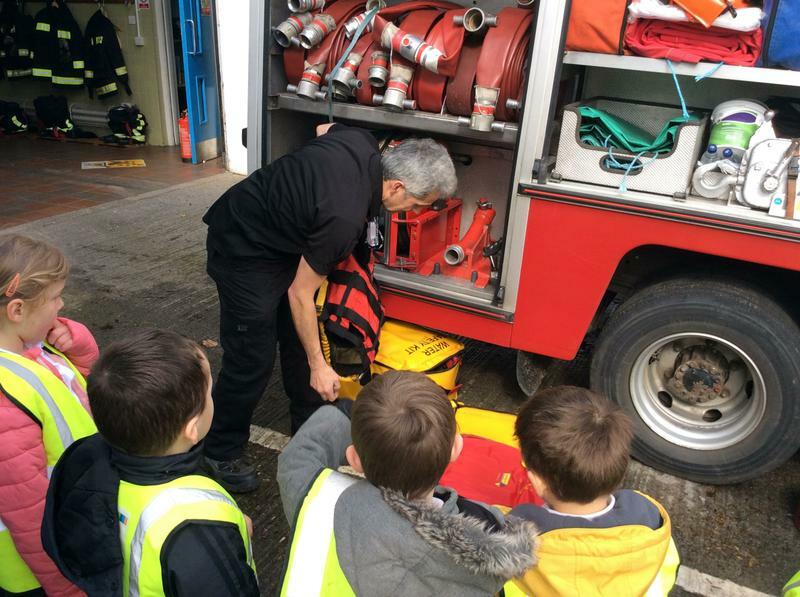 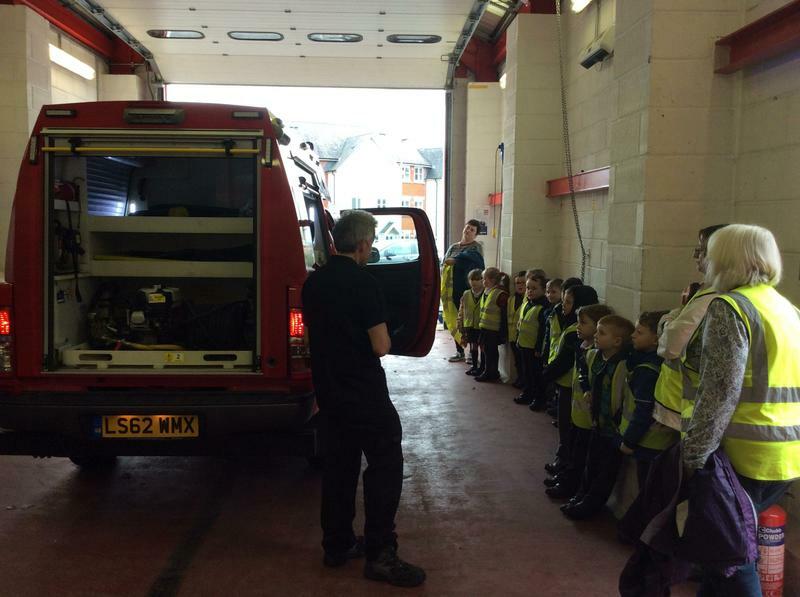 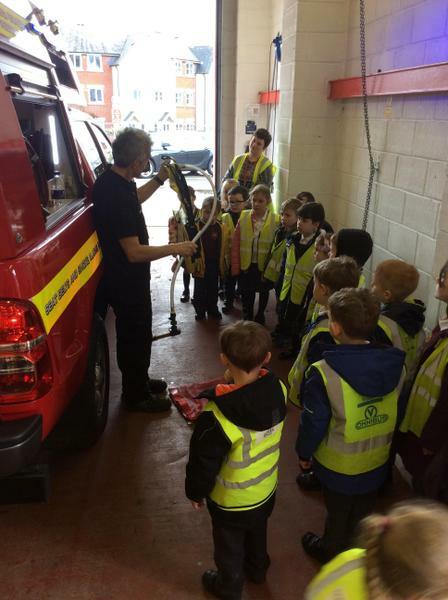 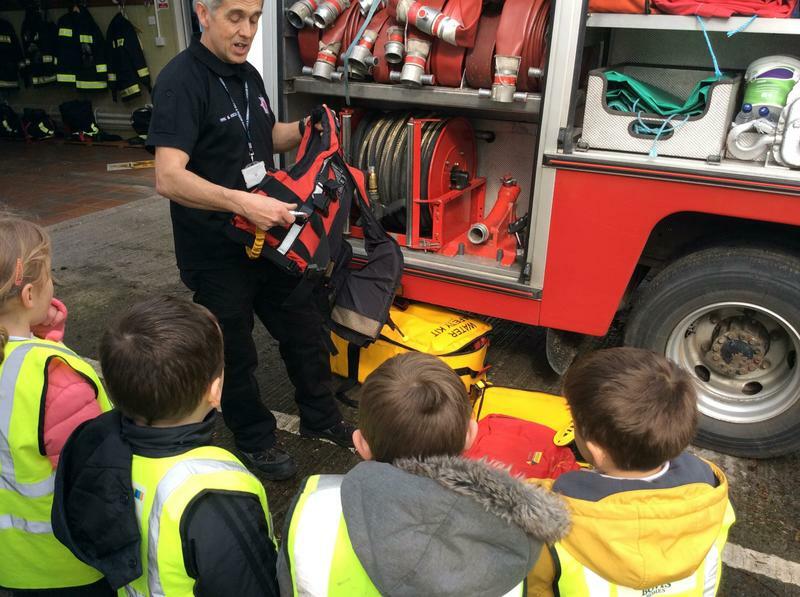 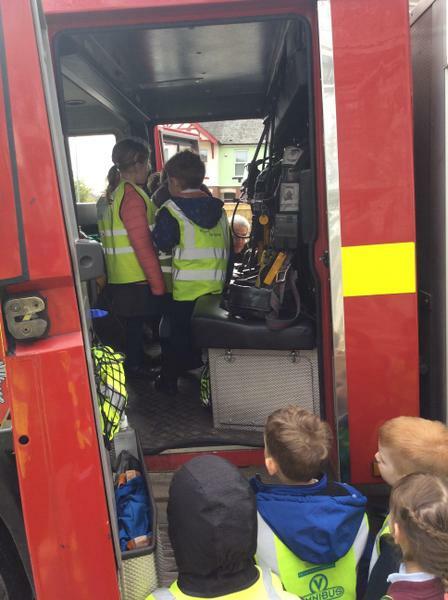 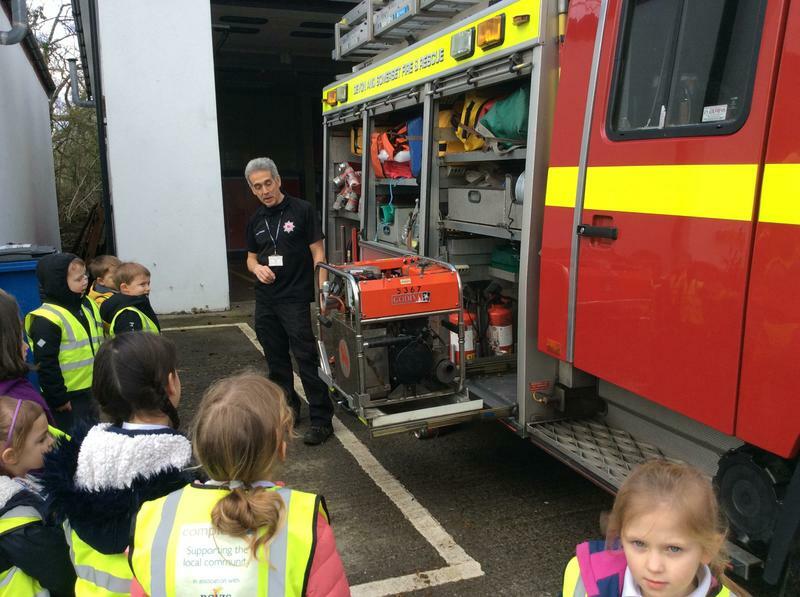 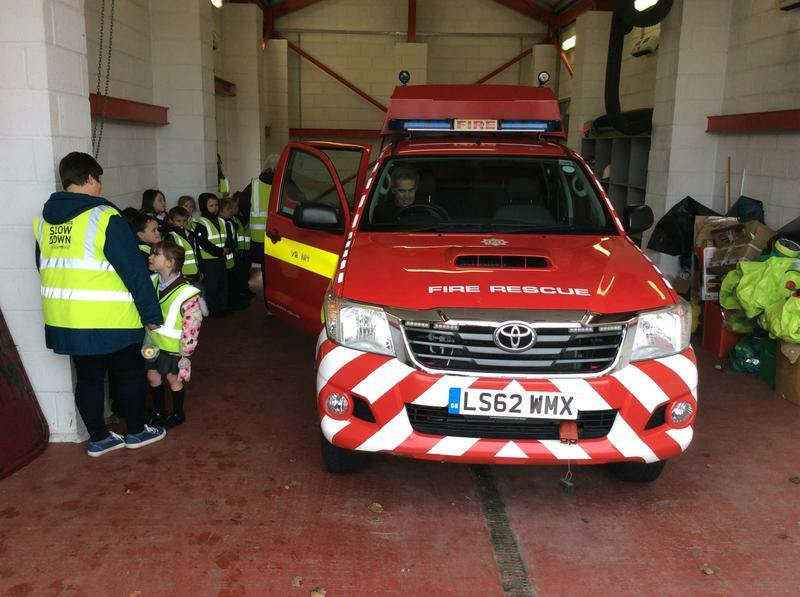 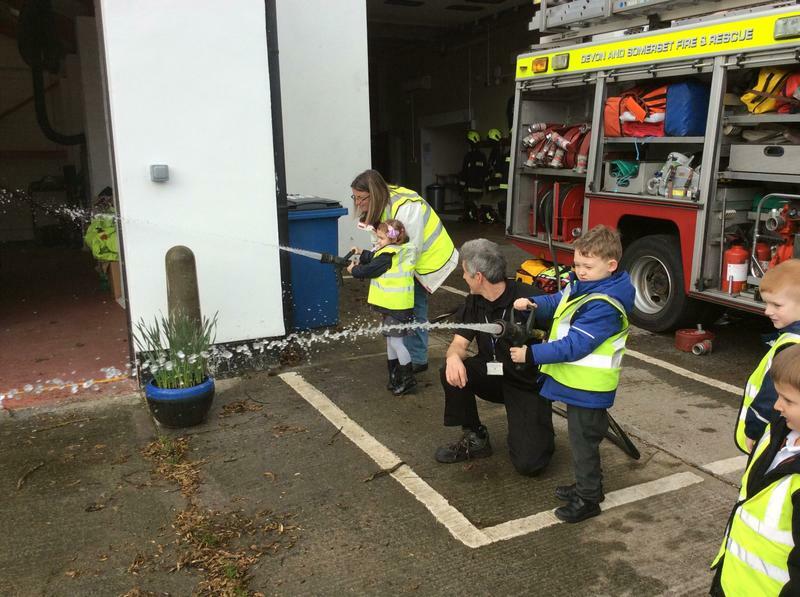 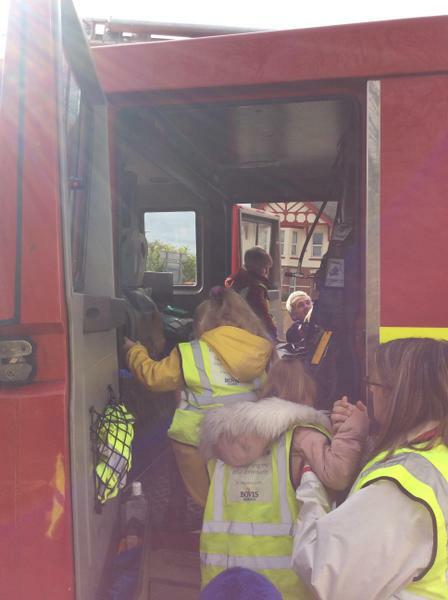 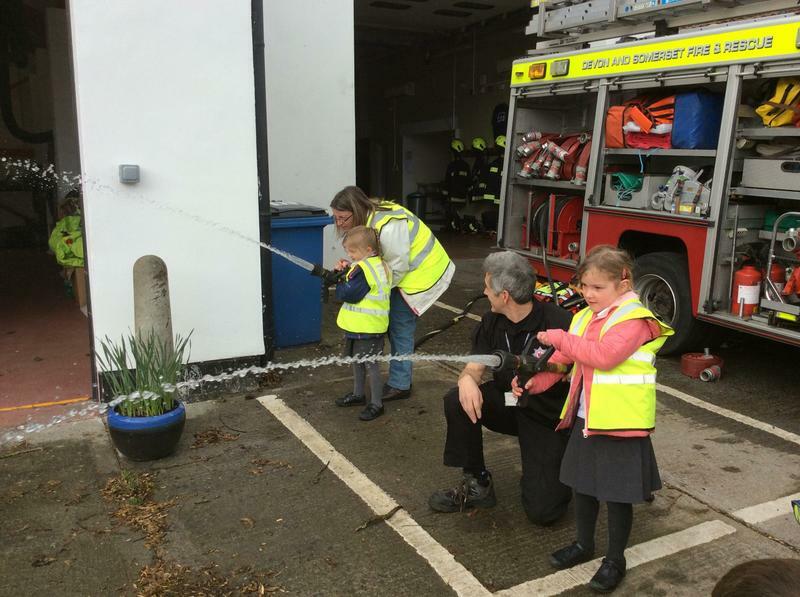 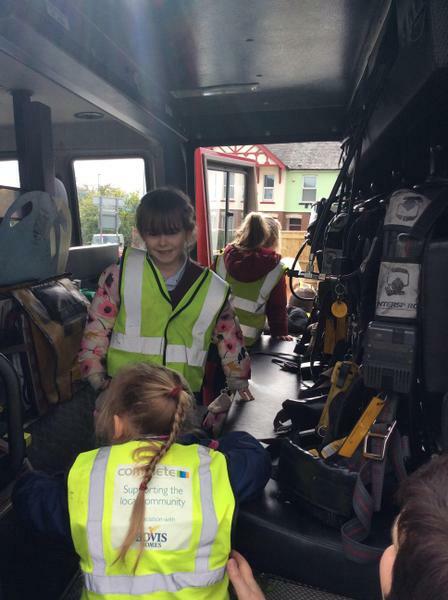 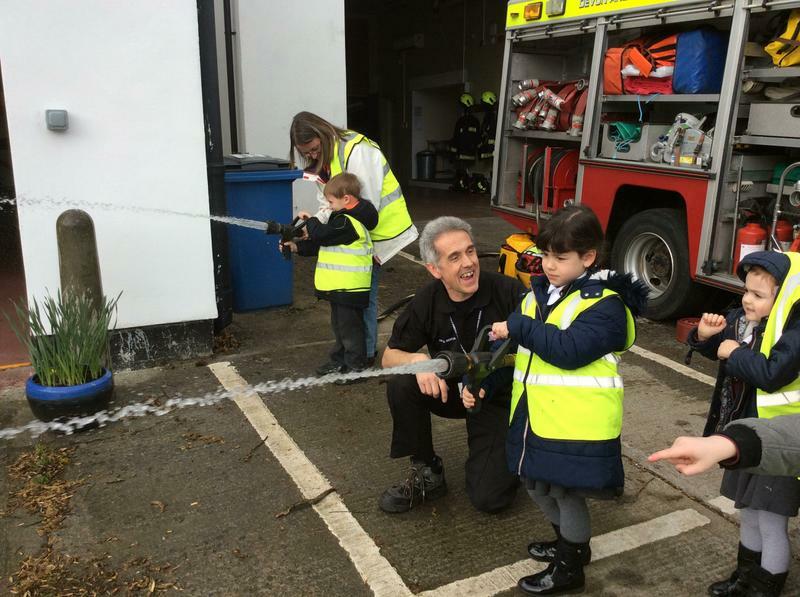 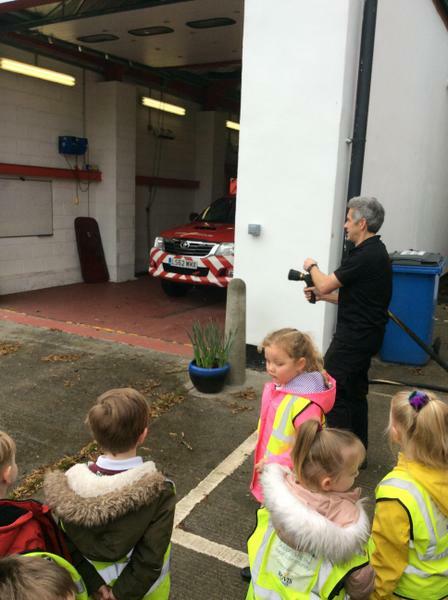 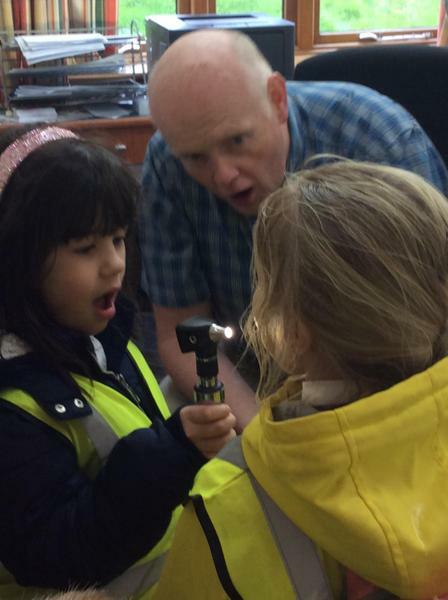 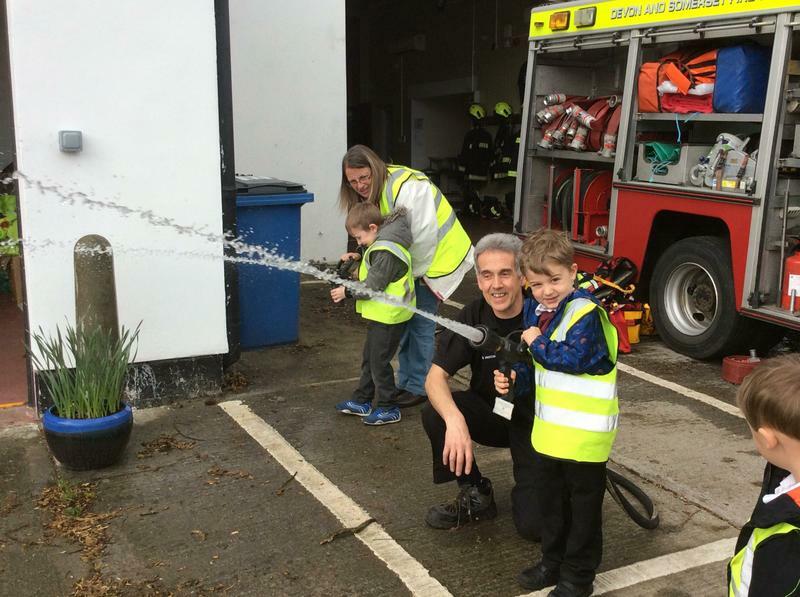 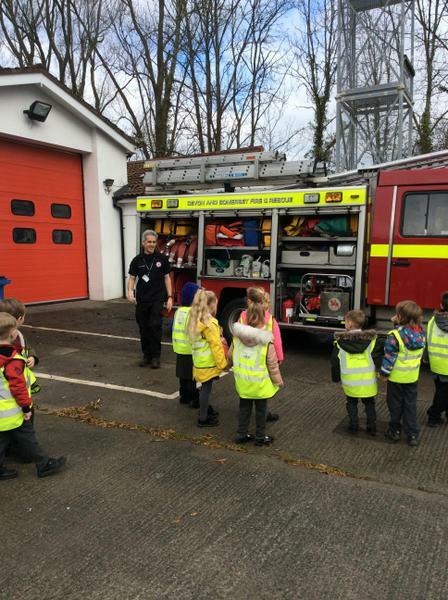 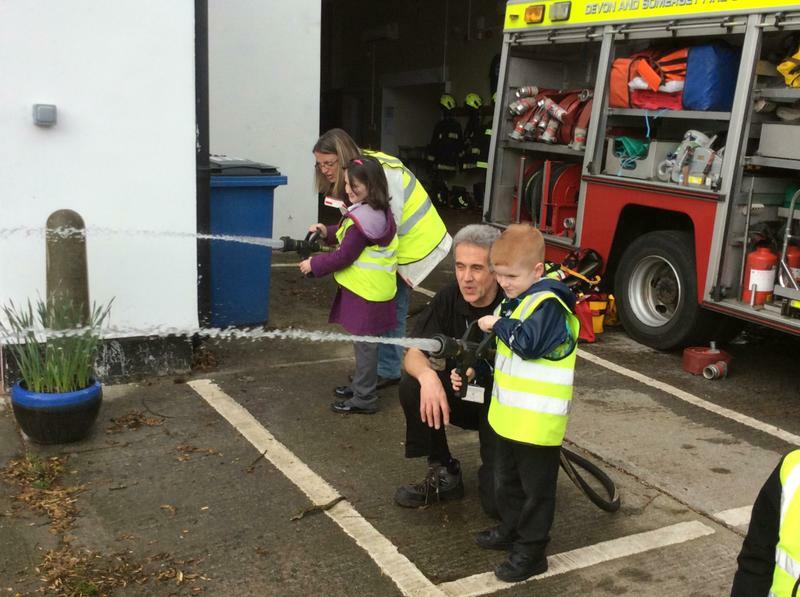 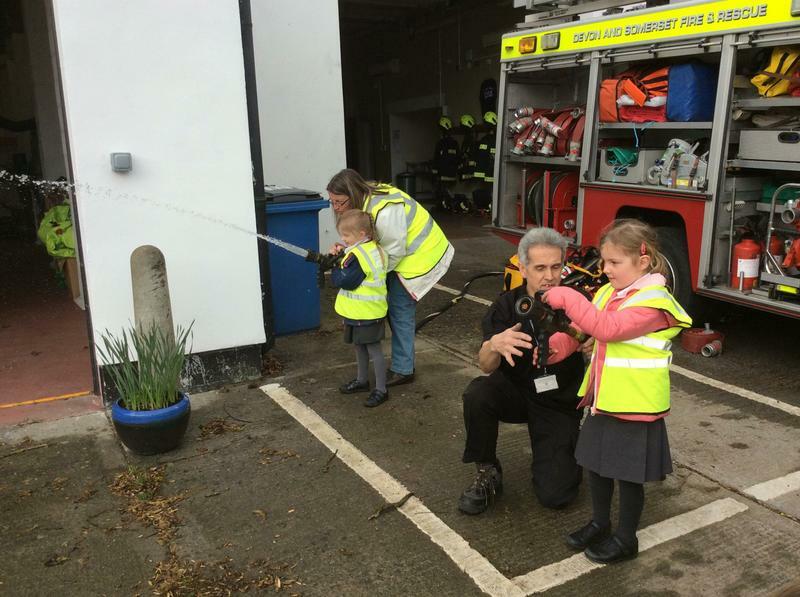 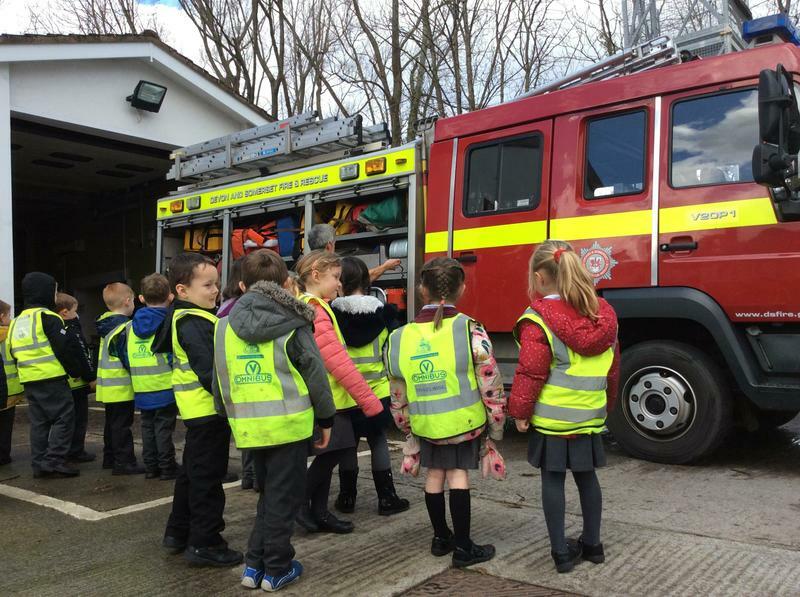 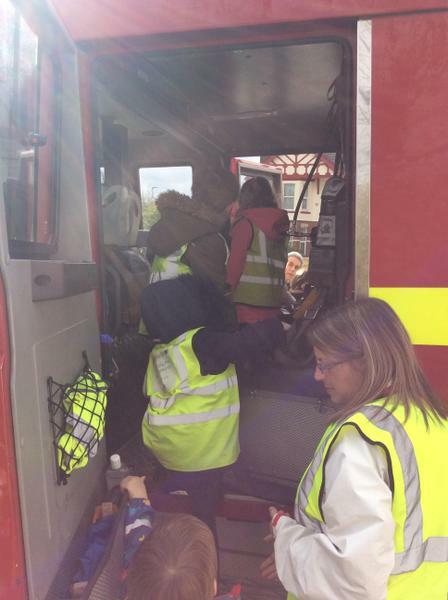 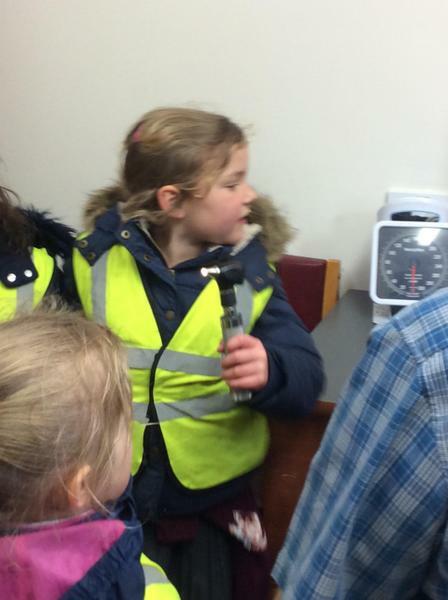 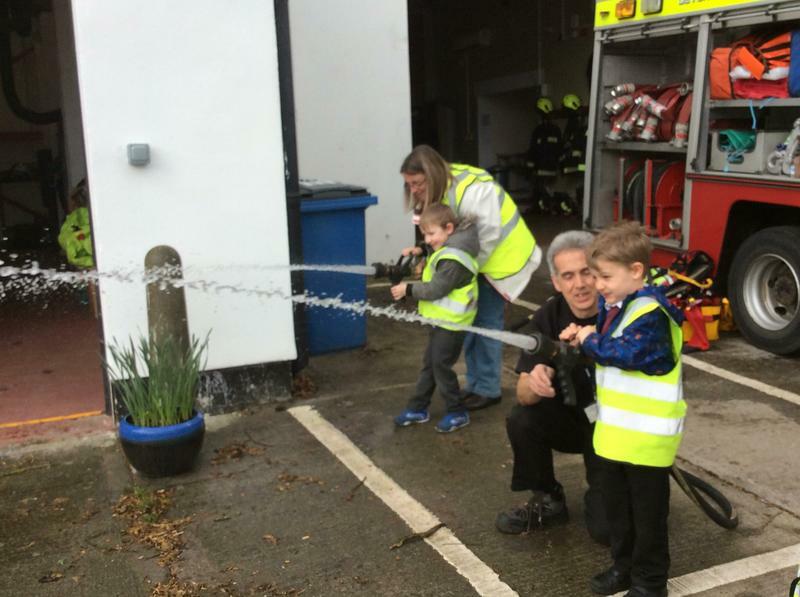 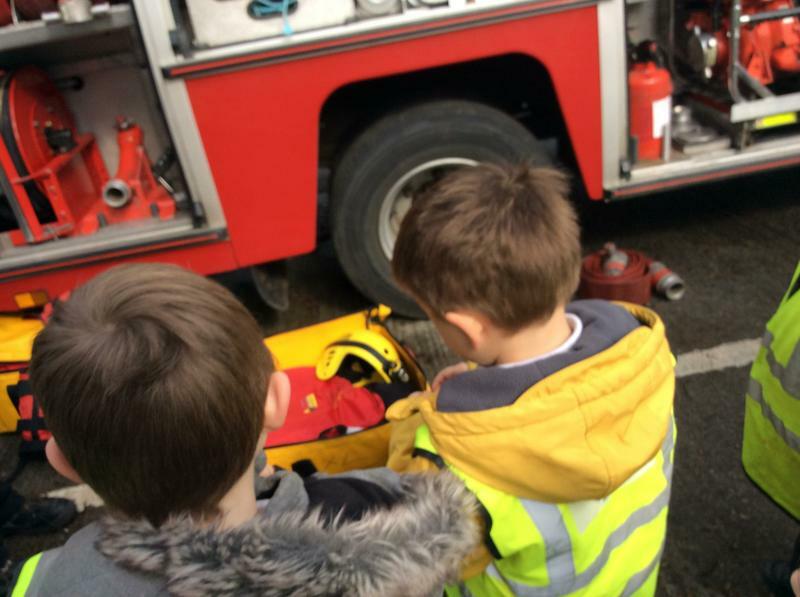 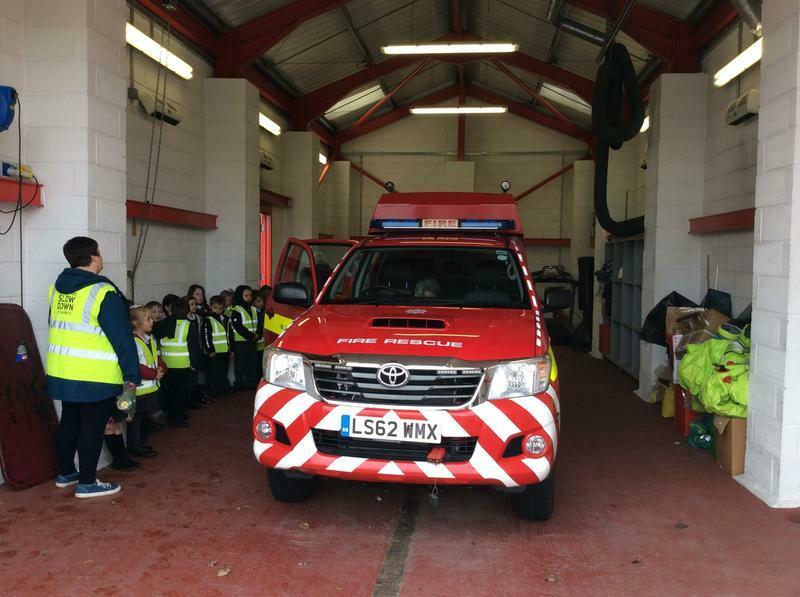 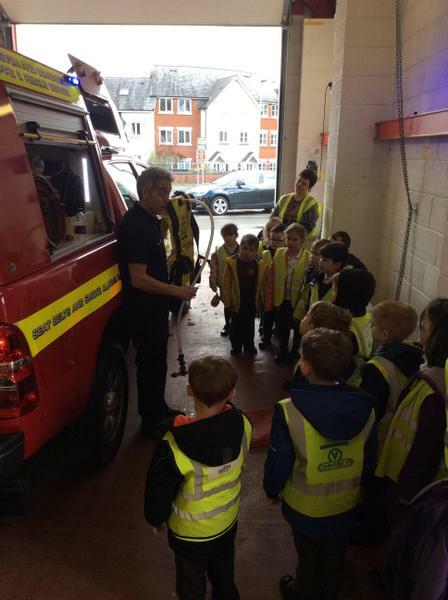 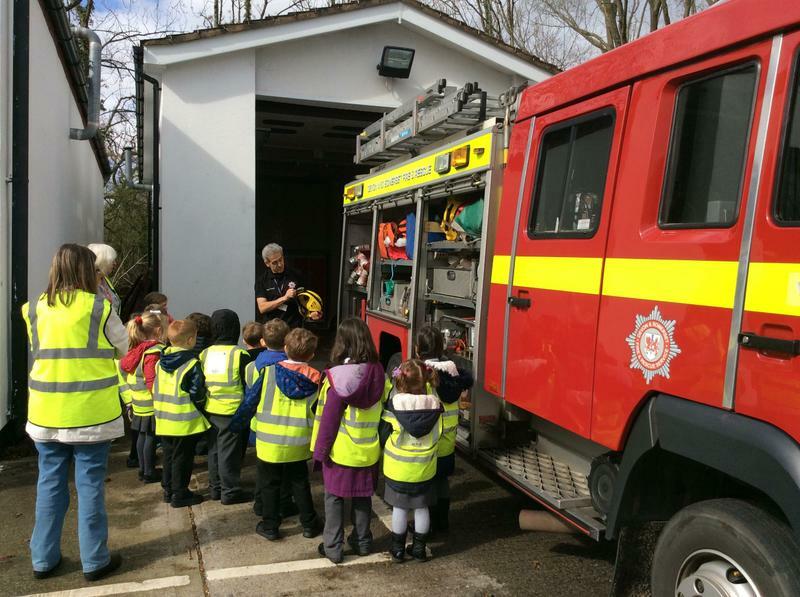 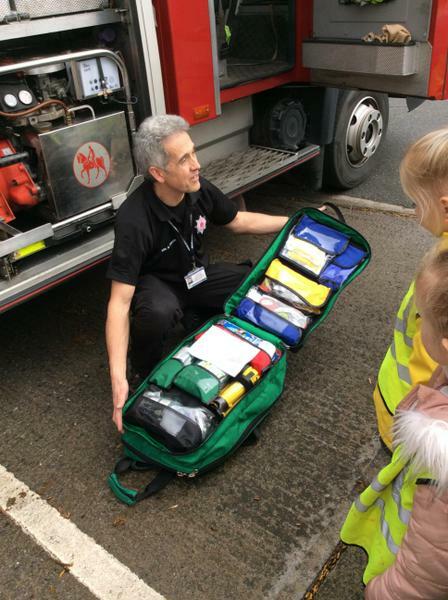 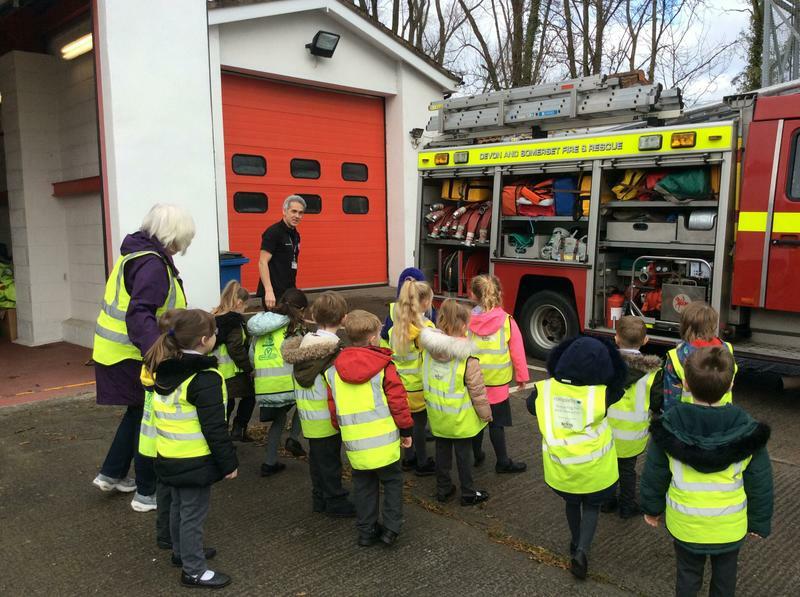 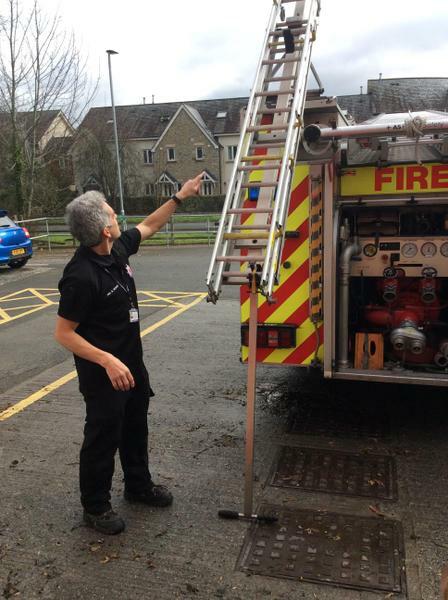 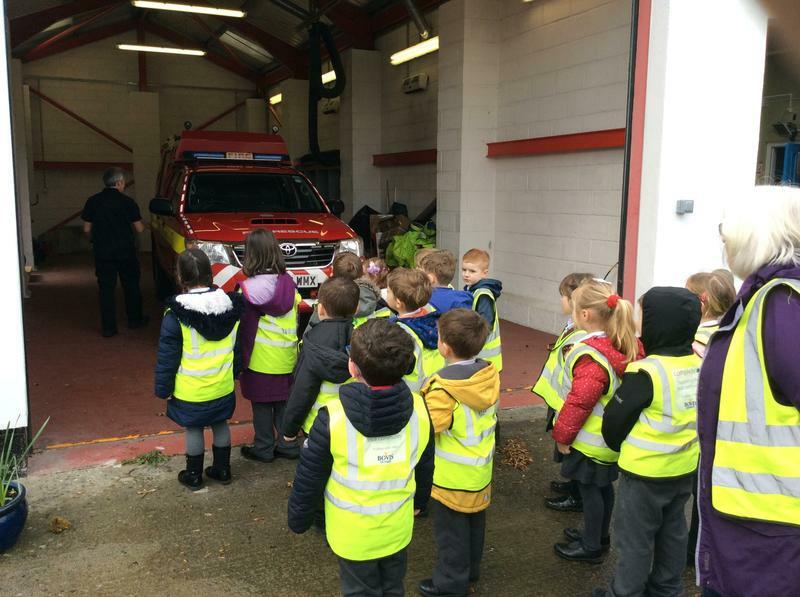 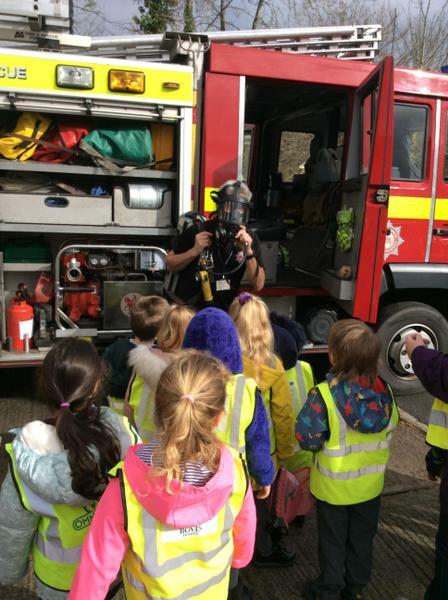 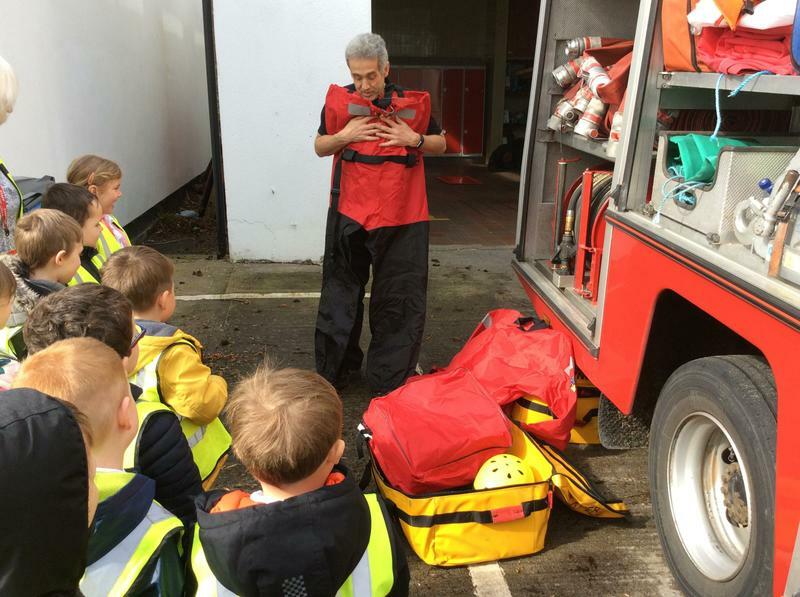 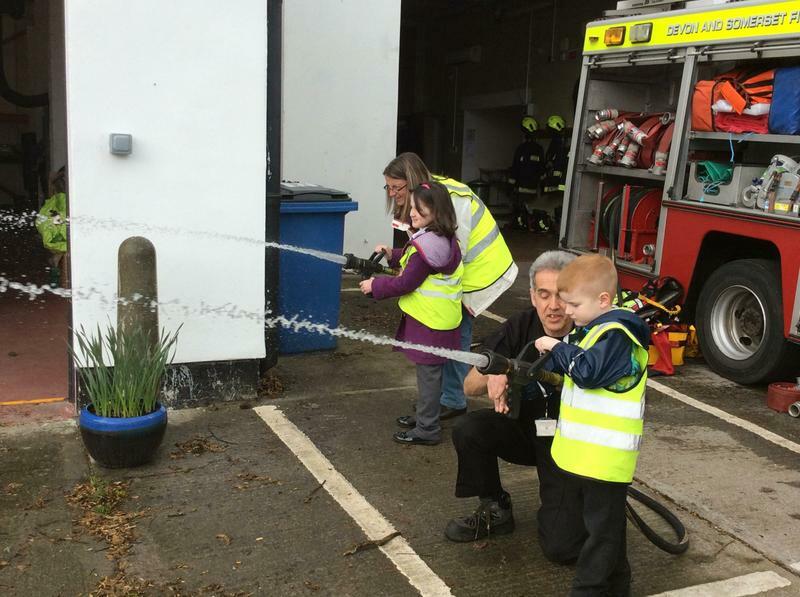 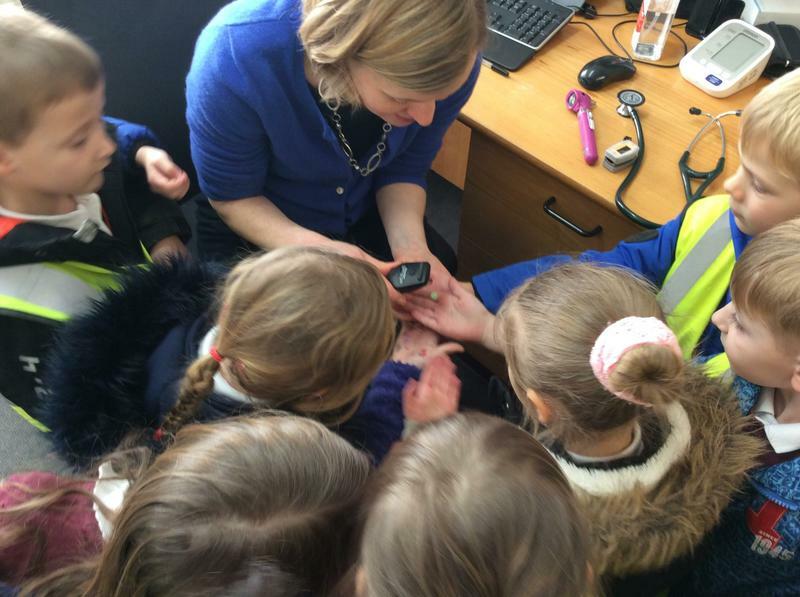 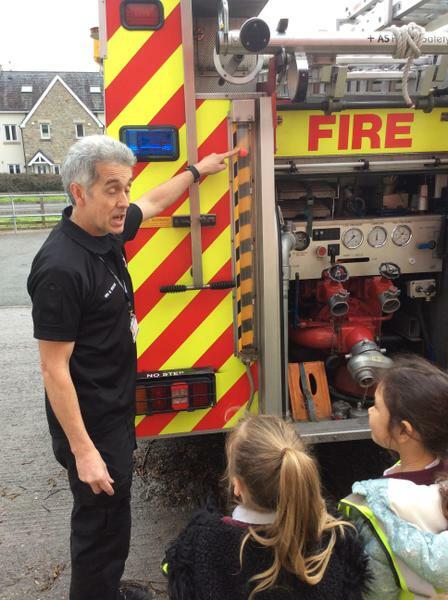 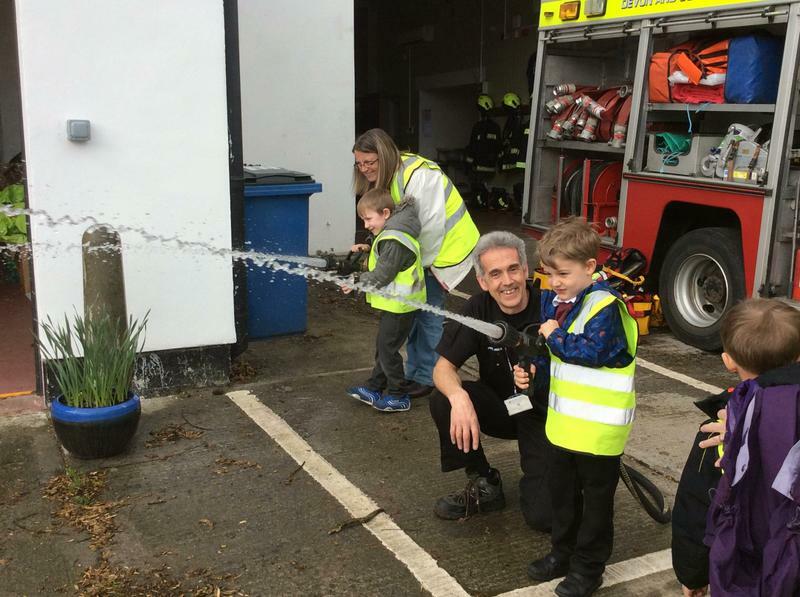 What a treat for the Bovey Explorers this week when we headed off to the fire station. 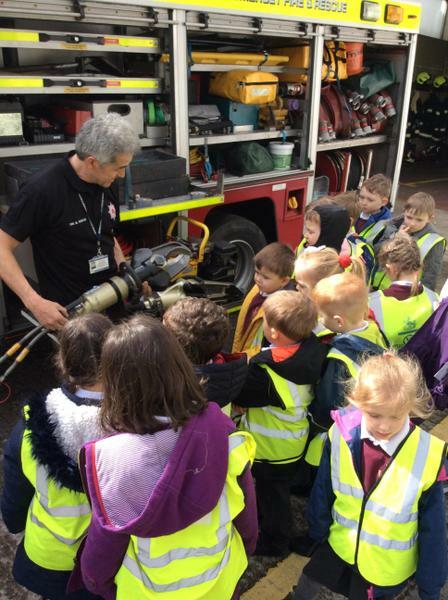 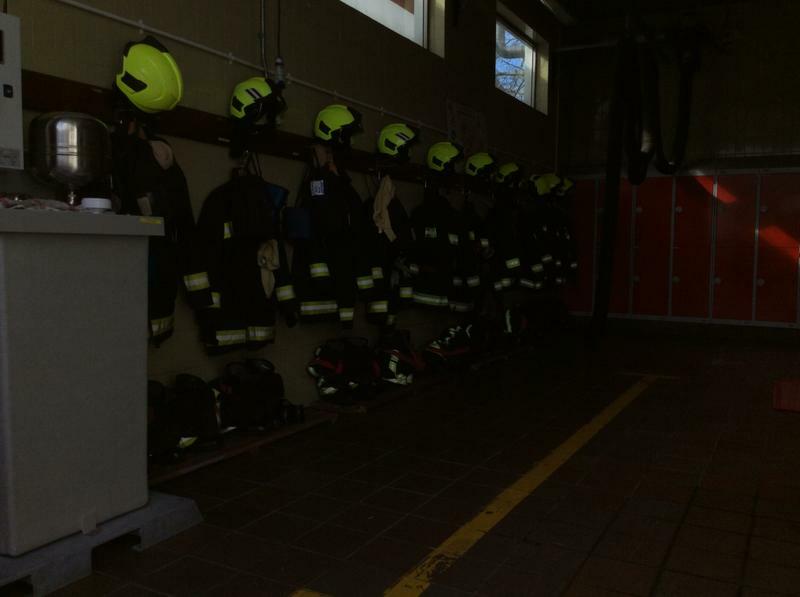 We met up with Fire-fighter Moore who taught us all about the life of a fire-fighter. 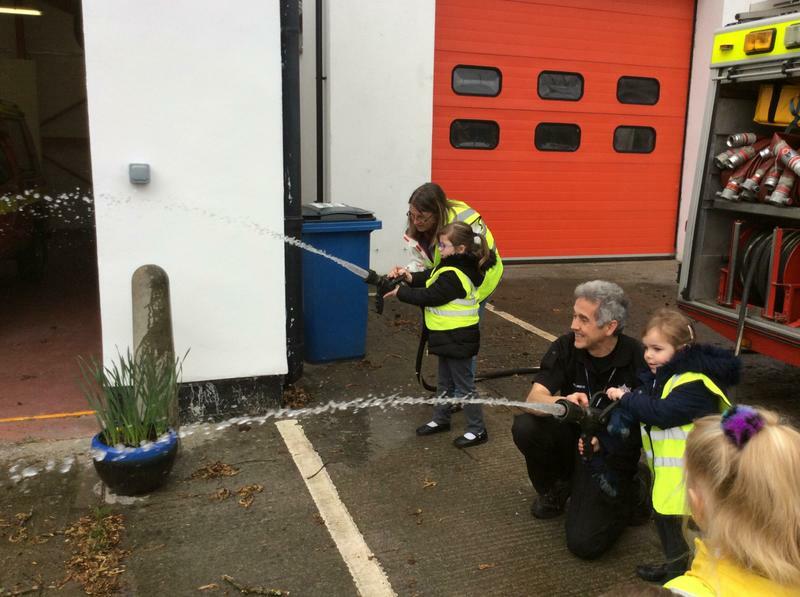 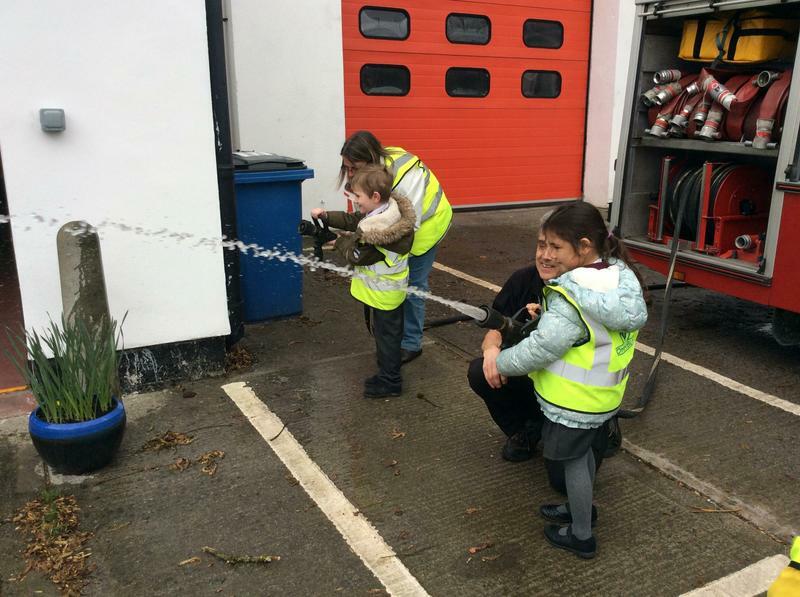 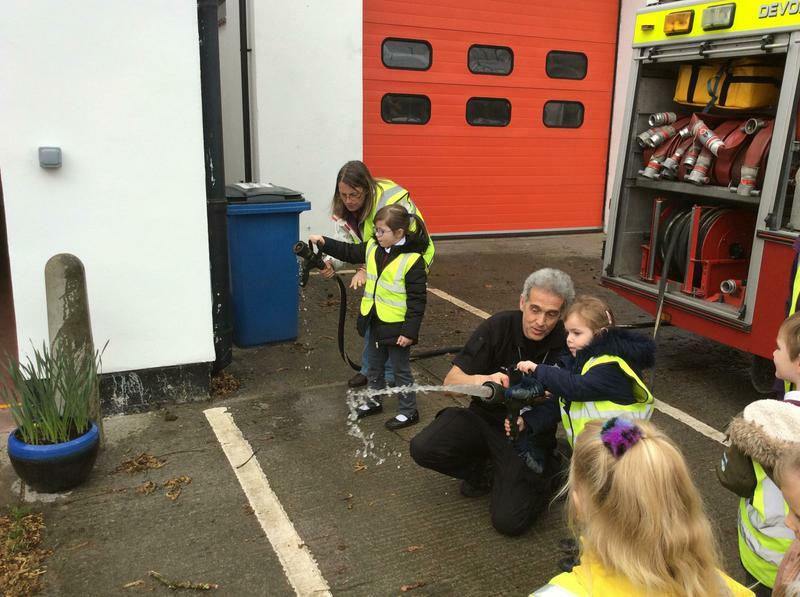 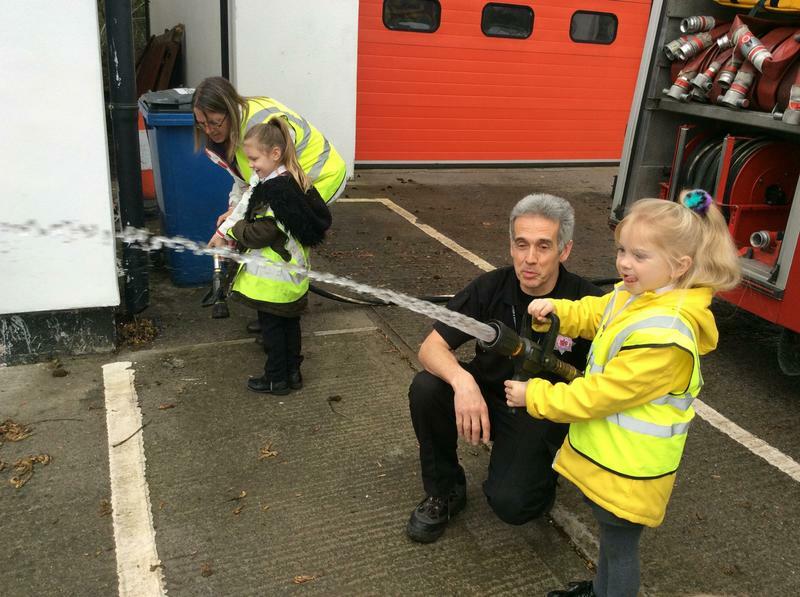 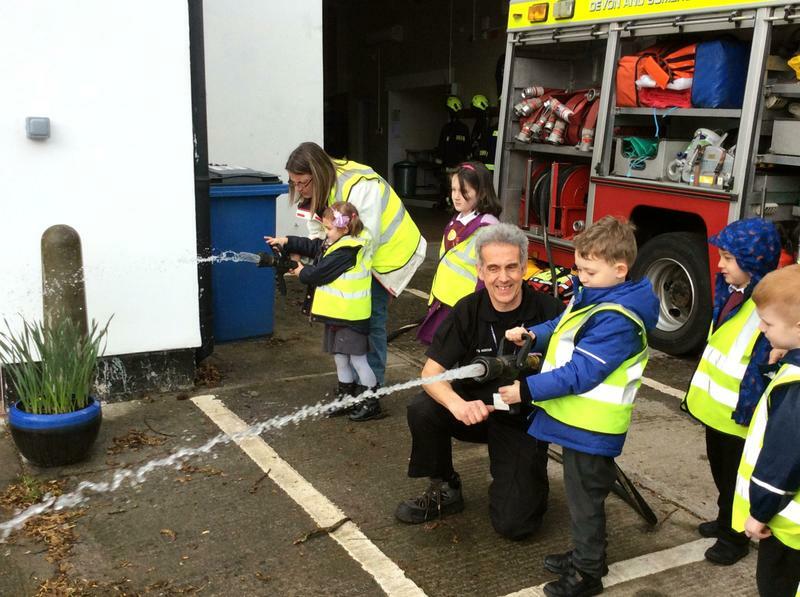 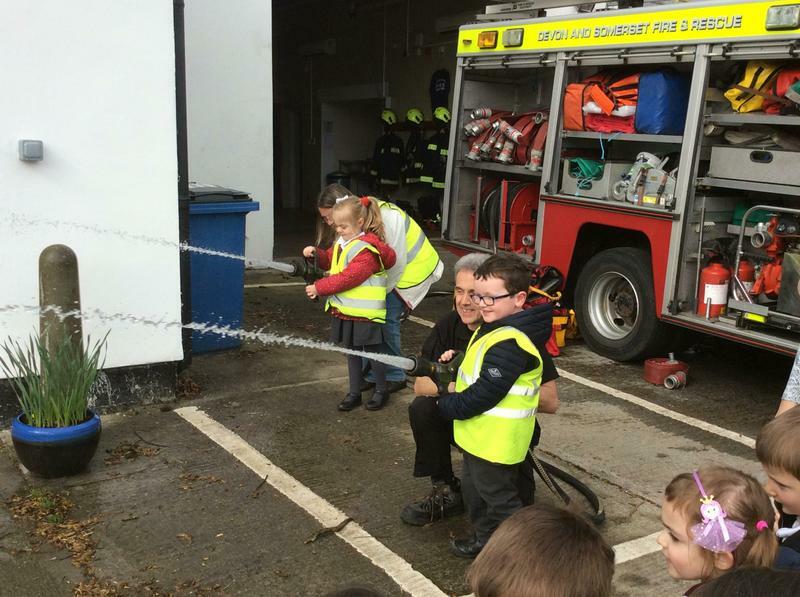 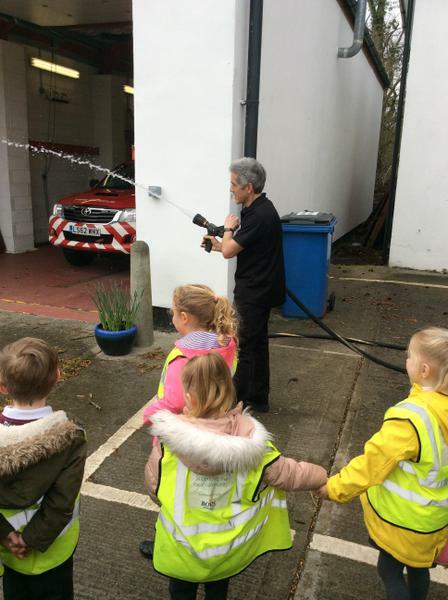 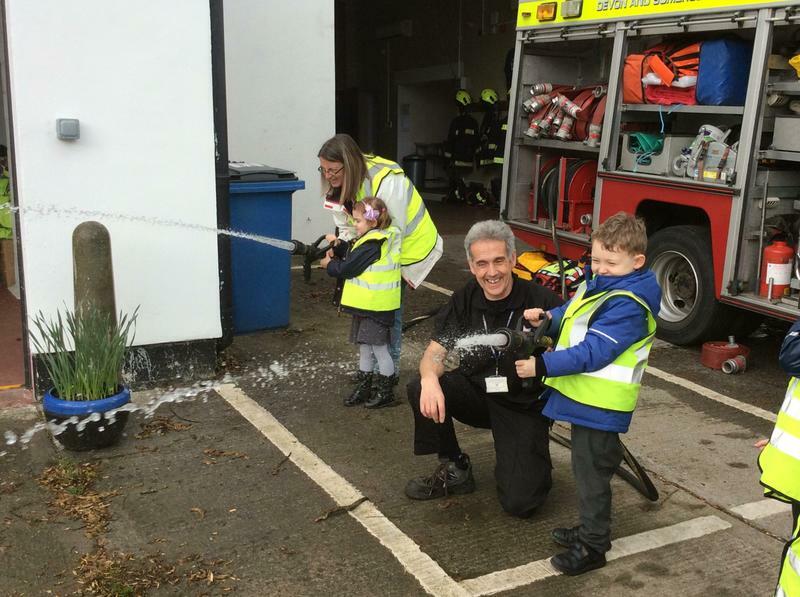 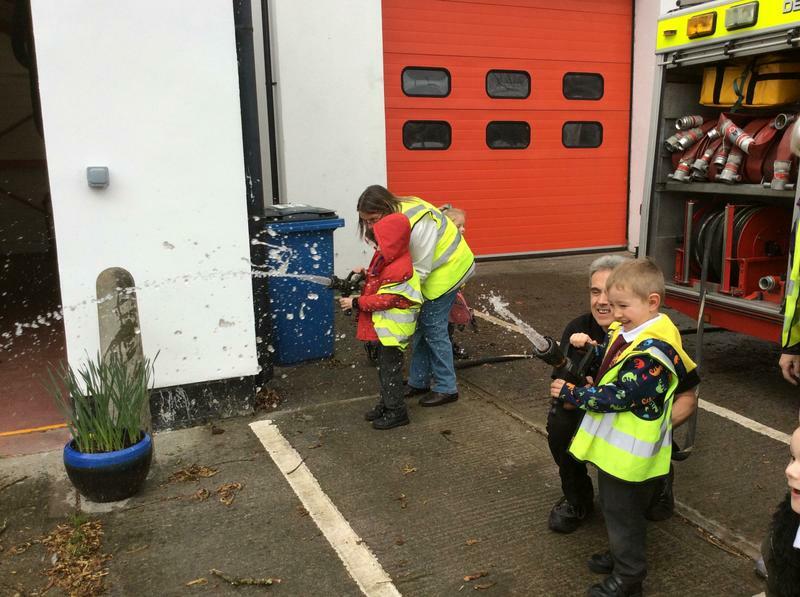 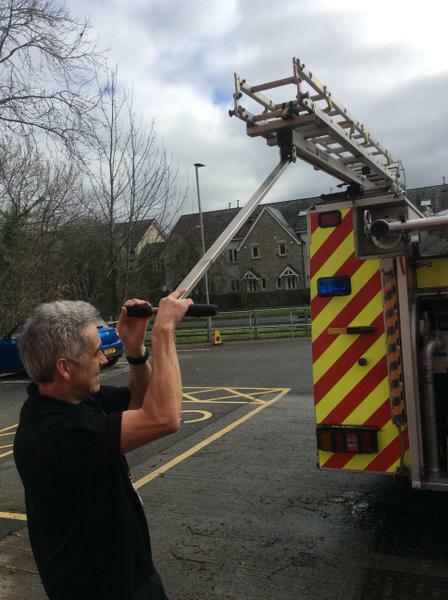 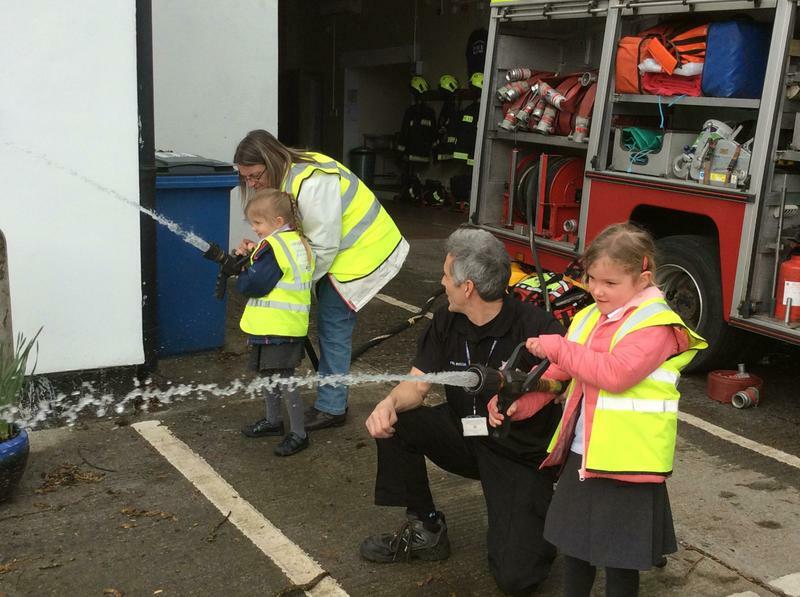 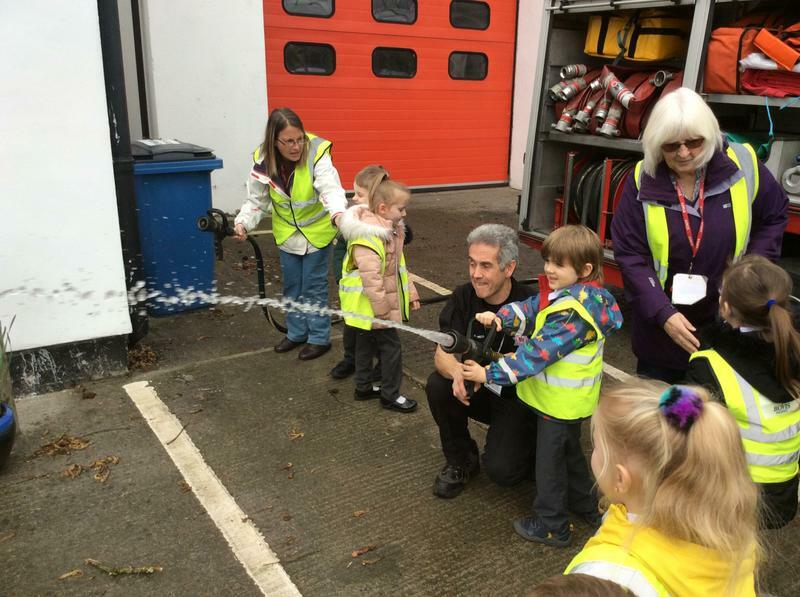 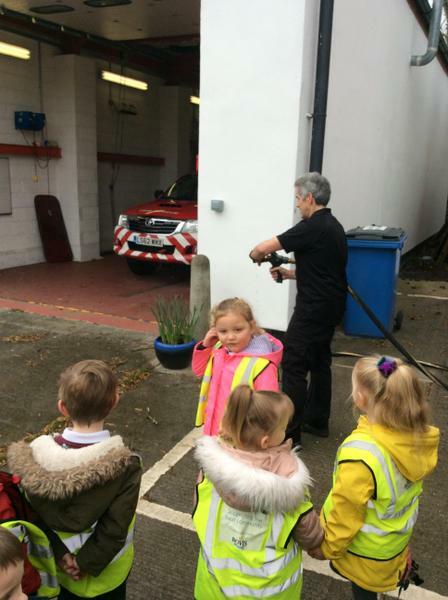 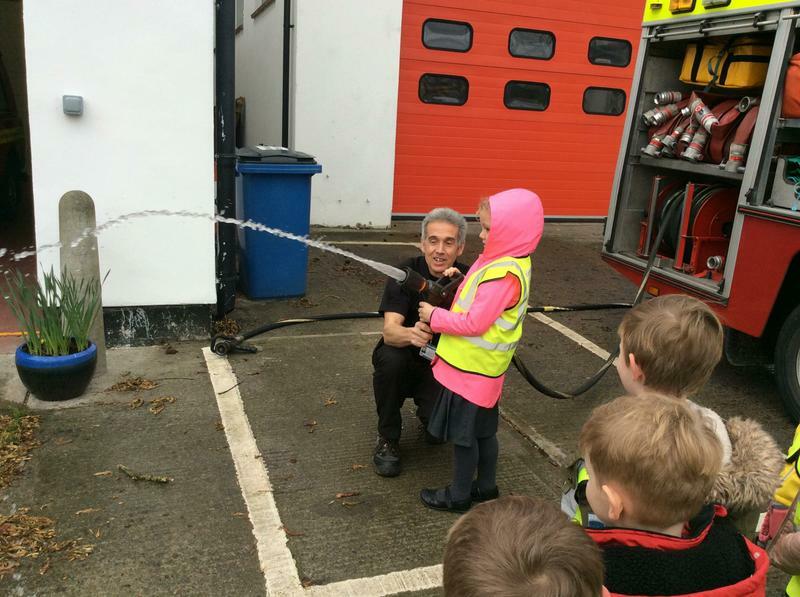 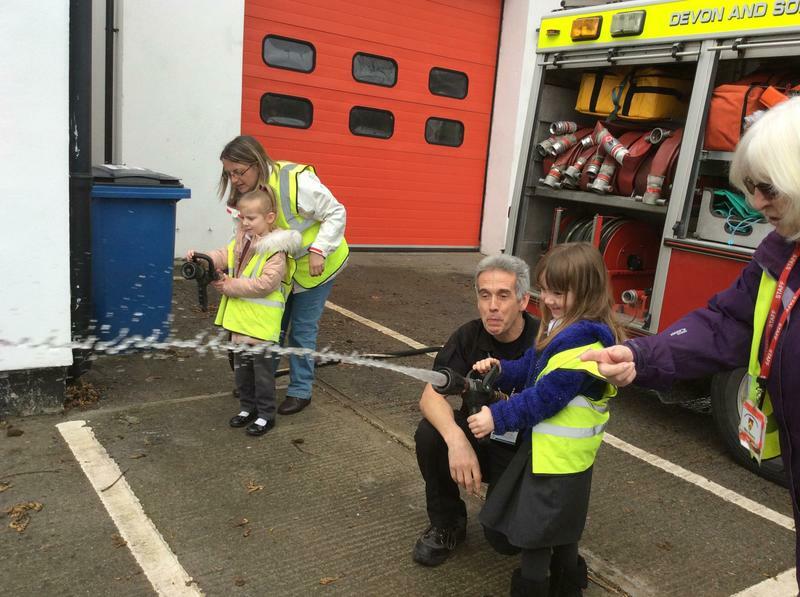 We all loved playing in the fire engine and the best bit of all.... squirting the hose! 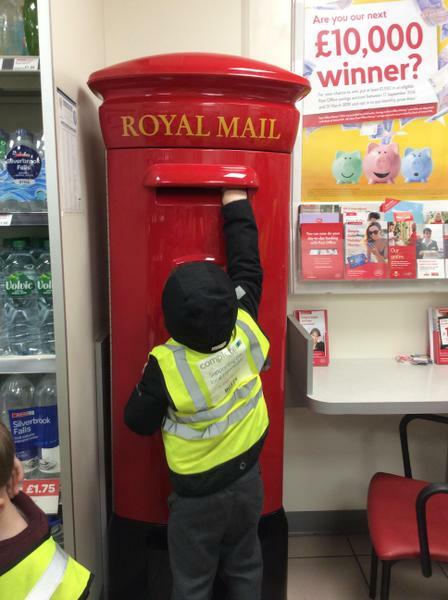 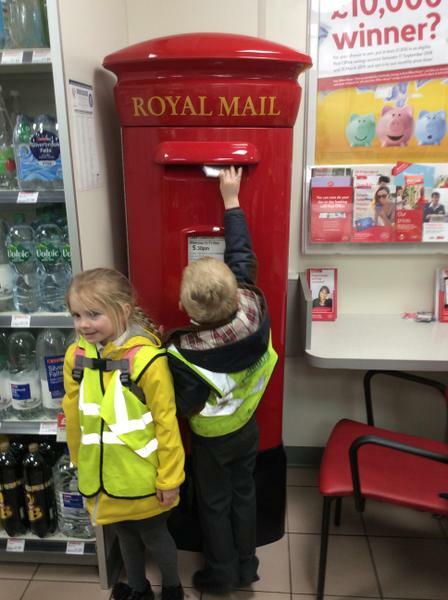 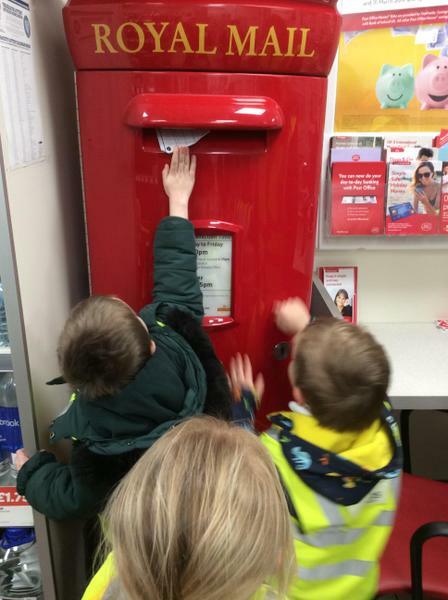 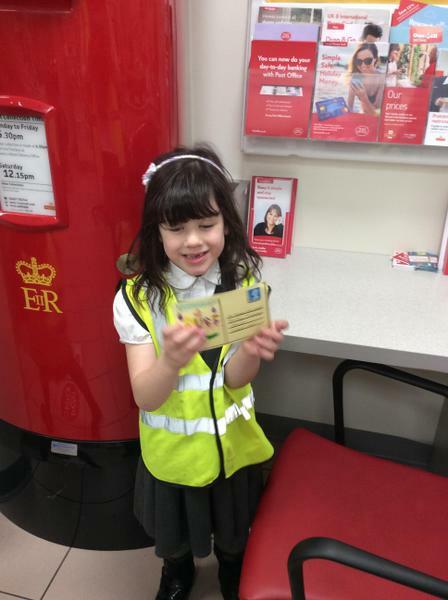 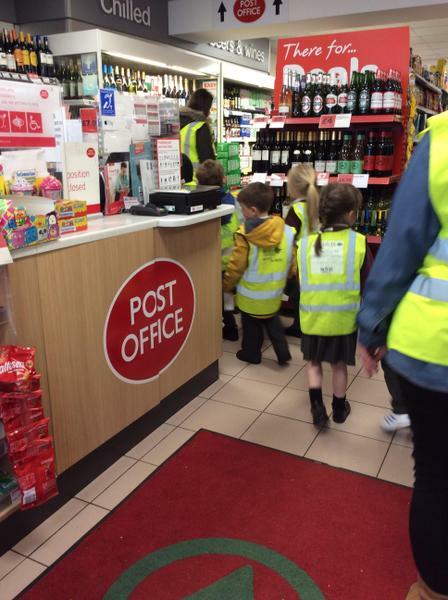 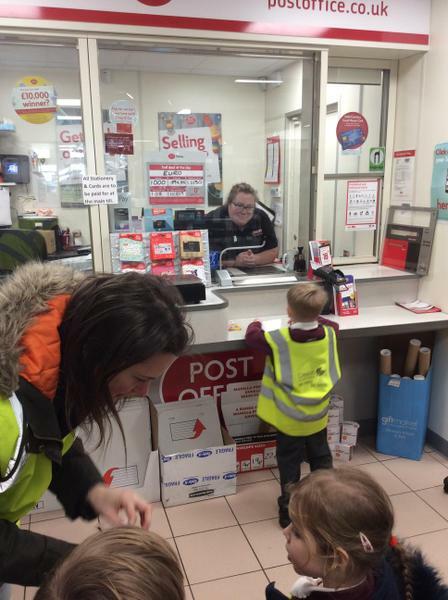 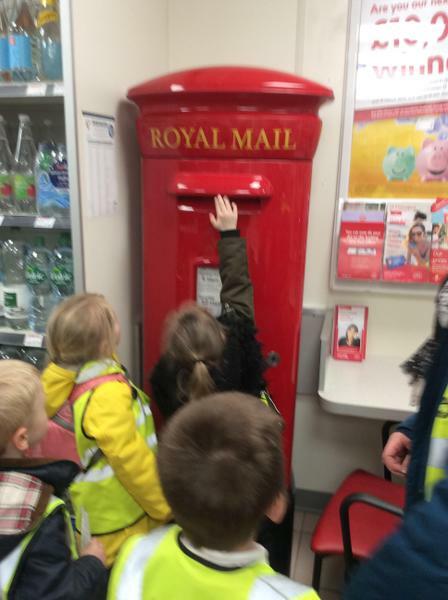 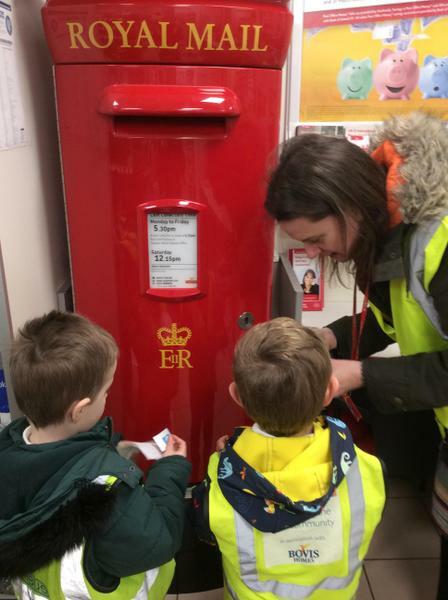 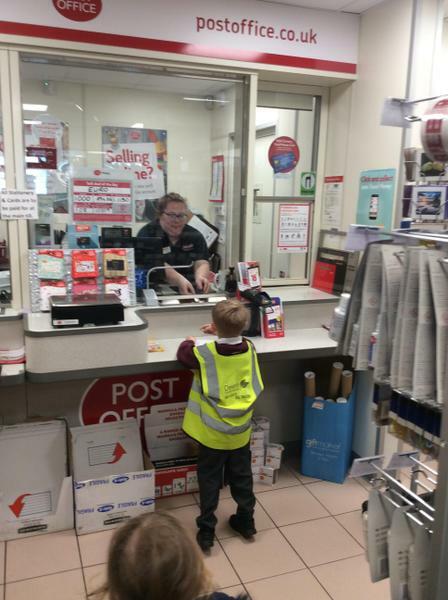 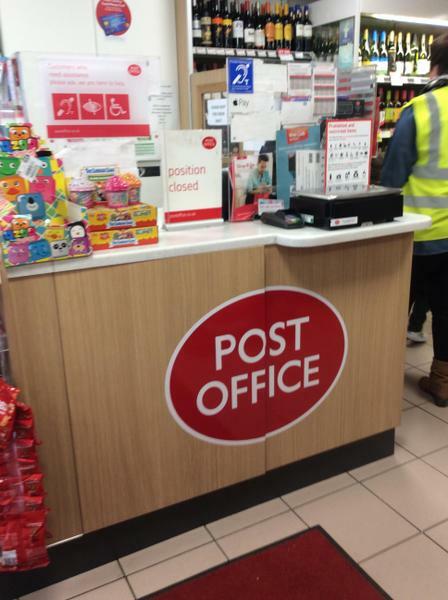 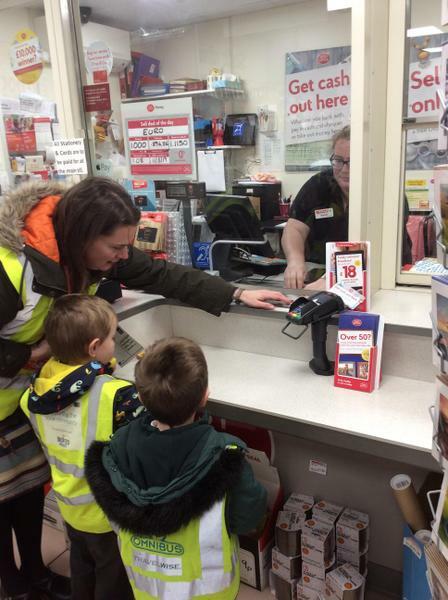 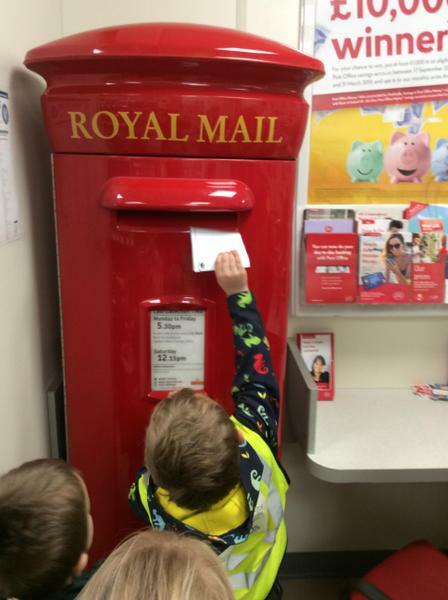 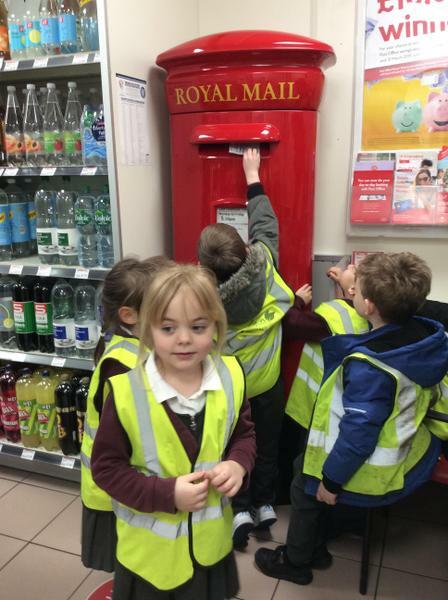 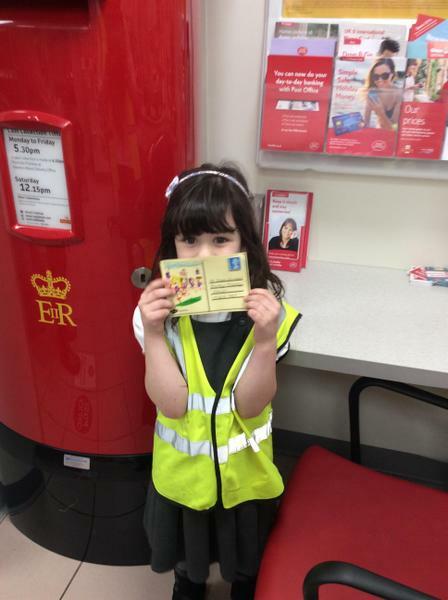 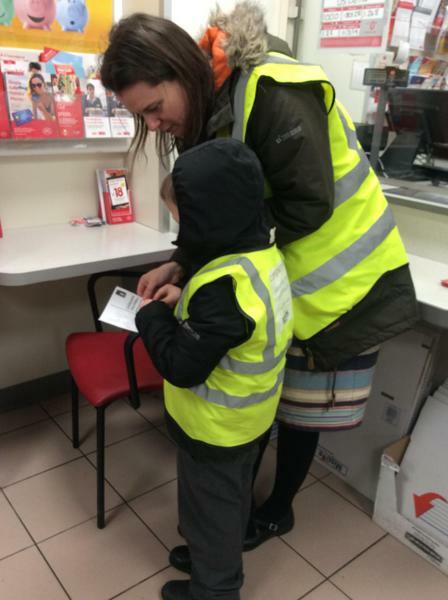 Bovey Explorers head off to the local post office to buy a stamp for their postcards which we then posted to our home address. 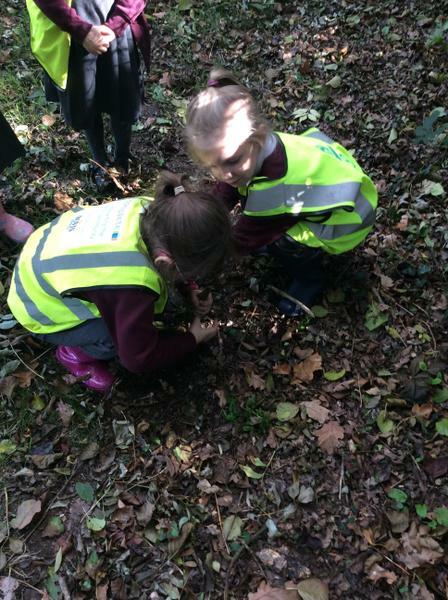 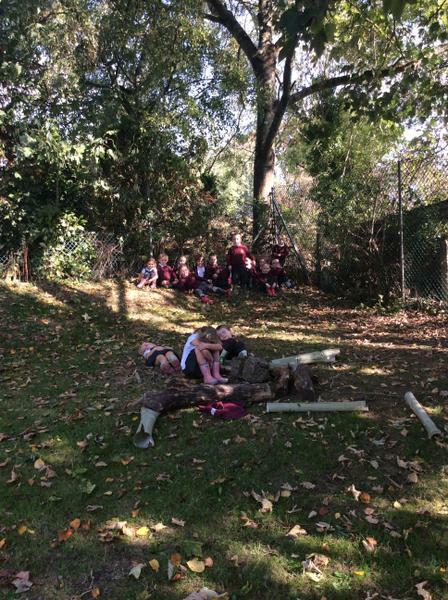 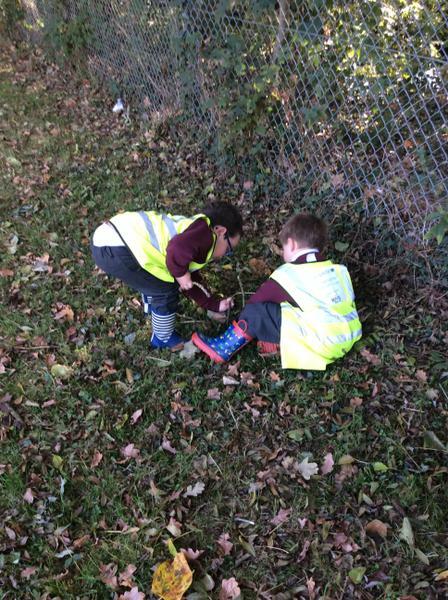 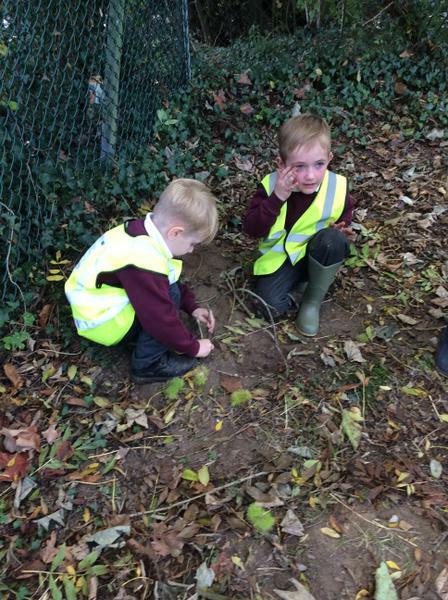 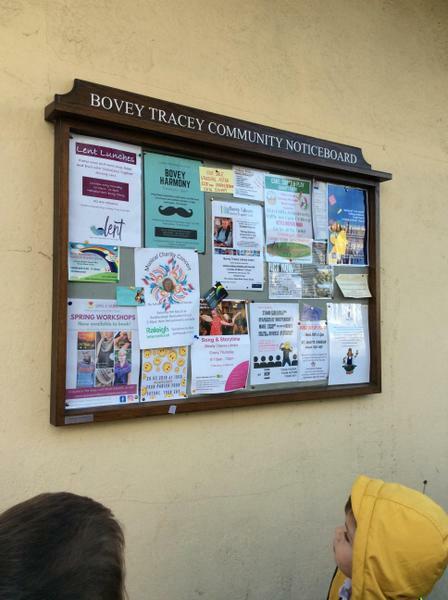 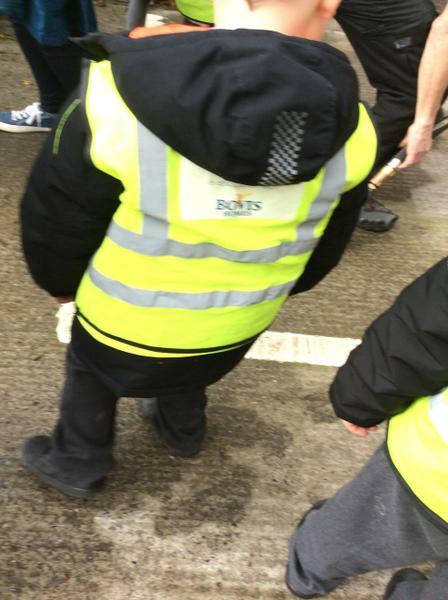 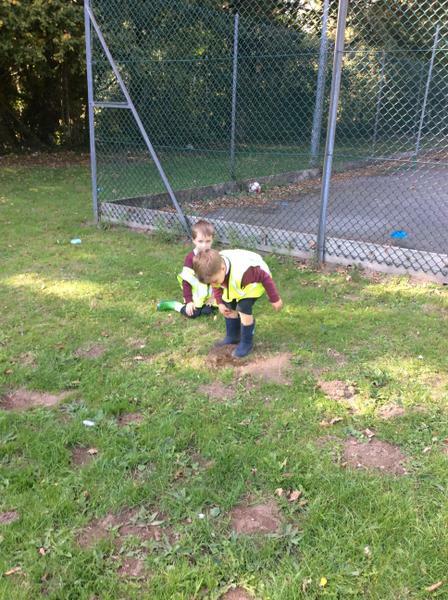 The 'Bovey Explorers' were out and about again on Monday. 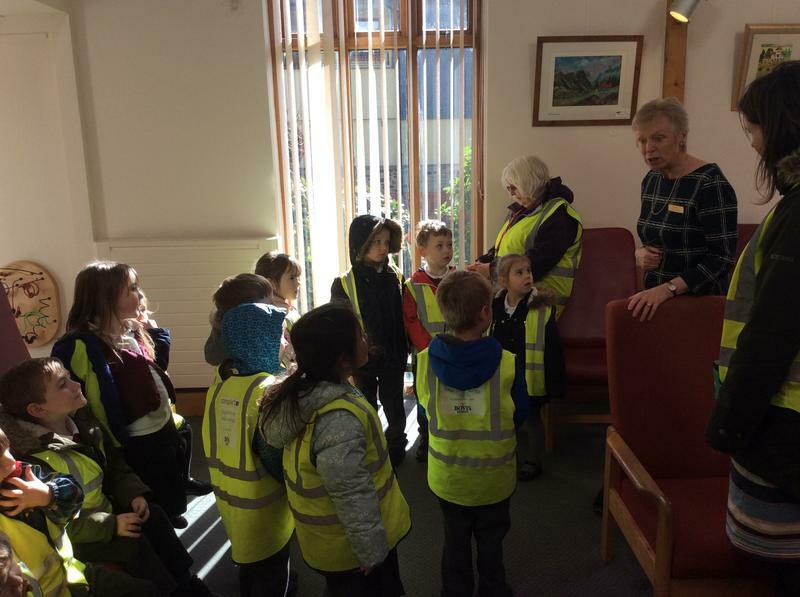 We went to visit our local doctor's surgery. 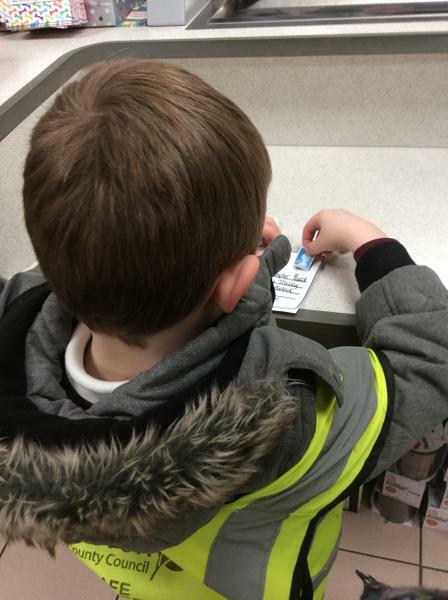 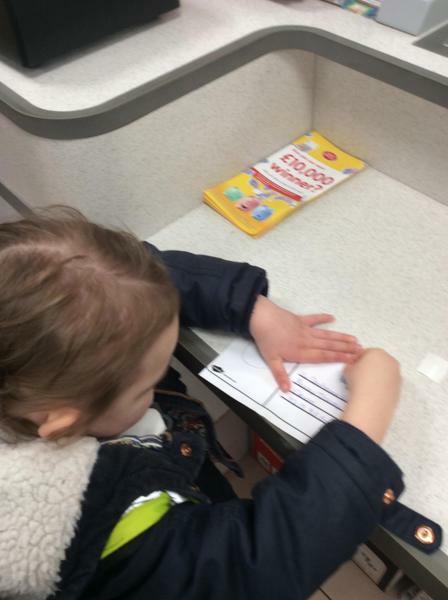 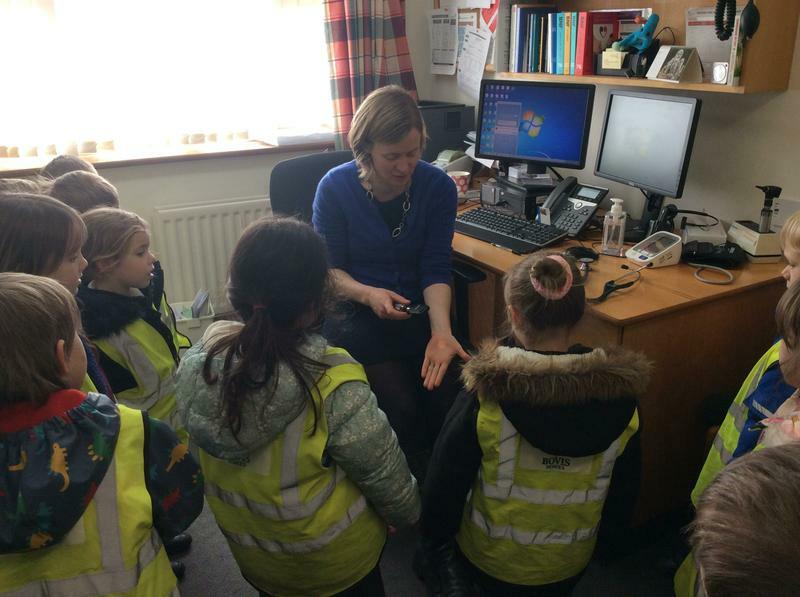 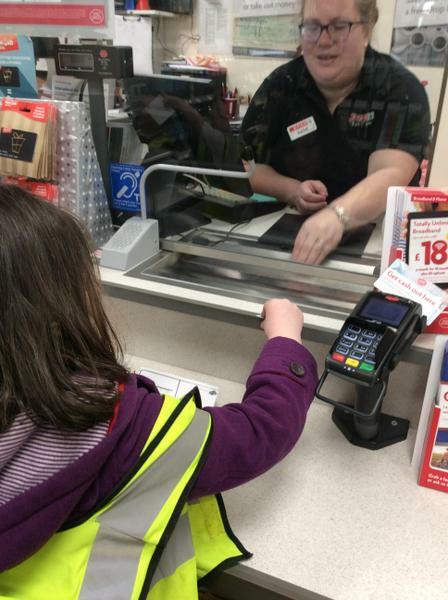 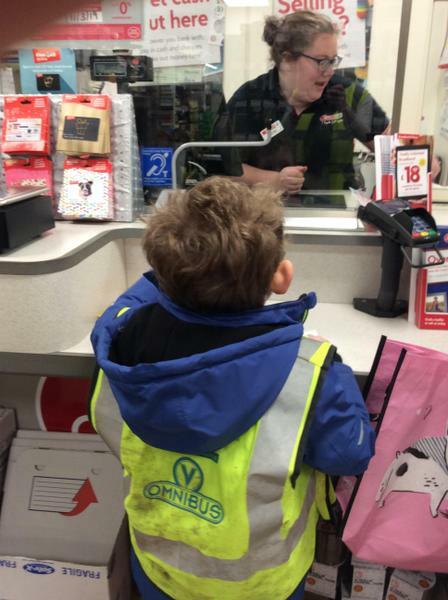 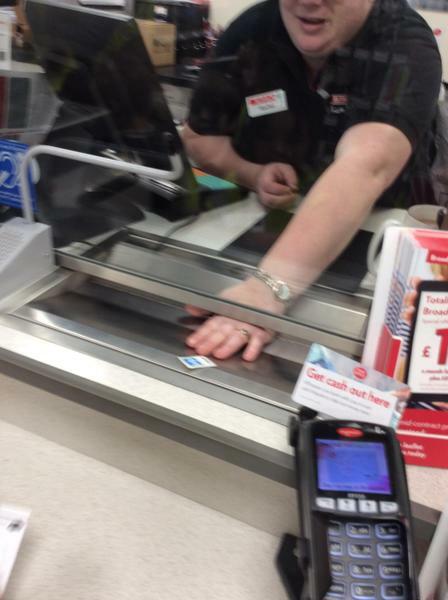 We met the manager of the practice who talked to use about her job role. 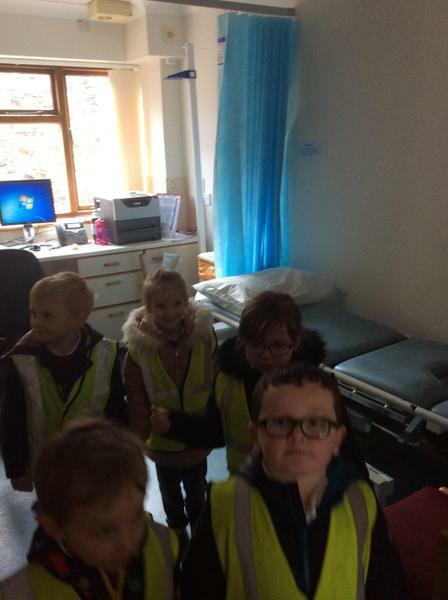 We then had a look inside a doctor's consulting room and met a doctor who showed us some of the different medical equipment they use. 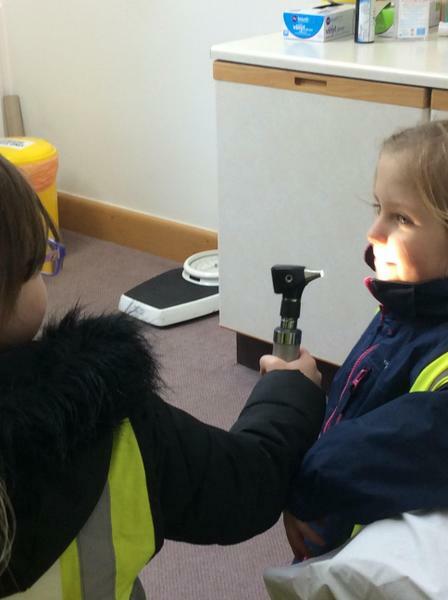 We talked about the different reasons children may have to visit the doctor. 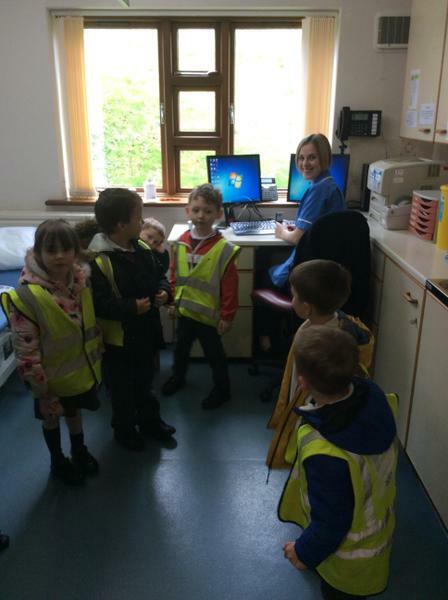 We then went into the nurse's room and the nurse talked about her different jobs she does in the surgery. 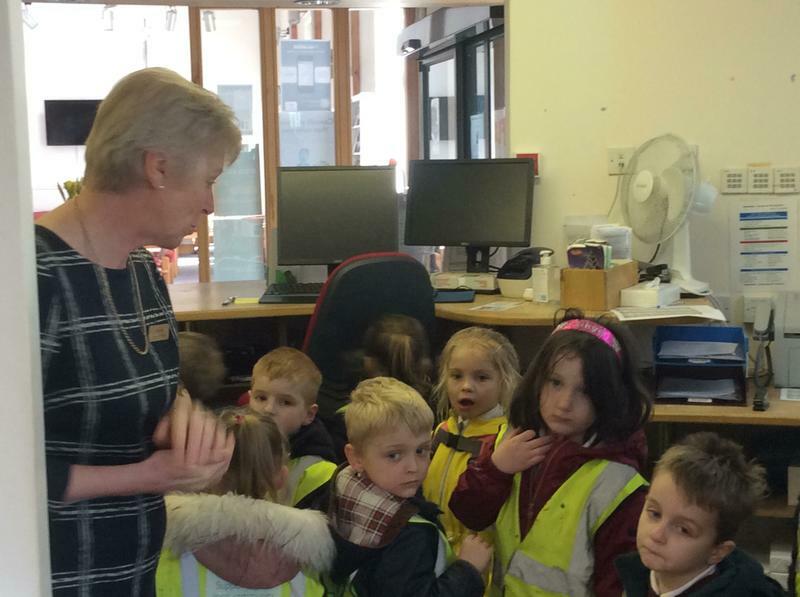 Finally, we had the opportunity to go 'behind the scenes' of the receptionist's desk! 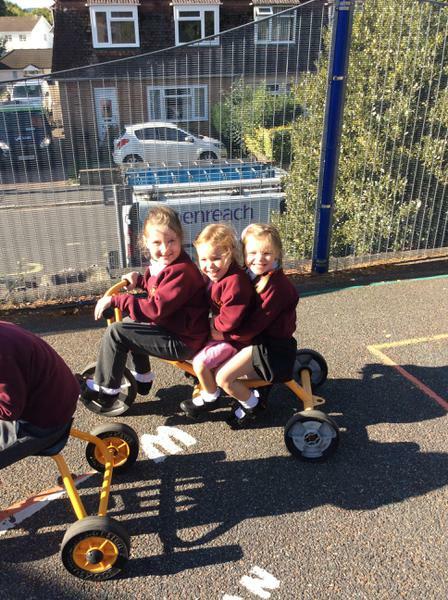 As much fun as we had, we hope we don't have to go back too soon! 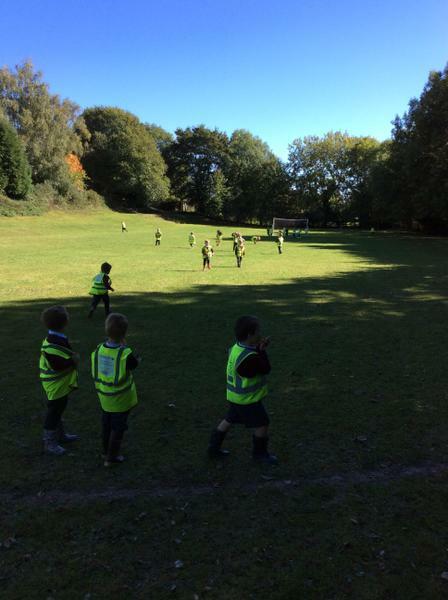 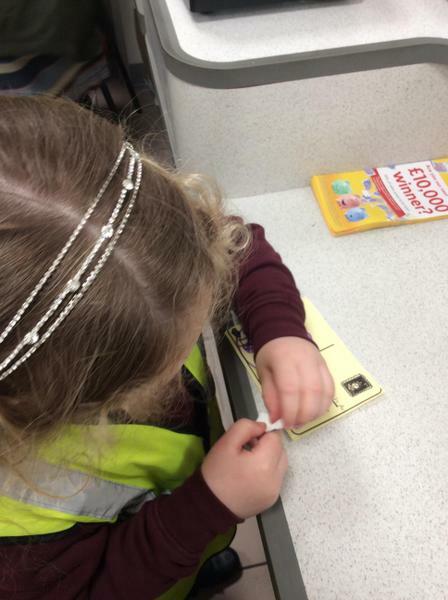 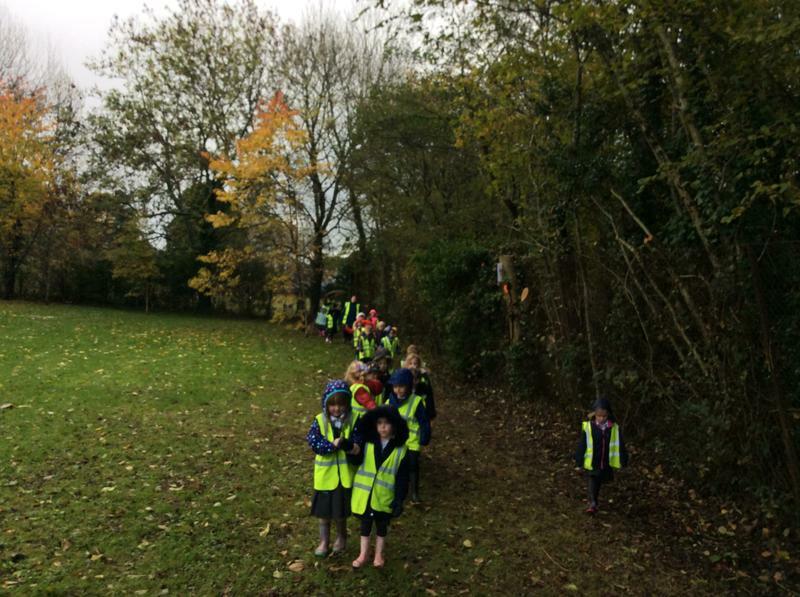 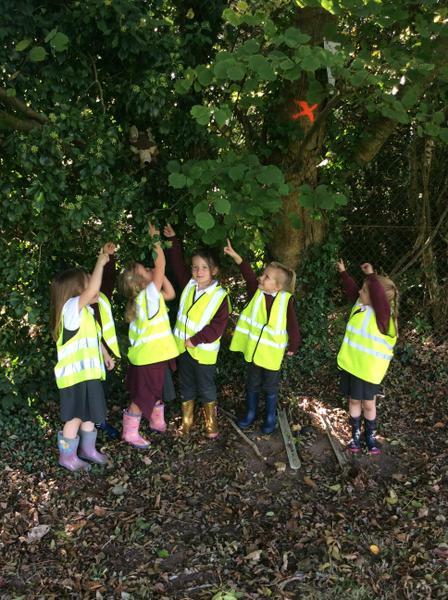 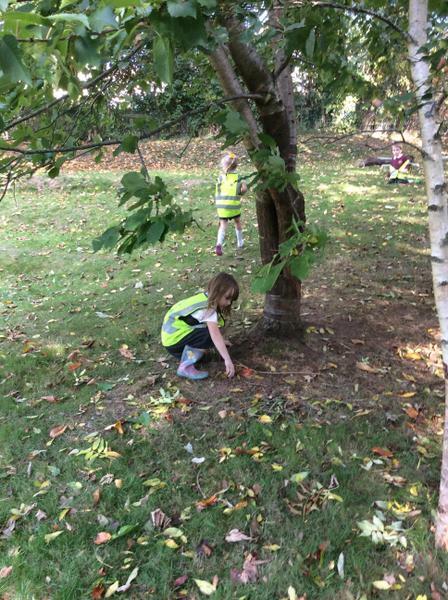 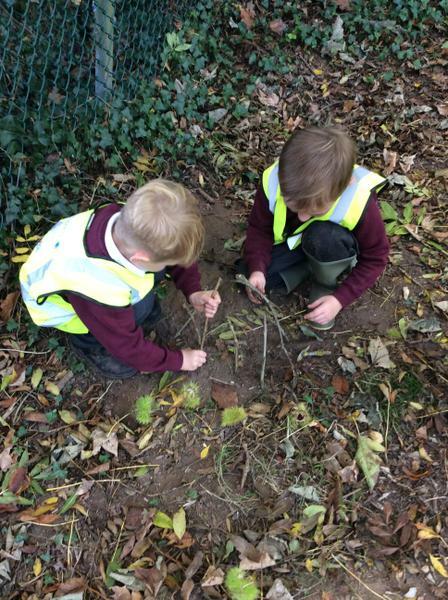 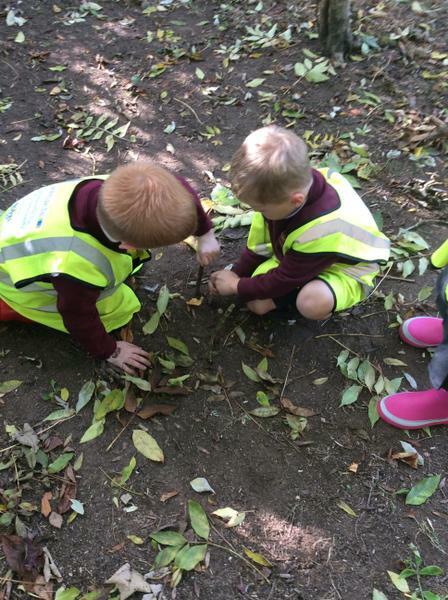 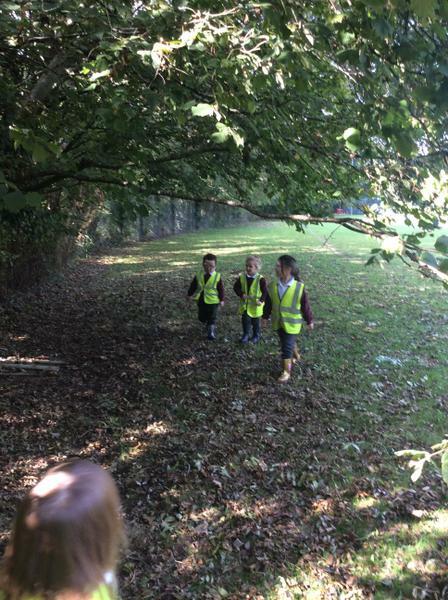 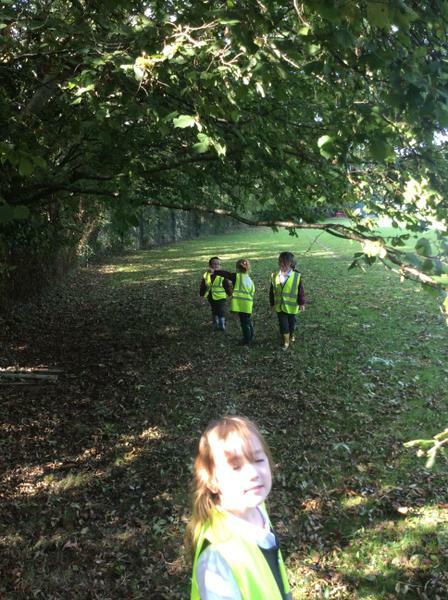 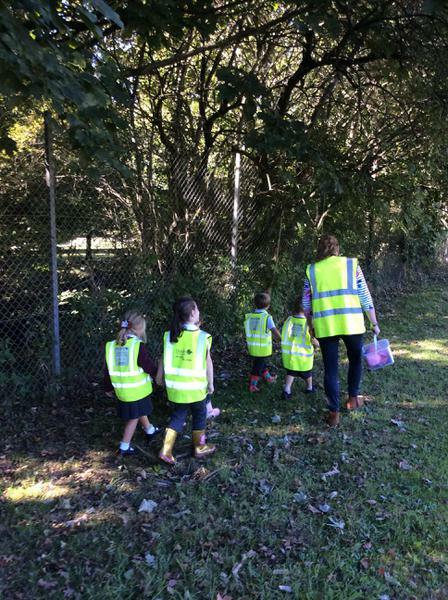 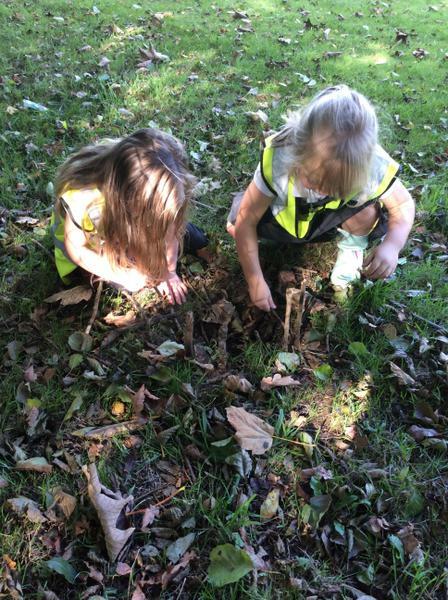 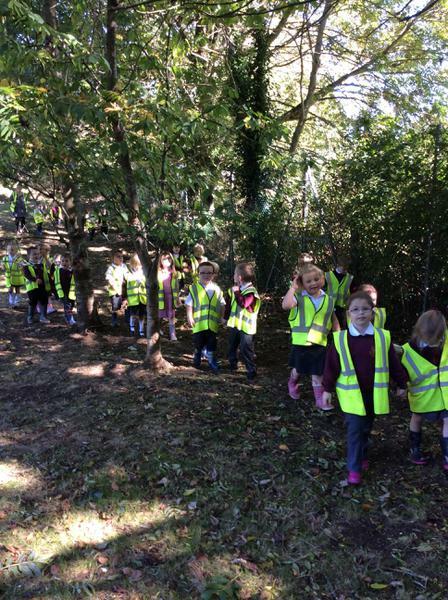 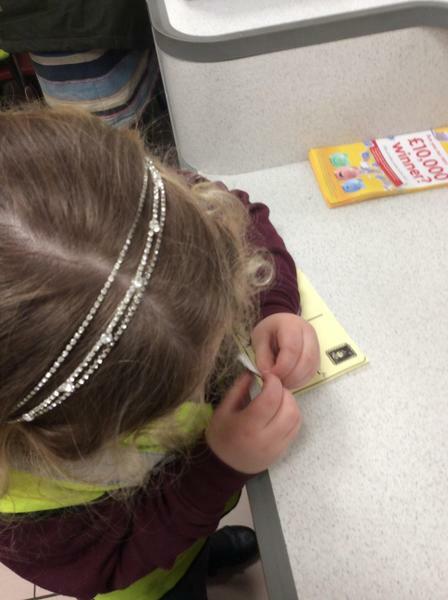 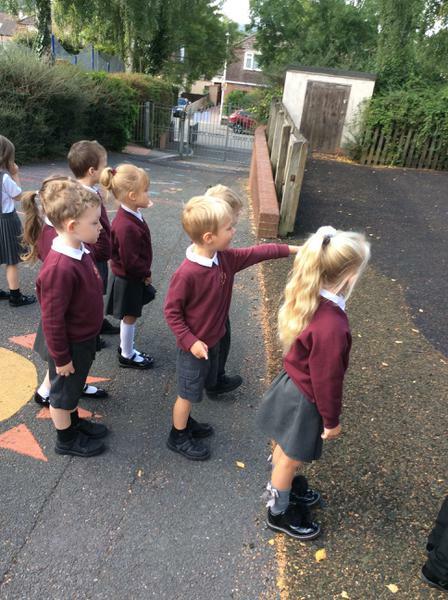 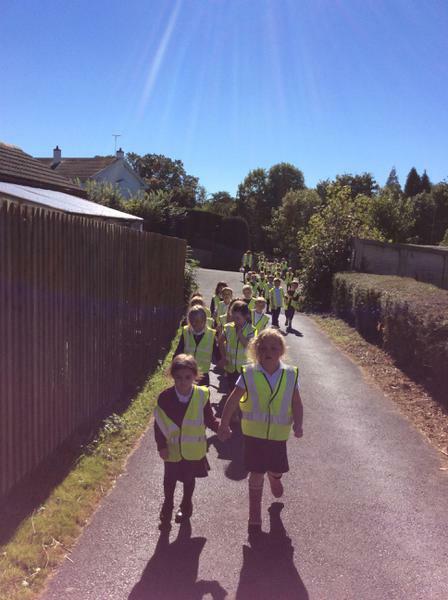 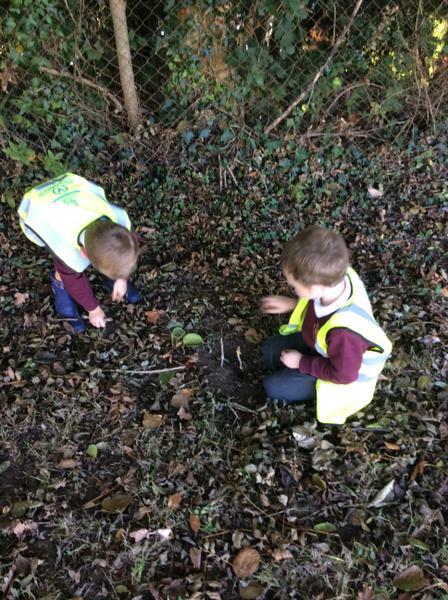 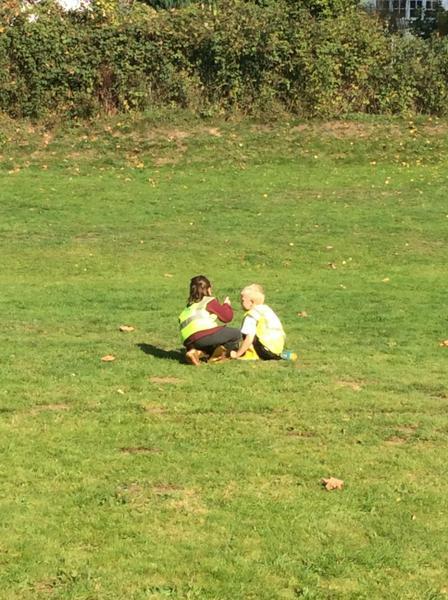 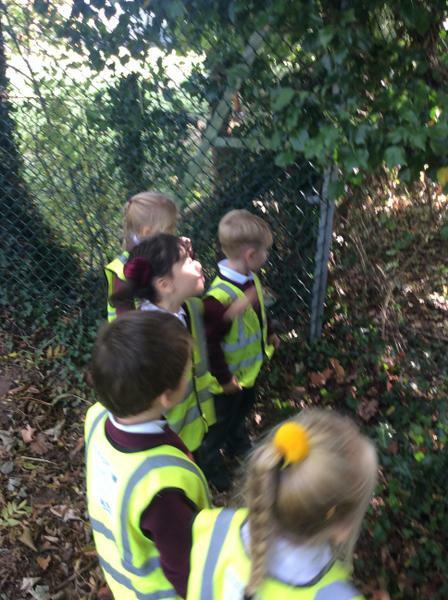 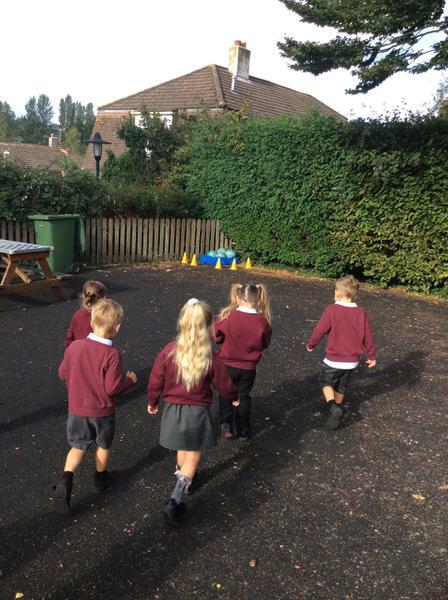 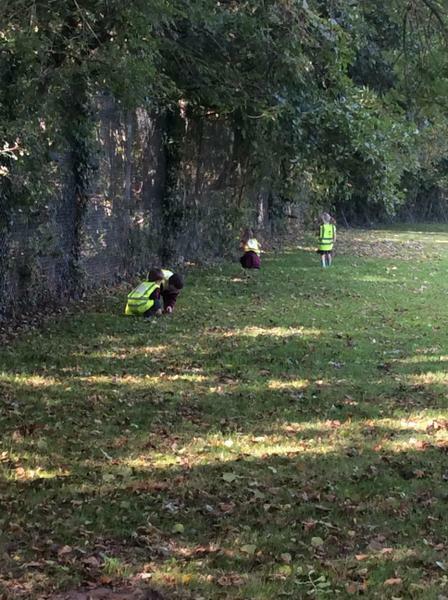 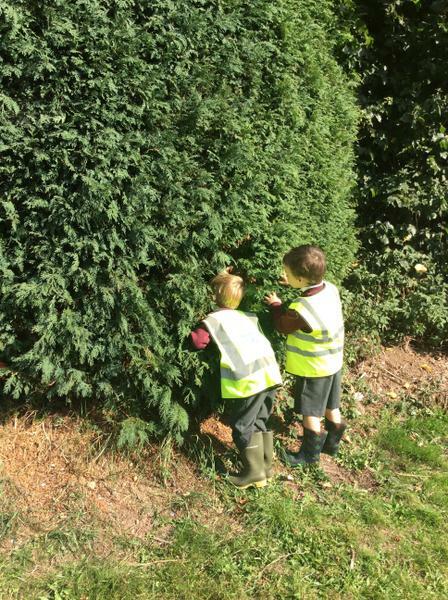 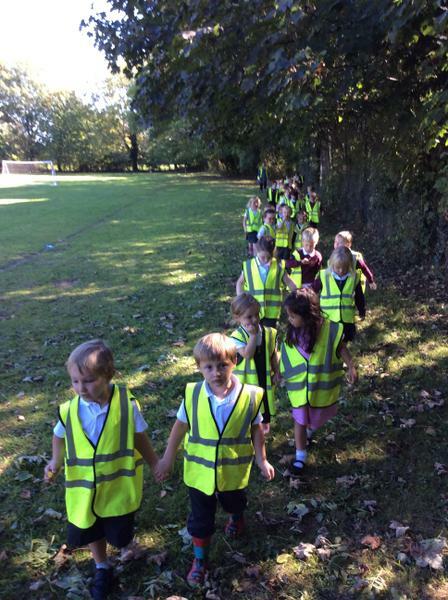 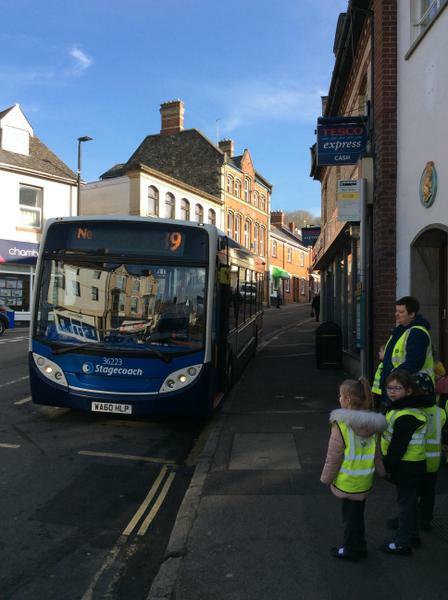 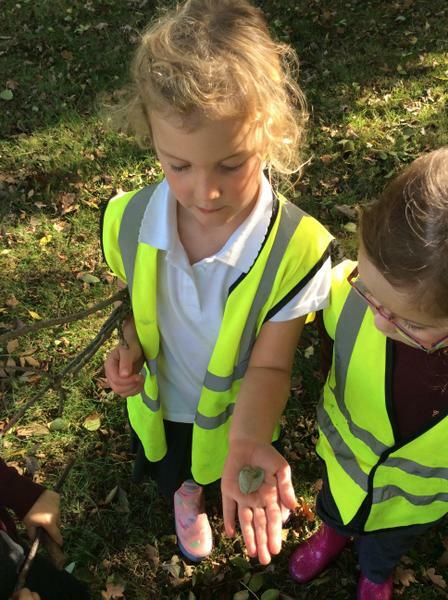 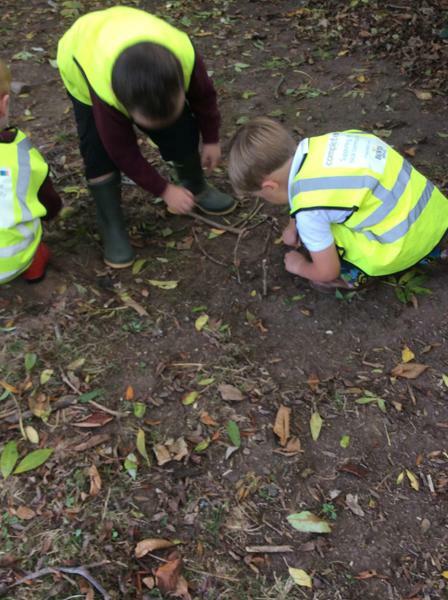 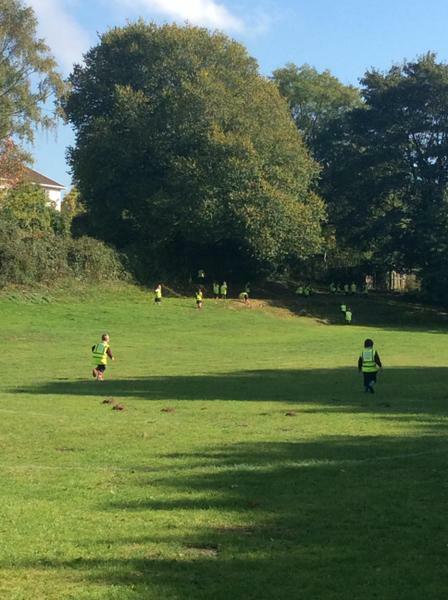 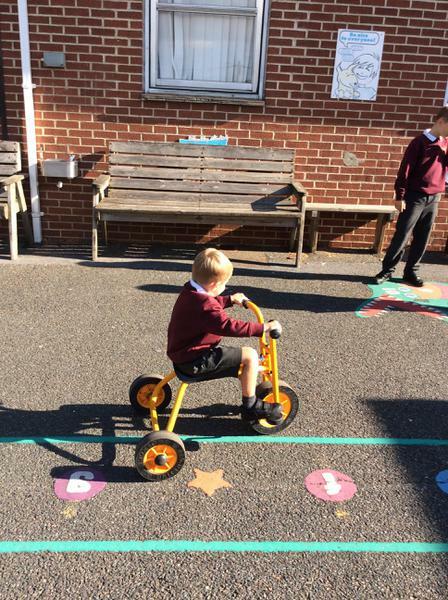 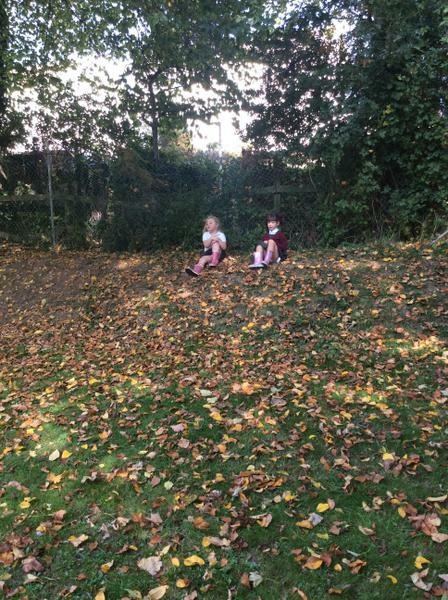 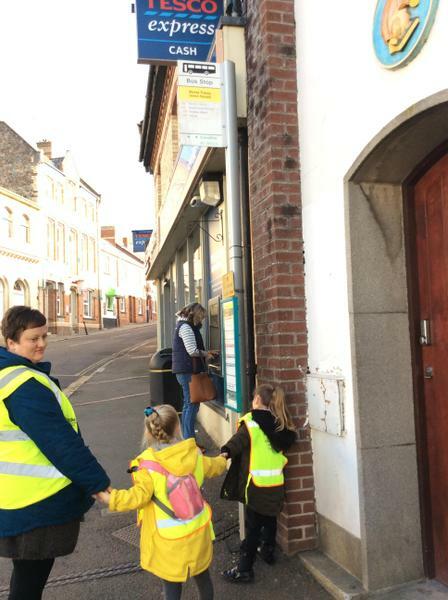 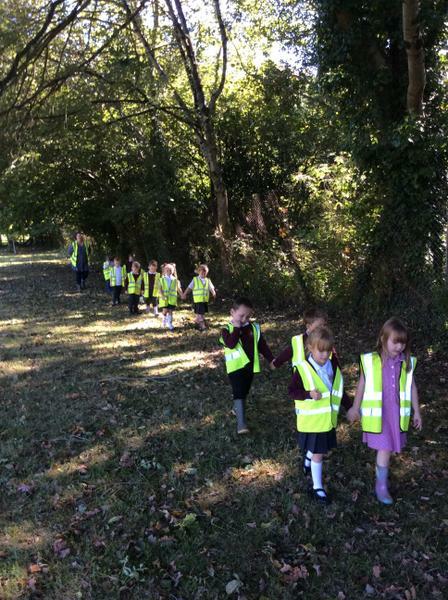 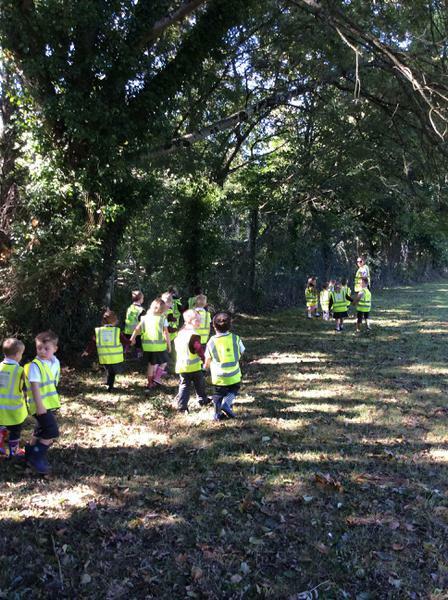 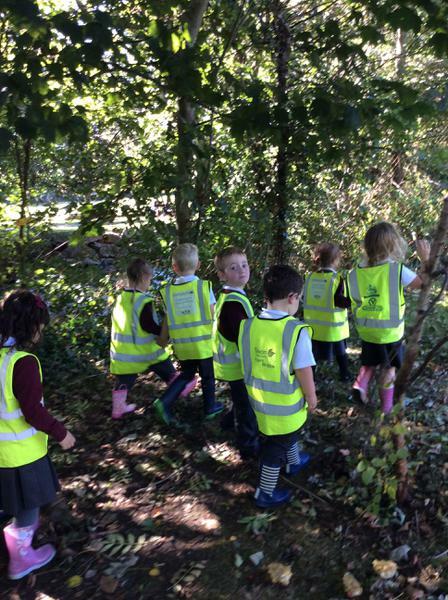 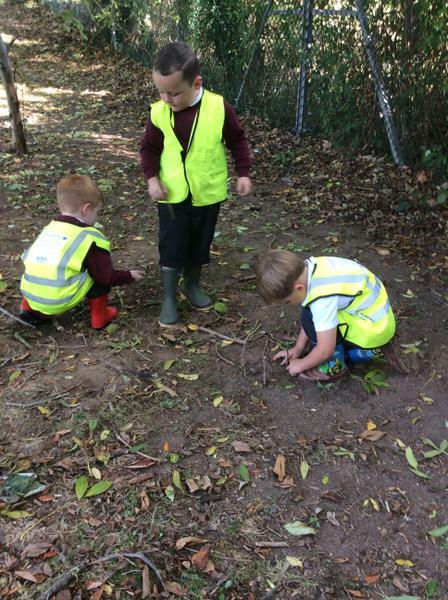 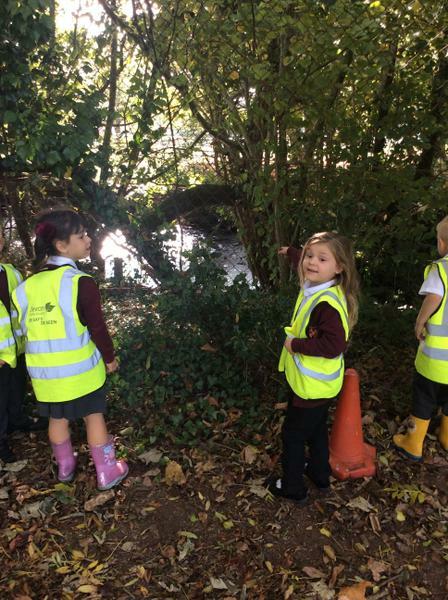 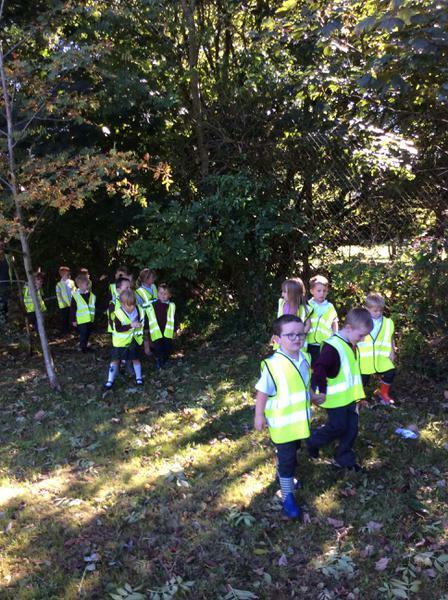 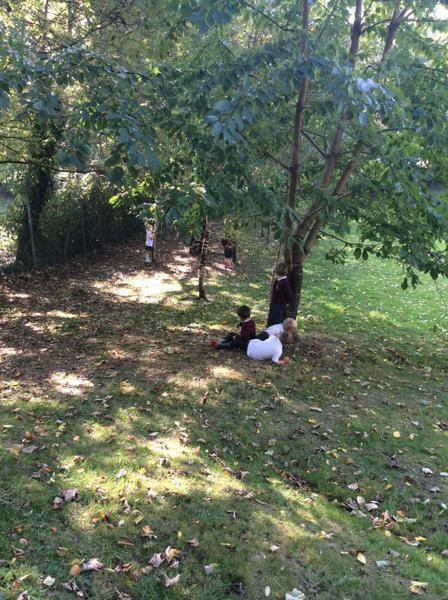 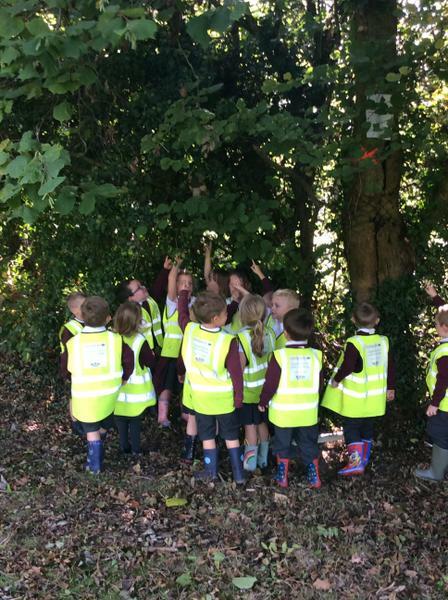 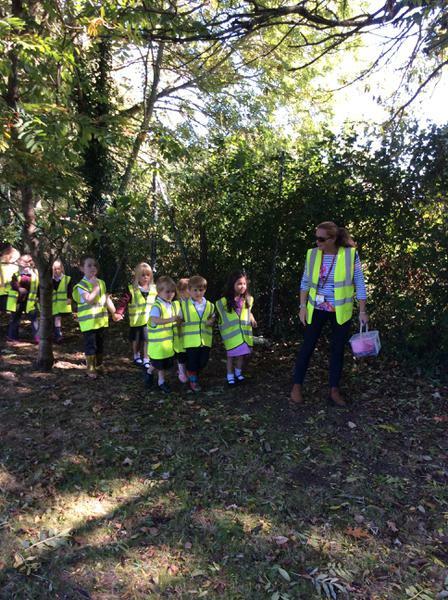 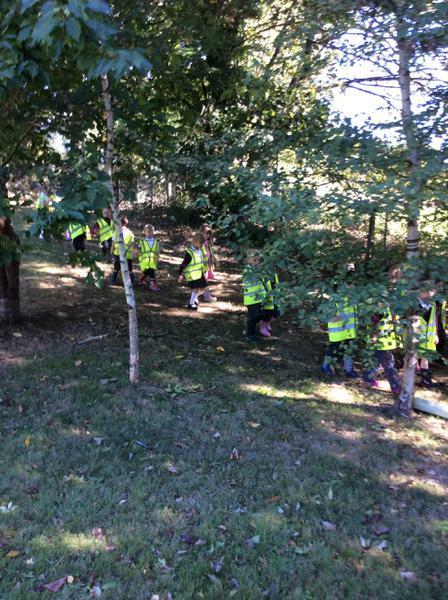 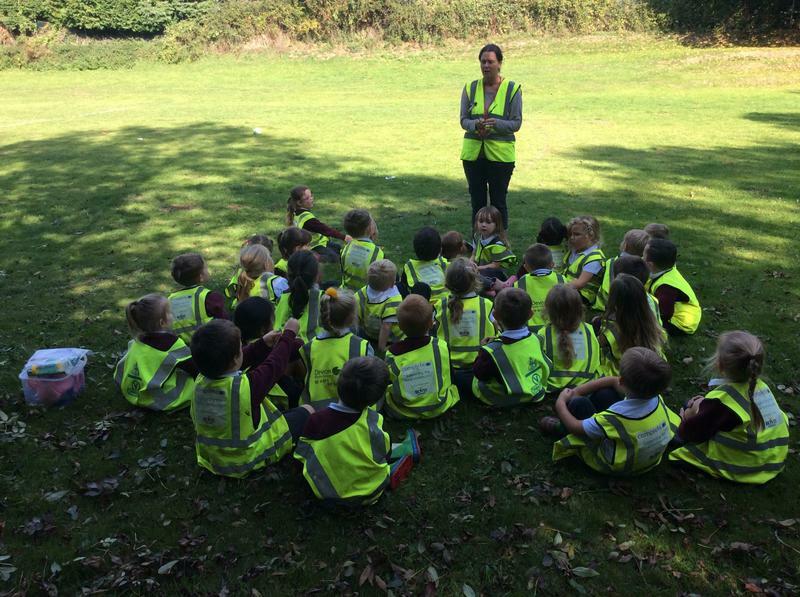 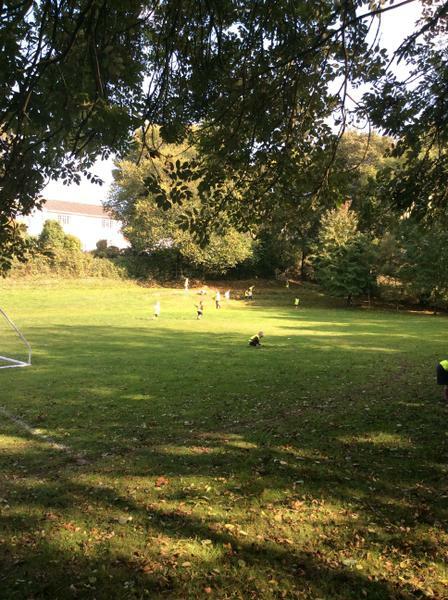 This week the children became 'Bovey Explorers' and we set out on an expedition around our local town. 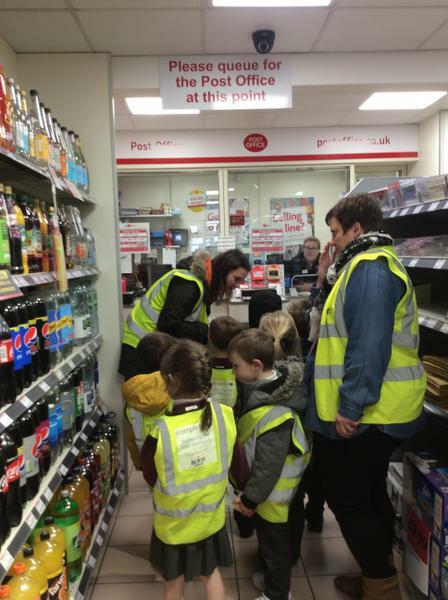 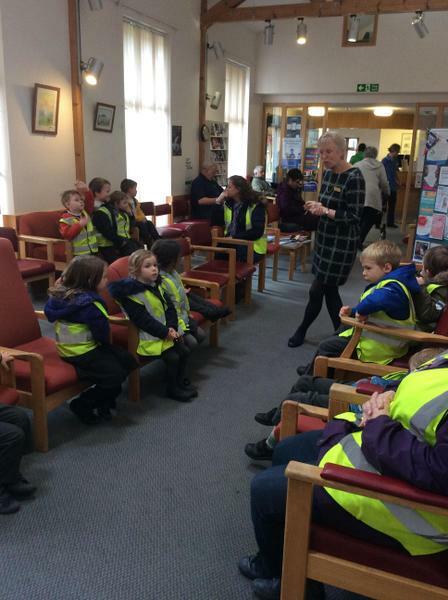 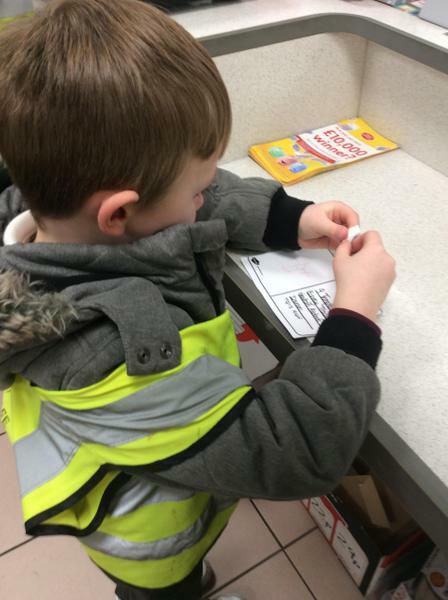 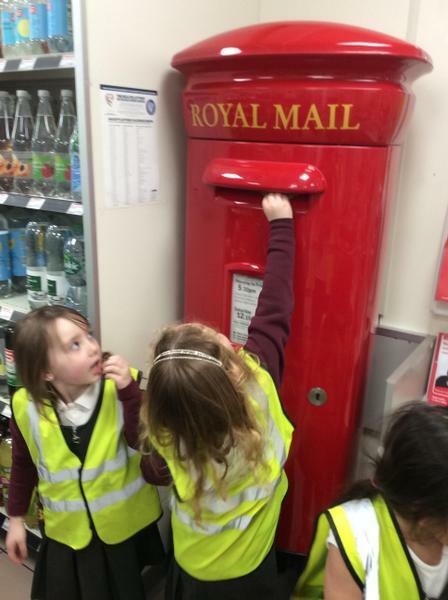 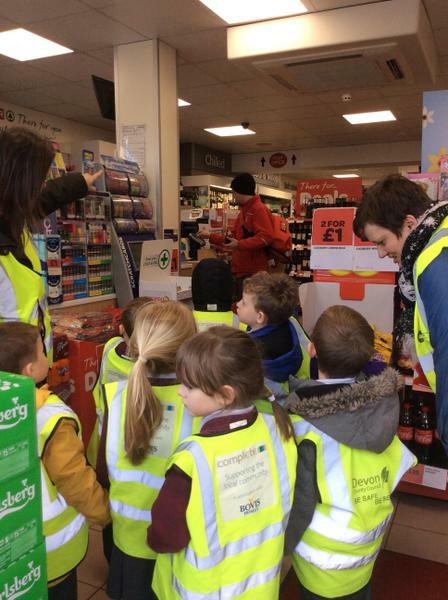 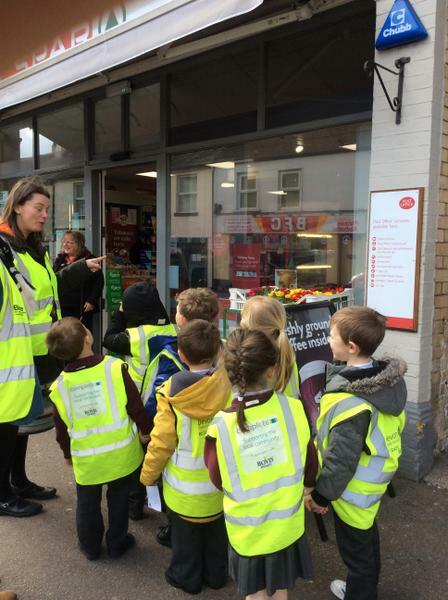 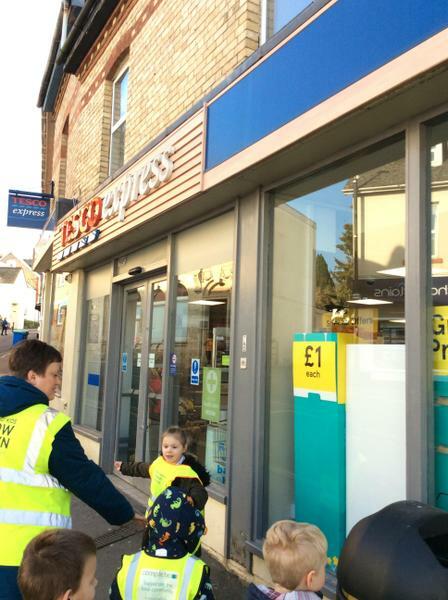 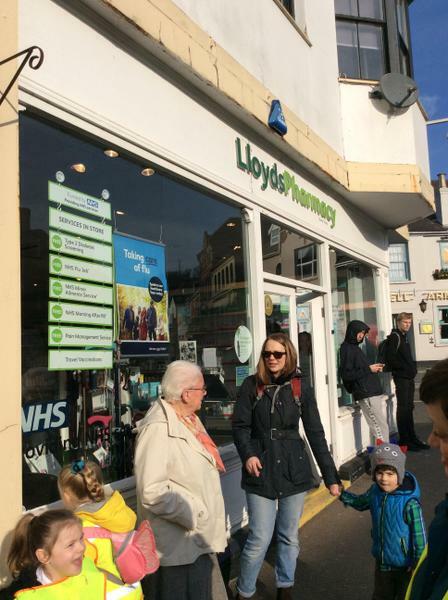 We learnt about the different shops and services we have in Bovey Tracey. 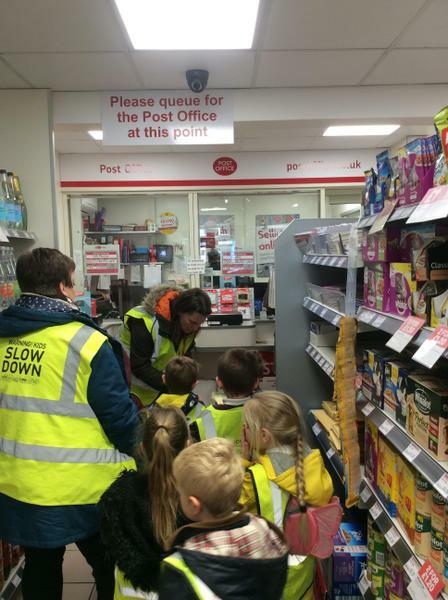 At the vets, we saw a cat who had an injury on his back. 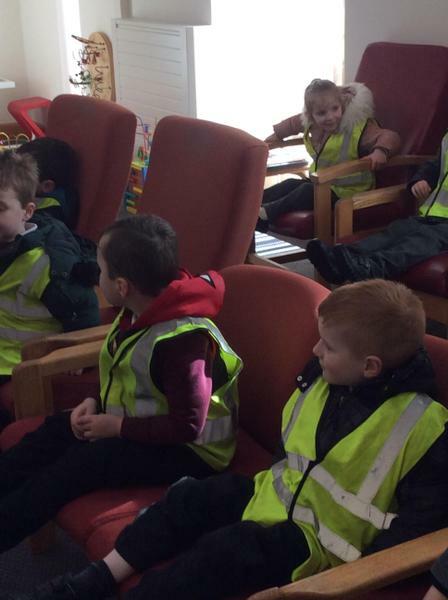 We spoke to the nurse who explained how they would look after the cat. 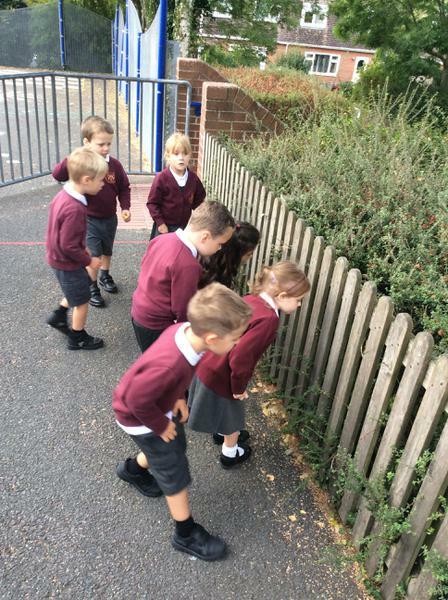 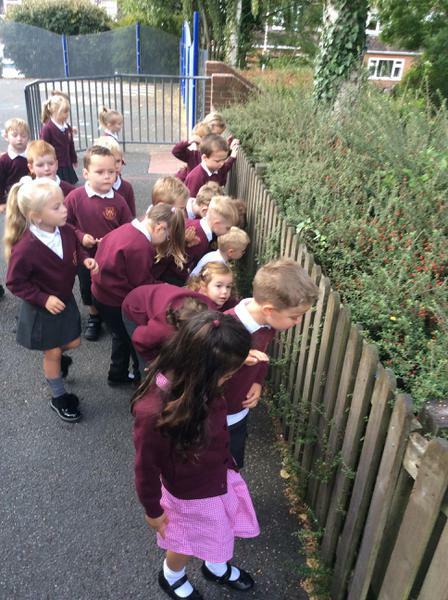 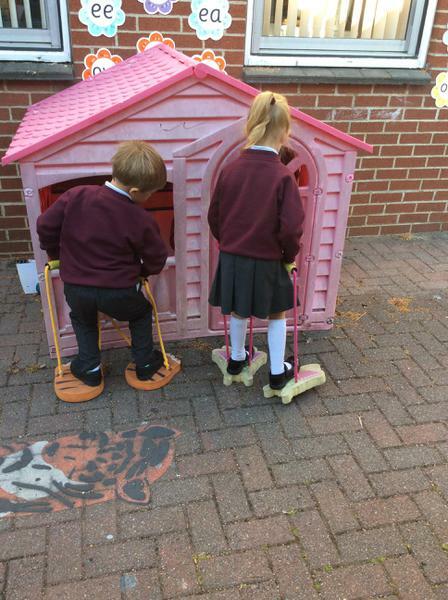 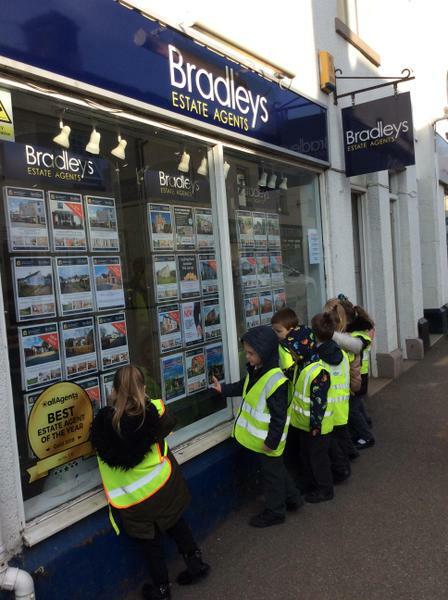 We looked at different properties that were for sale in the window of the estate agents. 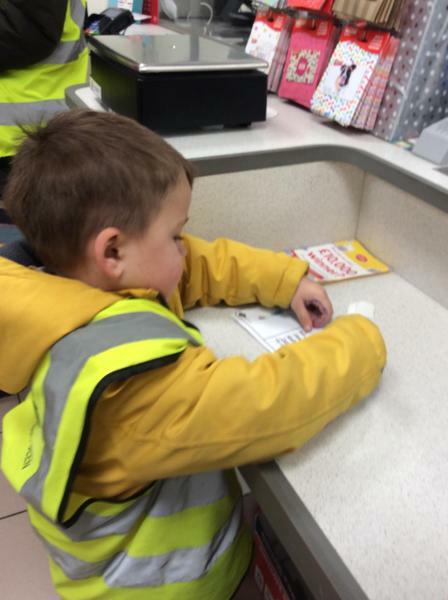 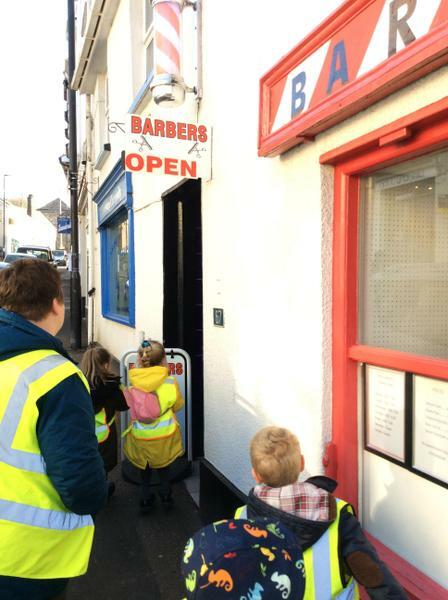 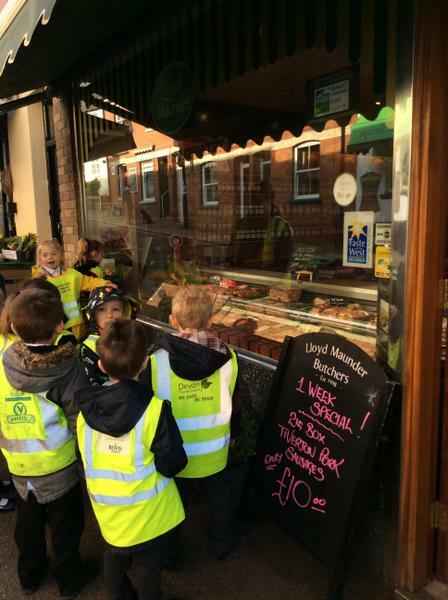 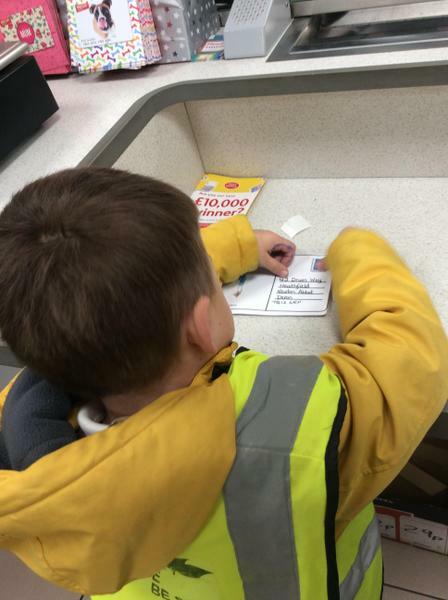 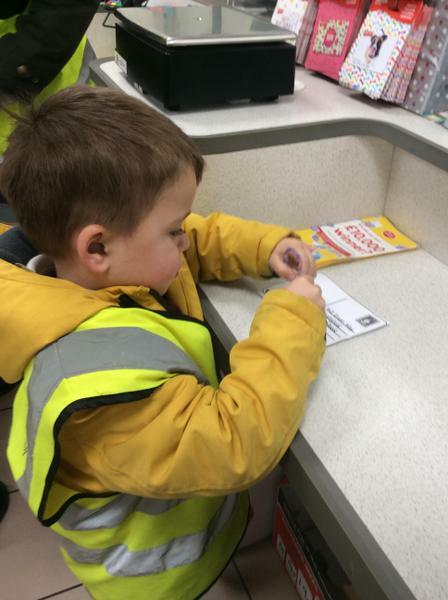 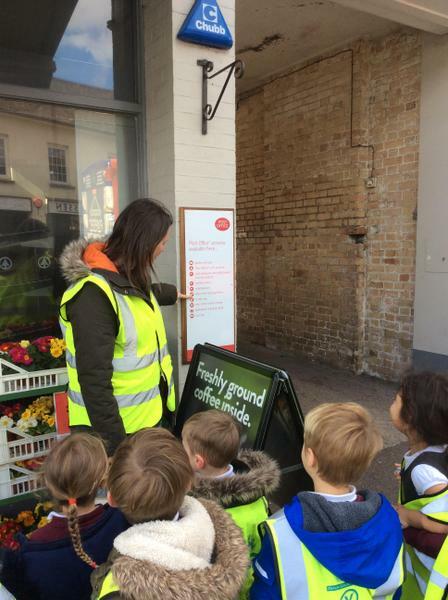 The children especially liked reading the menus outside the different cafes, restaurants and takeaways in our town. 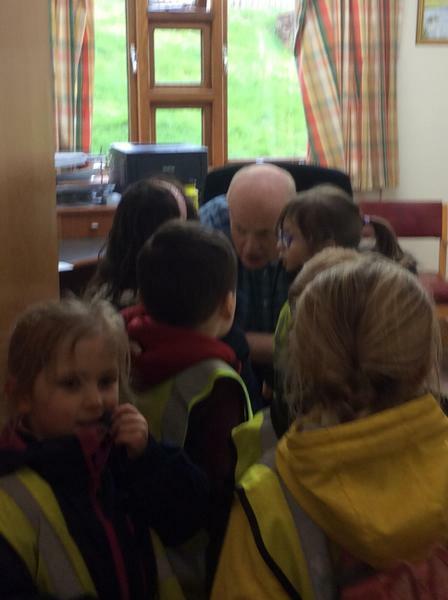 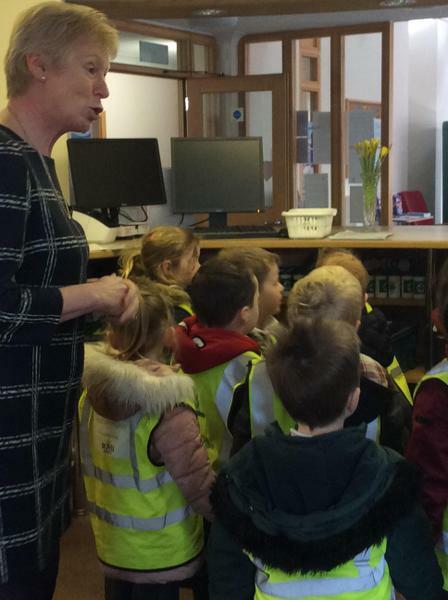 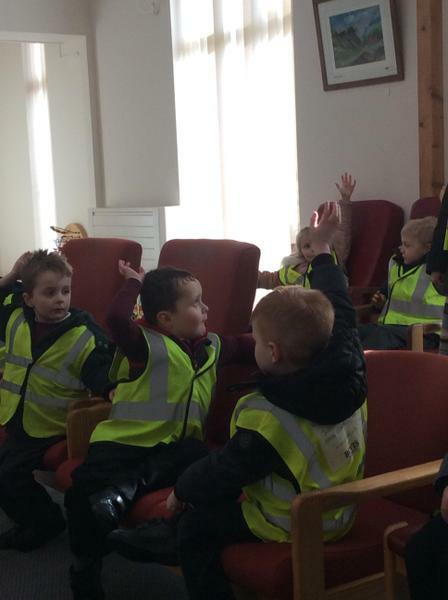 We also discussed what we think the council should do with the empty building that used to be the bank. 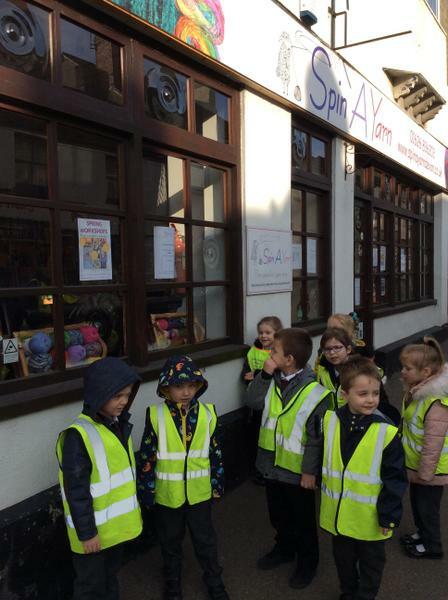 The children had some fantastic ideas including; a play centre for younger children, a children's cafe, a sweet shop and a toy shop! 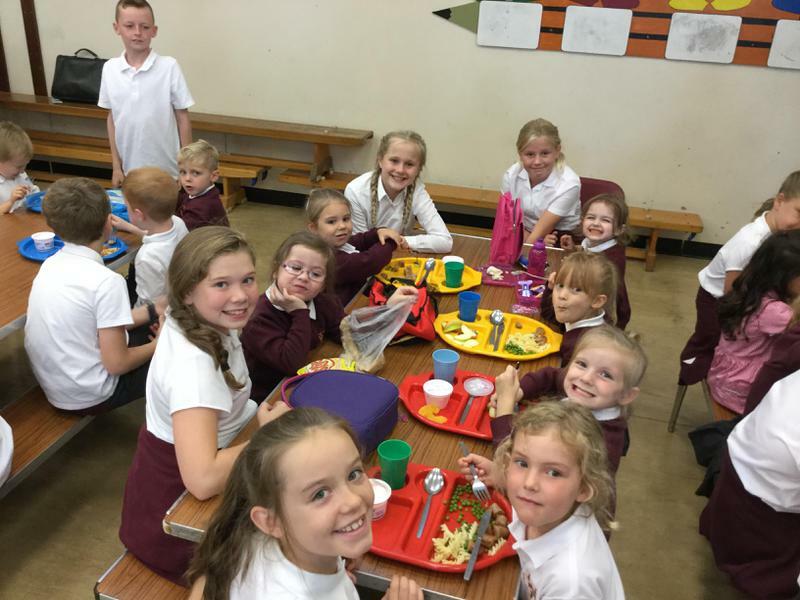 Congratulations to this week's top Dojos! 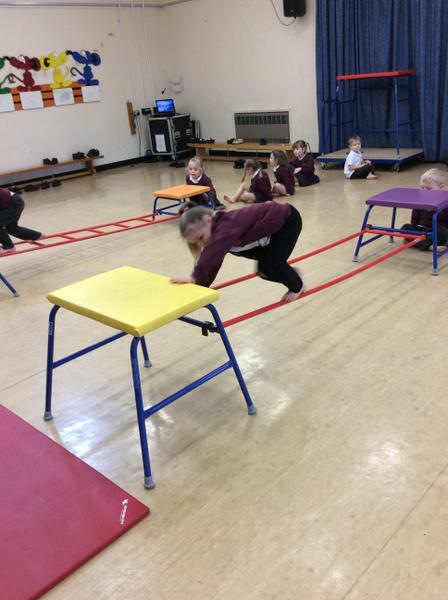 We have loved developing our skills and confidence in PE this term. 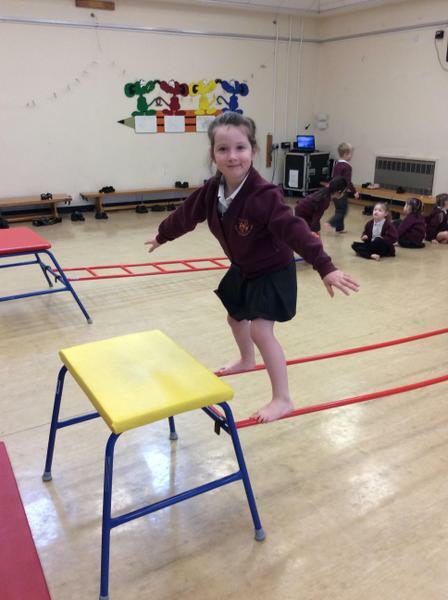 Using a range of apparatus, we have been learning how to travel in different ways and to jump and land safely from a range of heights. 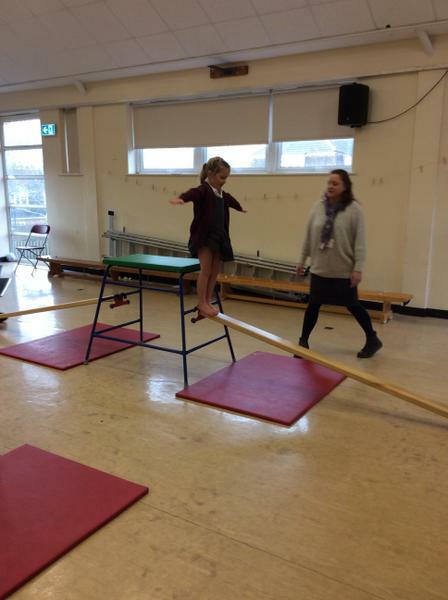 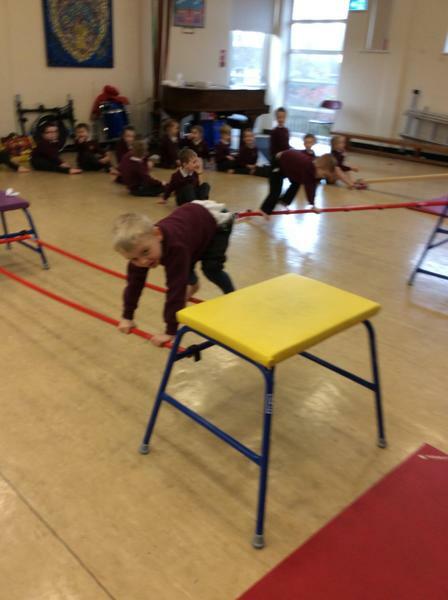 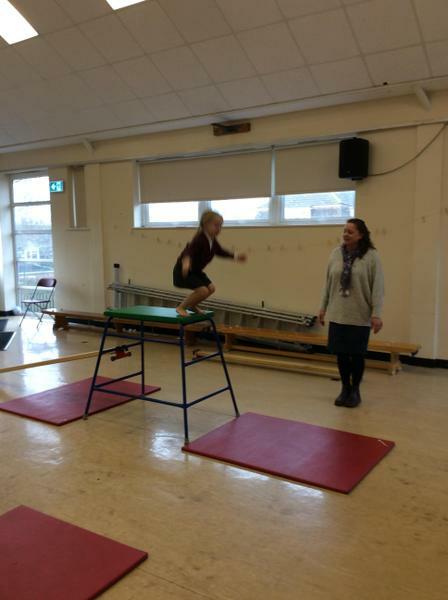 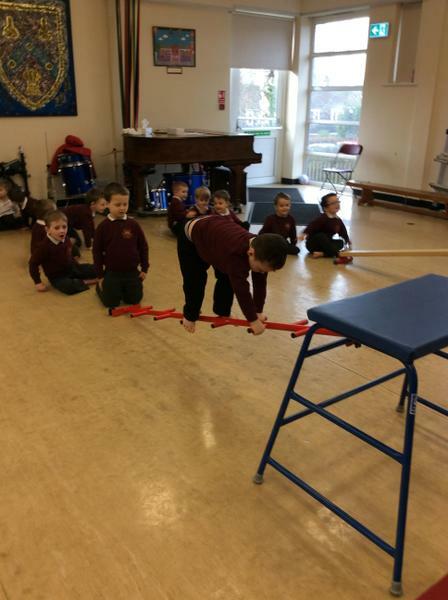 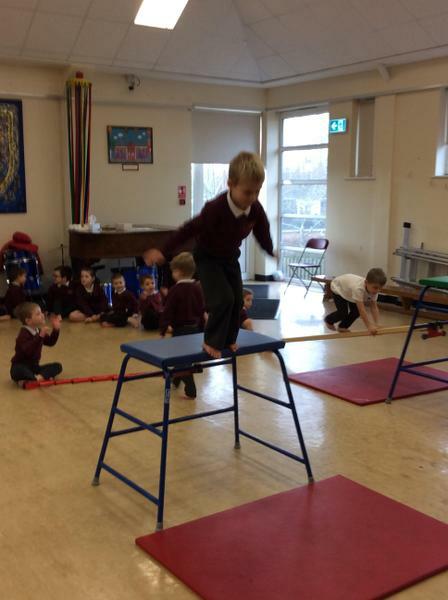 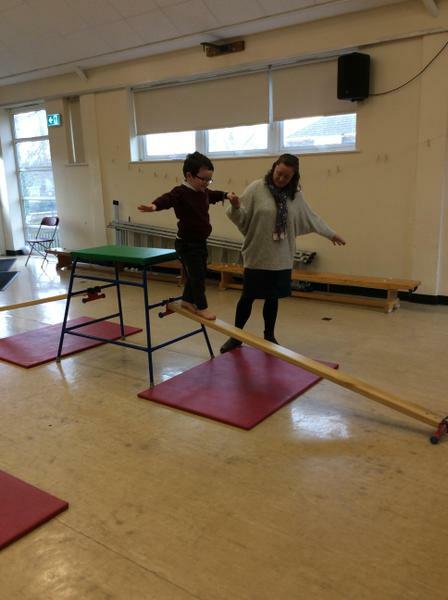 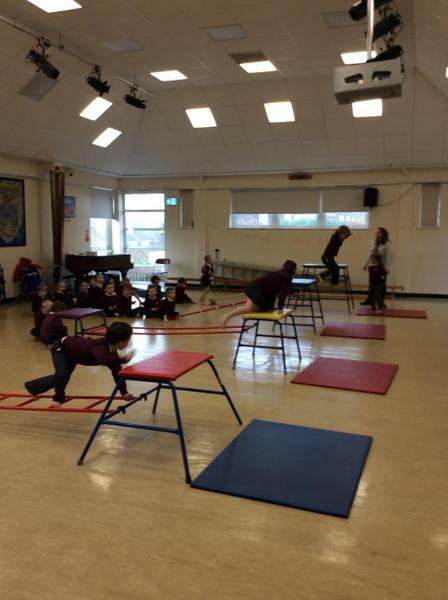 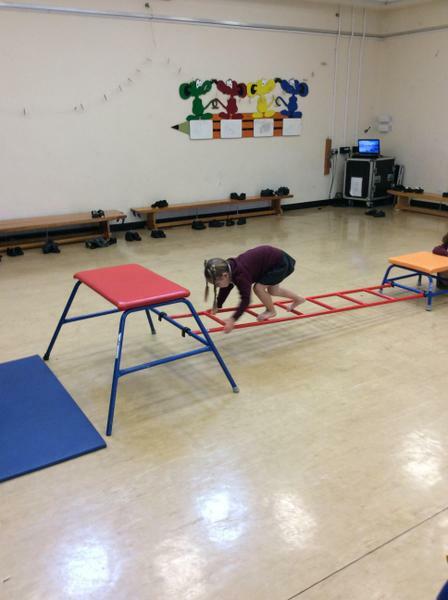 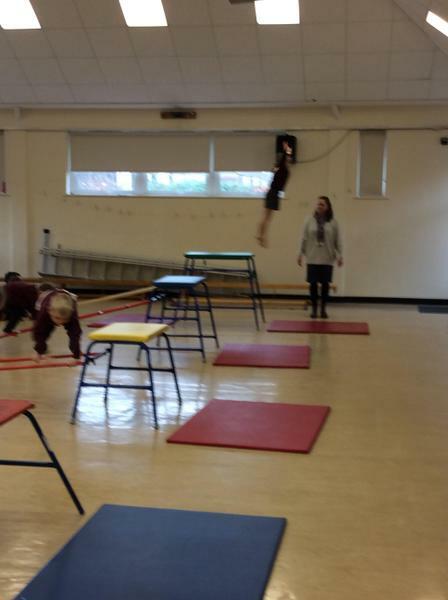 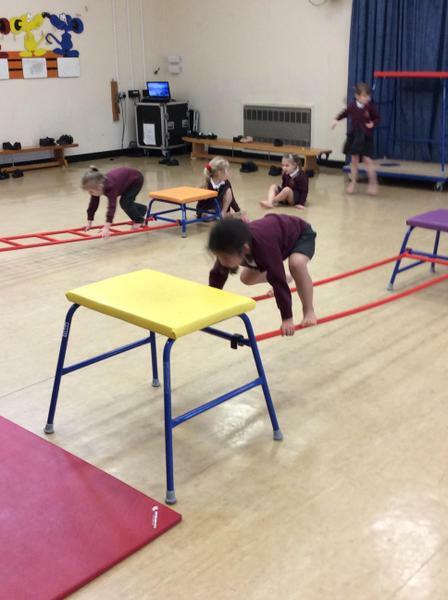 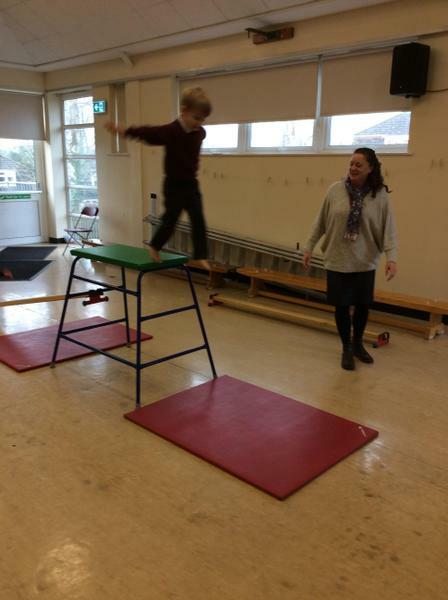 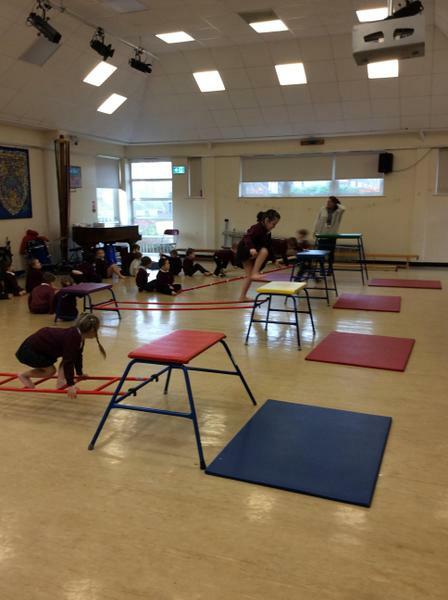 The children have really impressed me with their abilities and I am certain we have some gymnasts in the making! 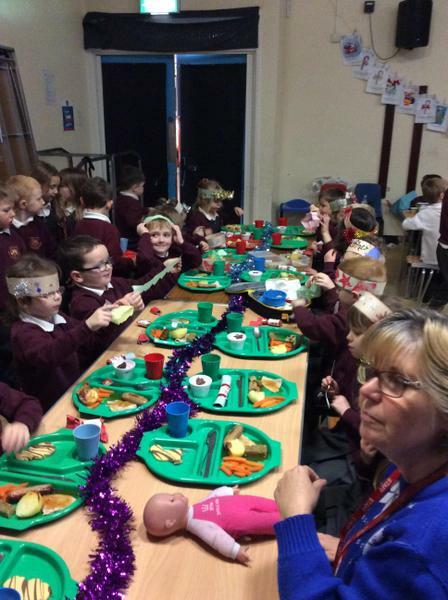 Christmas lunch was delicious today. 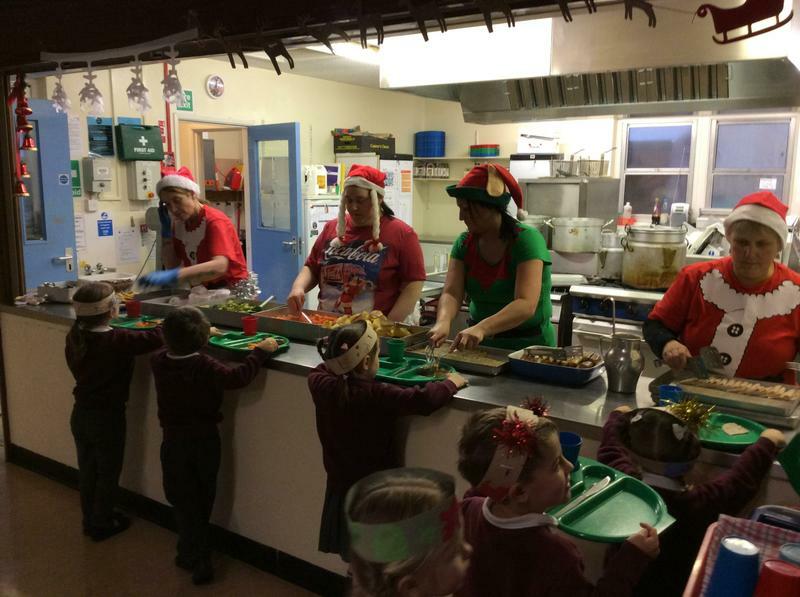 Thank-you Mrs Stapleton and her elf helpers! 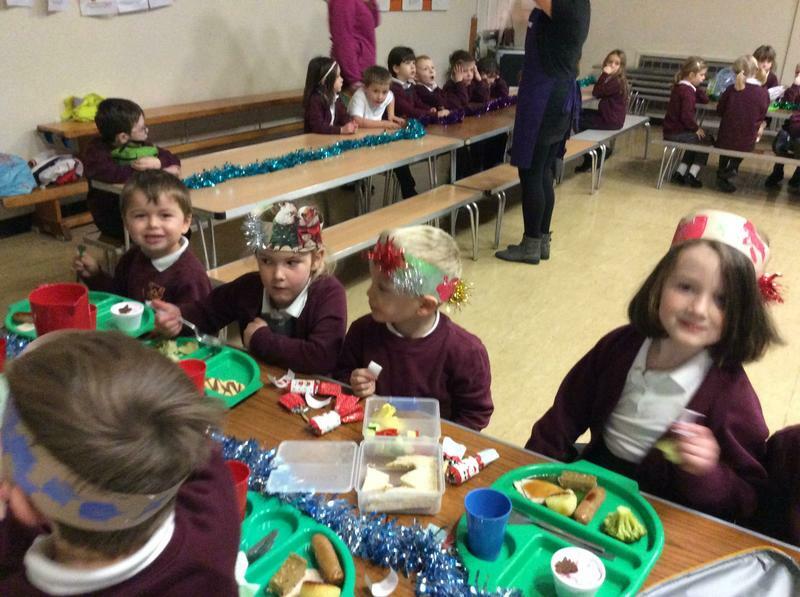 What a BAA-rilliant performance by the children, in our Christmas production. 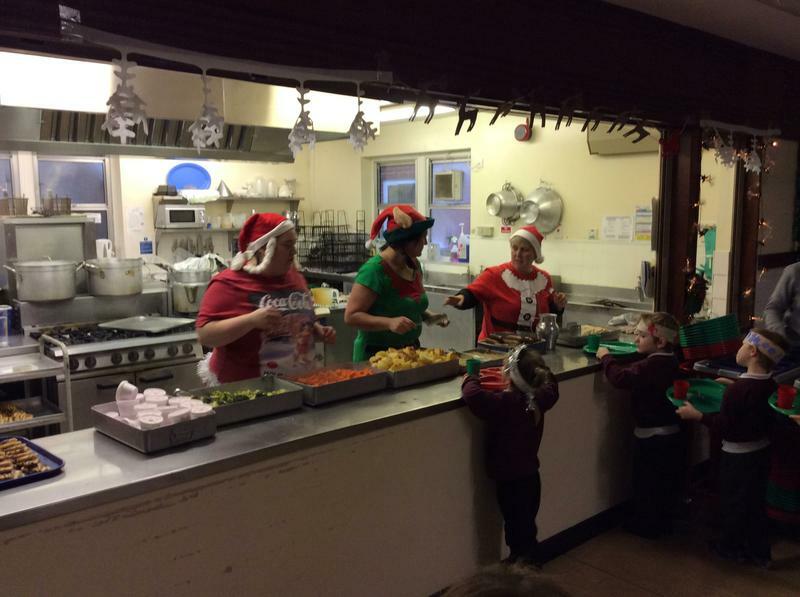 They all sang and danced with great enthusiasm and it was a joy to watch your faces light up with Christmas cheer. 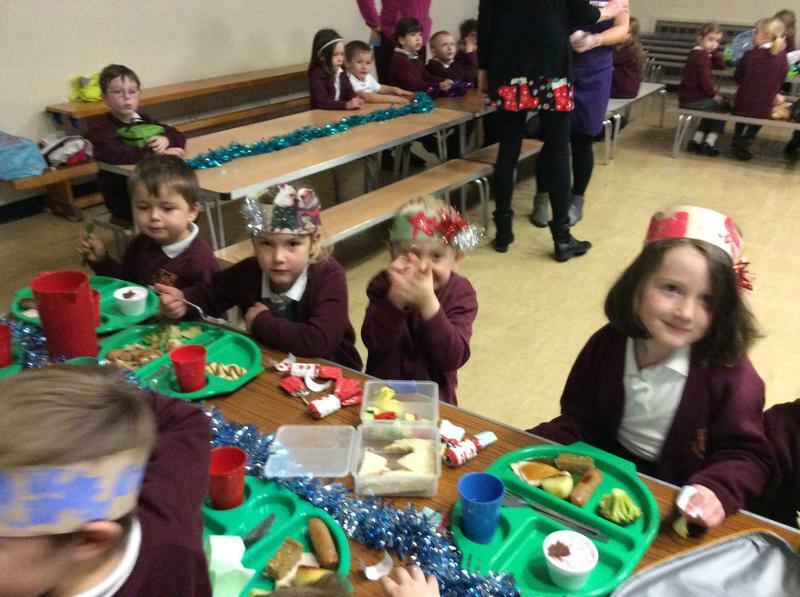 Thank you Indio ... you did us proud! 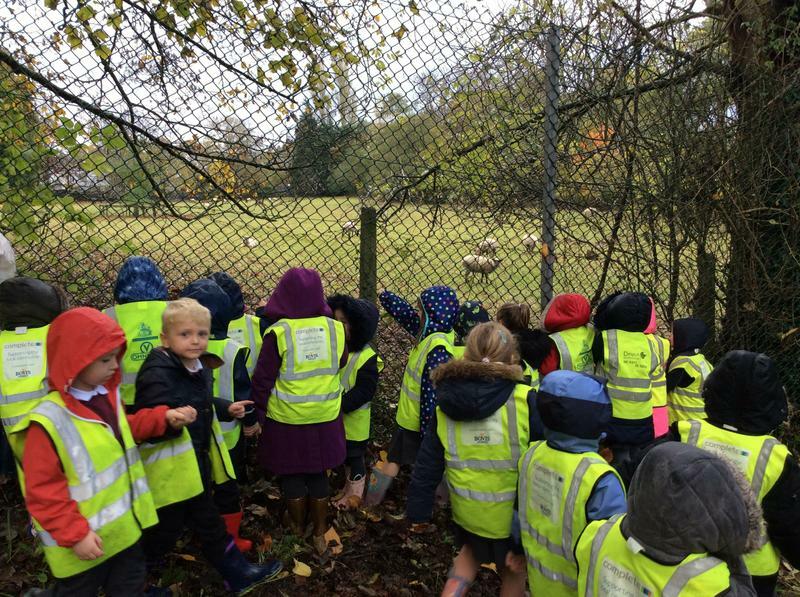 A very wet welly walk this week. 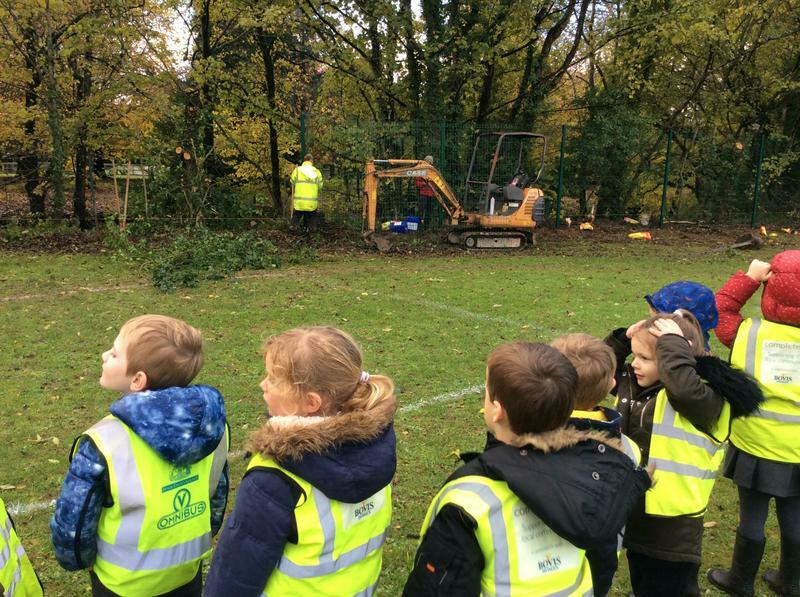 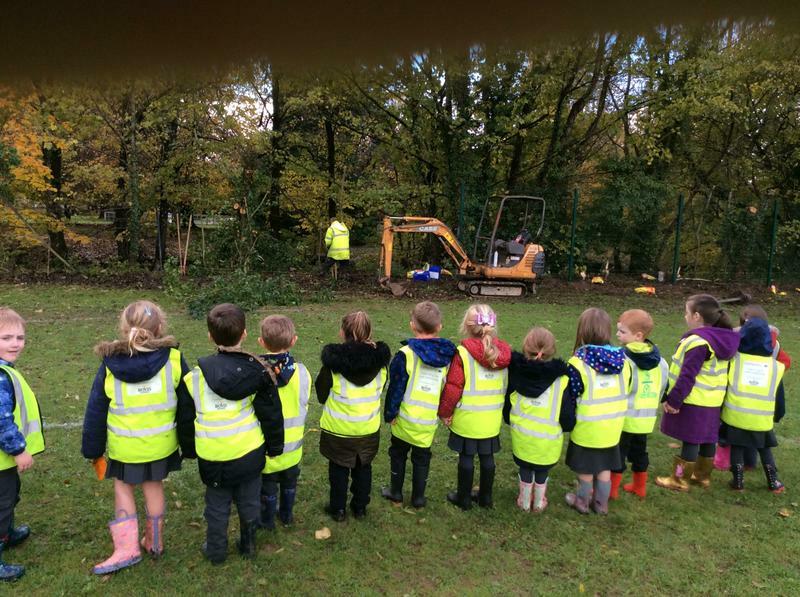 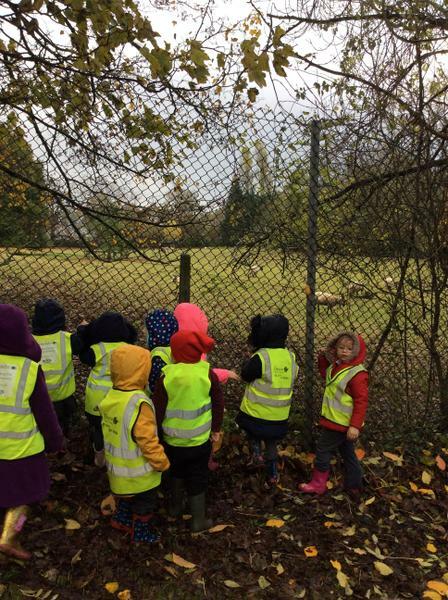 We loved watching the sheep, grazing in the field and then we watched the workmen putting in the new fencing to keep us safe in our school field. 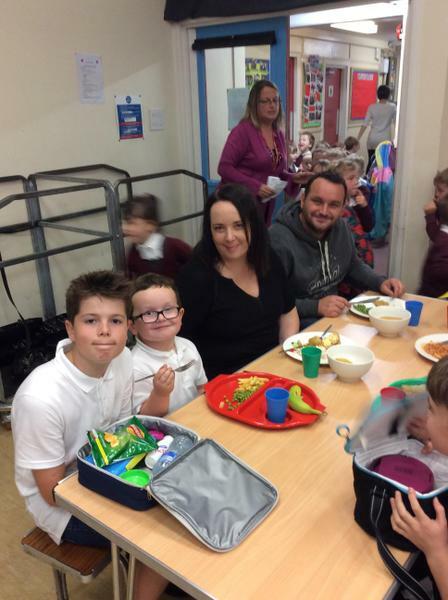 Our families joined us at school for our phase sharing afternoon. 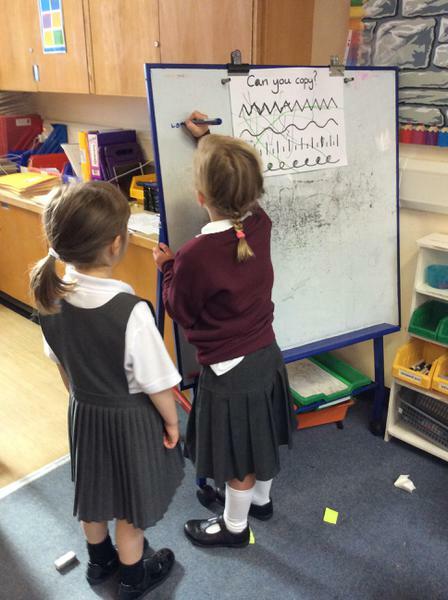 We shared how we are using phonics to help us learn to read! 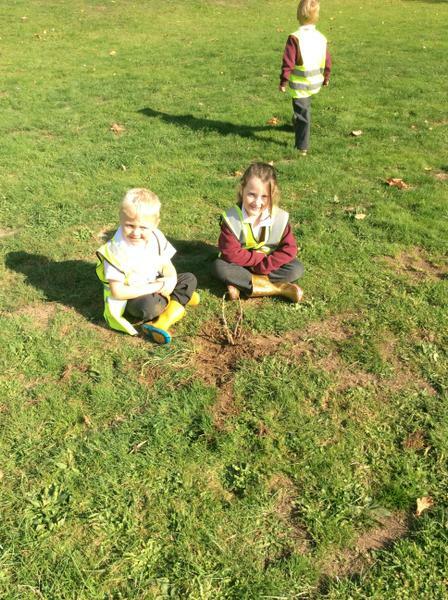 A sunny welly walk this week! 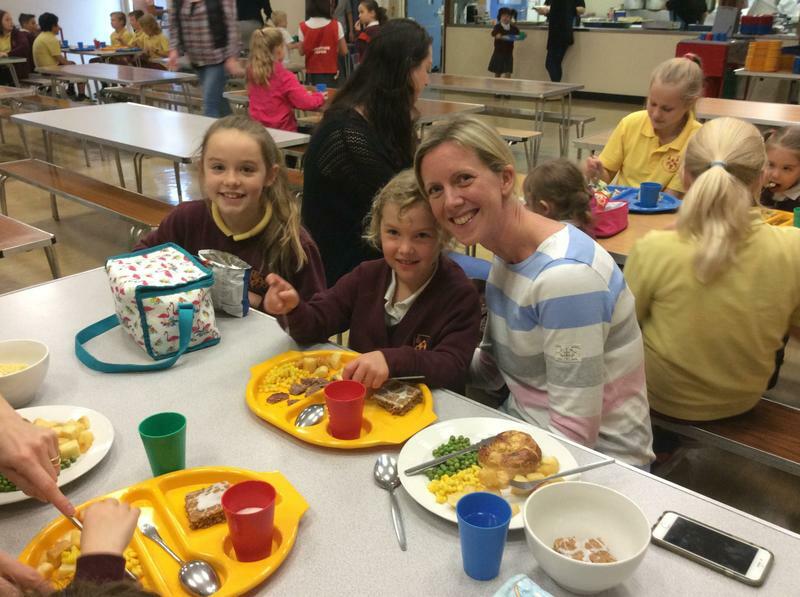 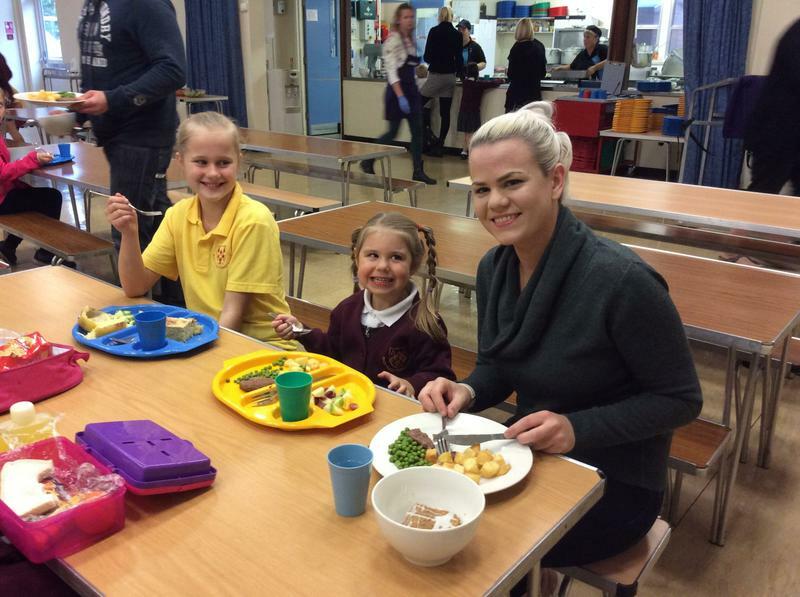 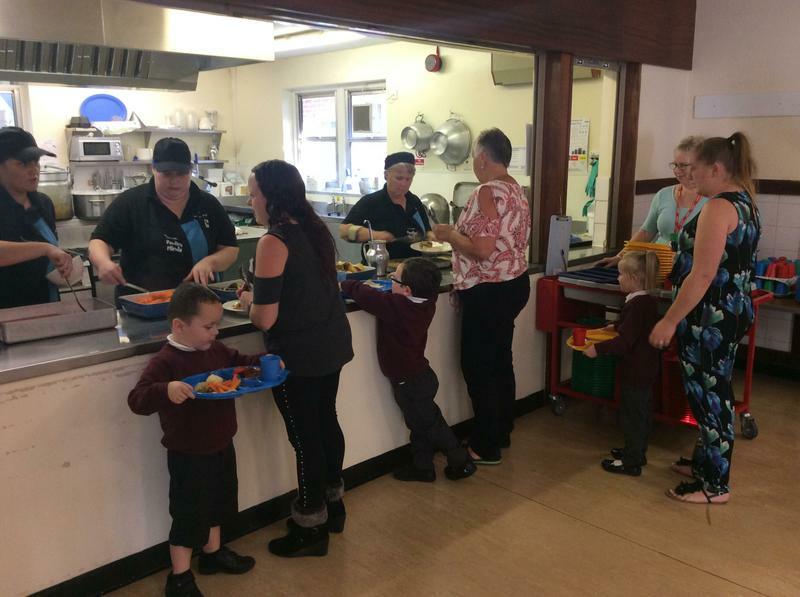 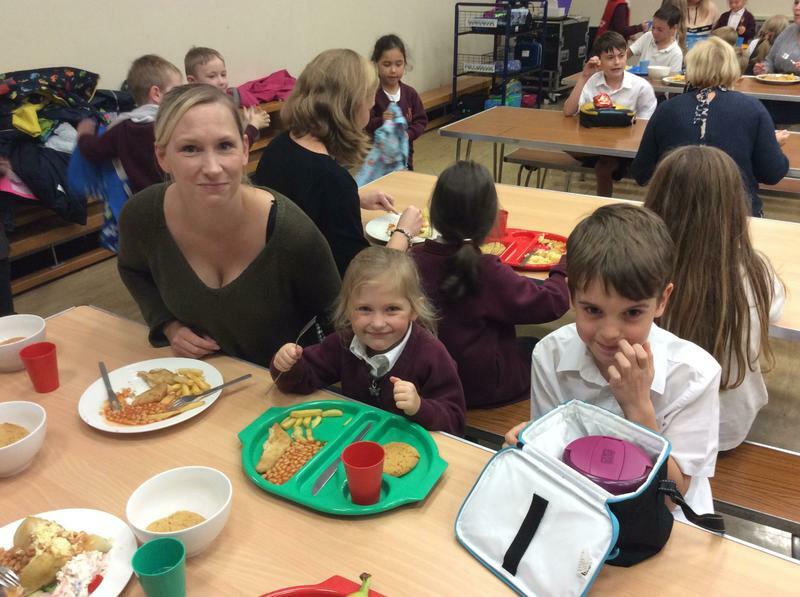 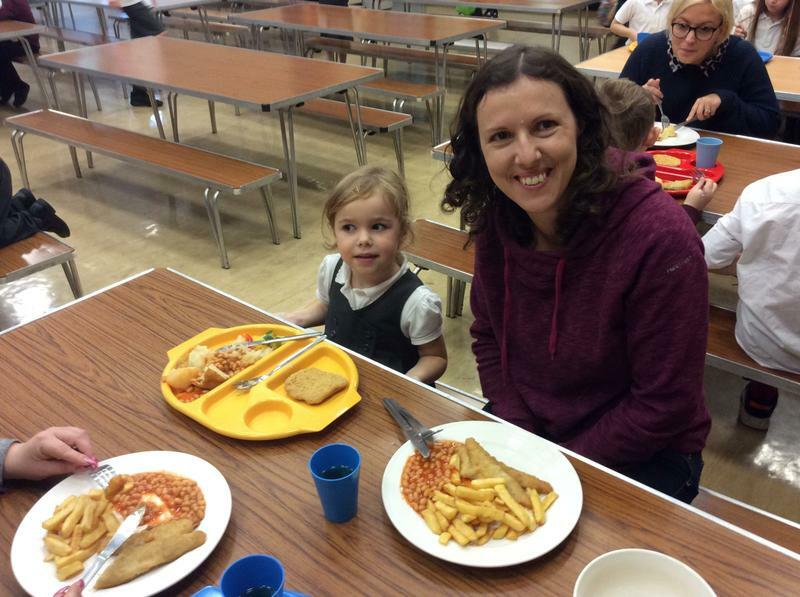 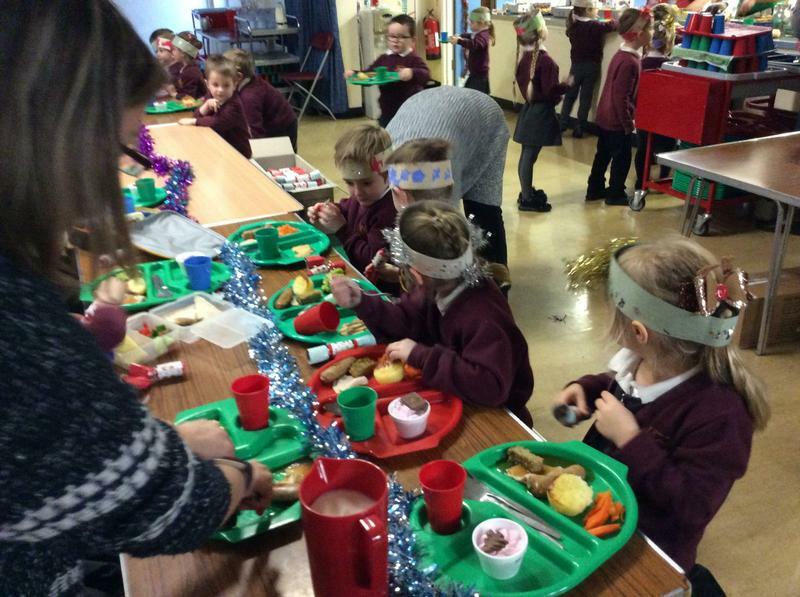 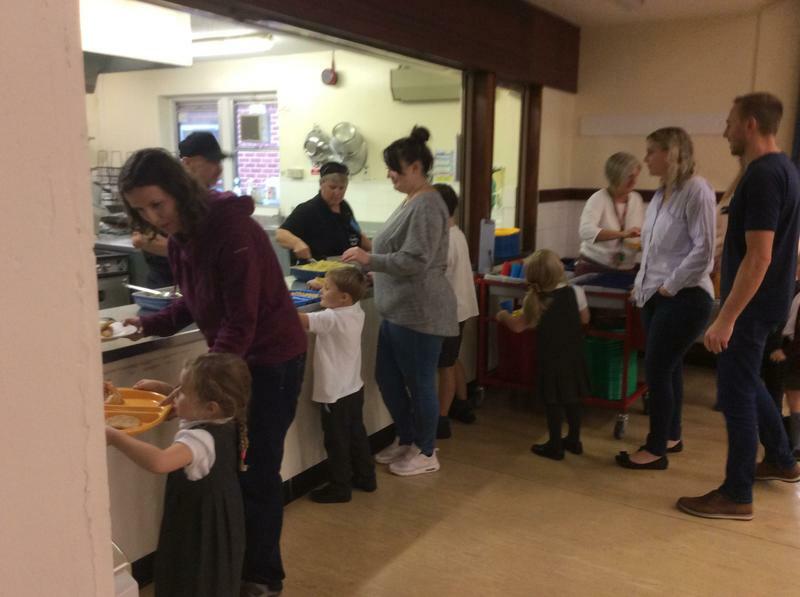 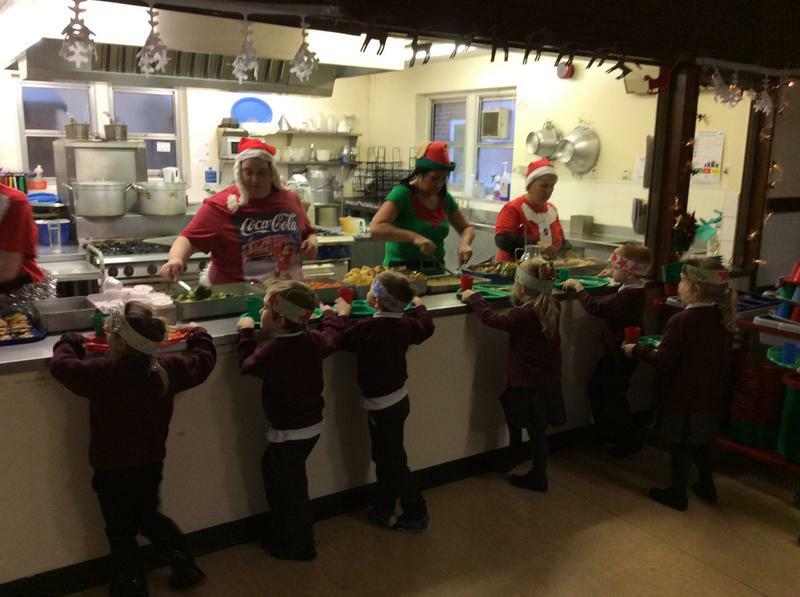 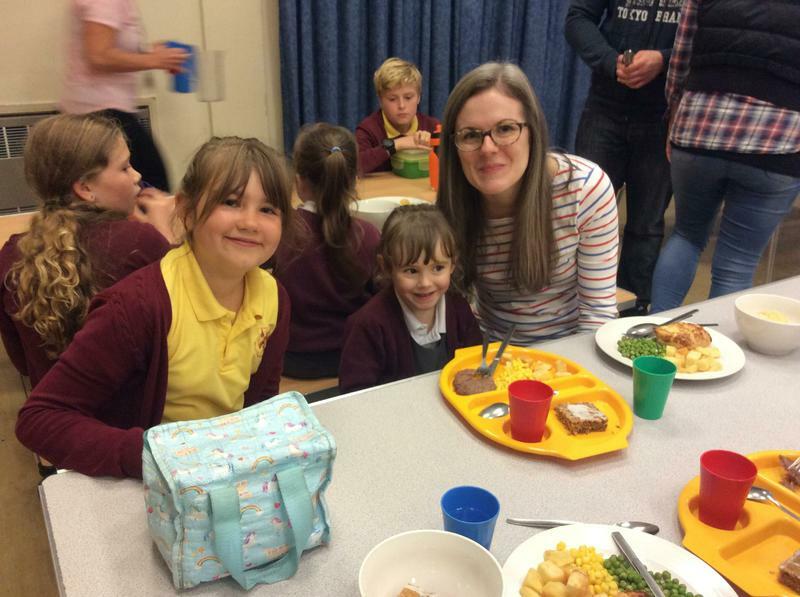 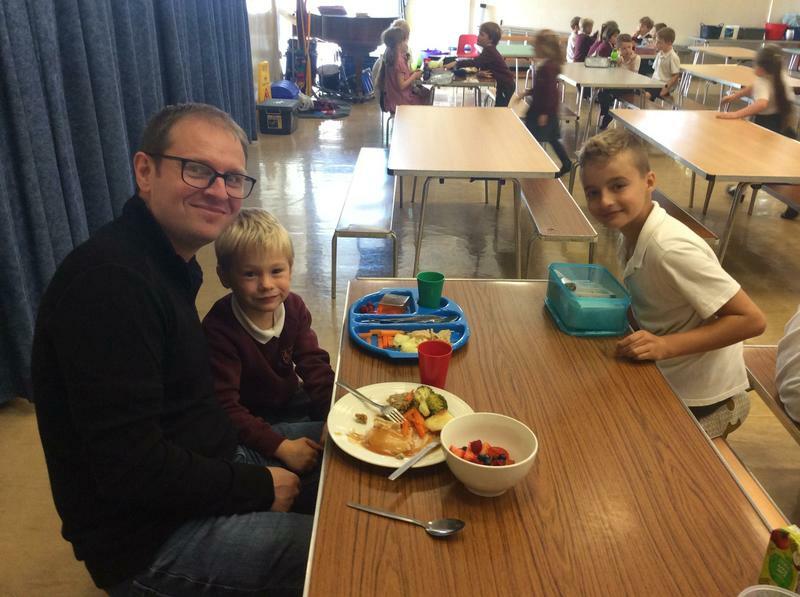 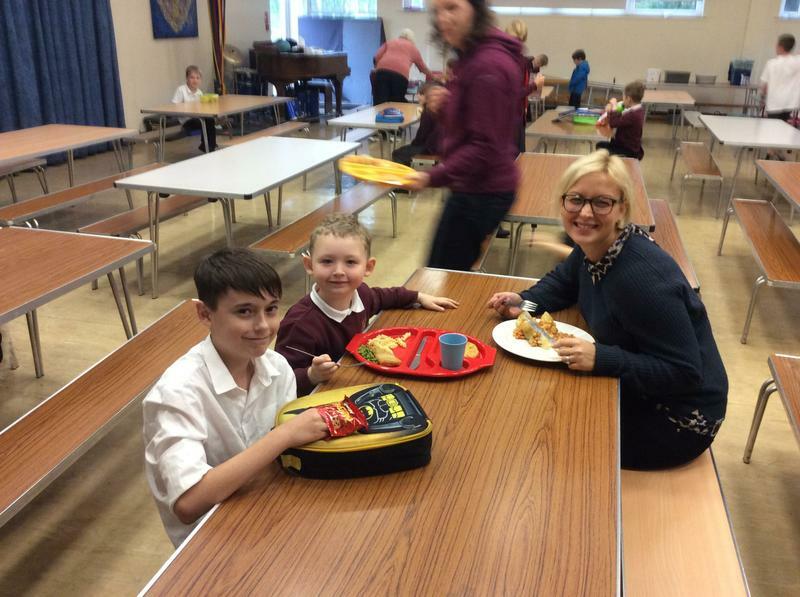 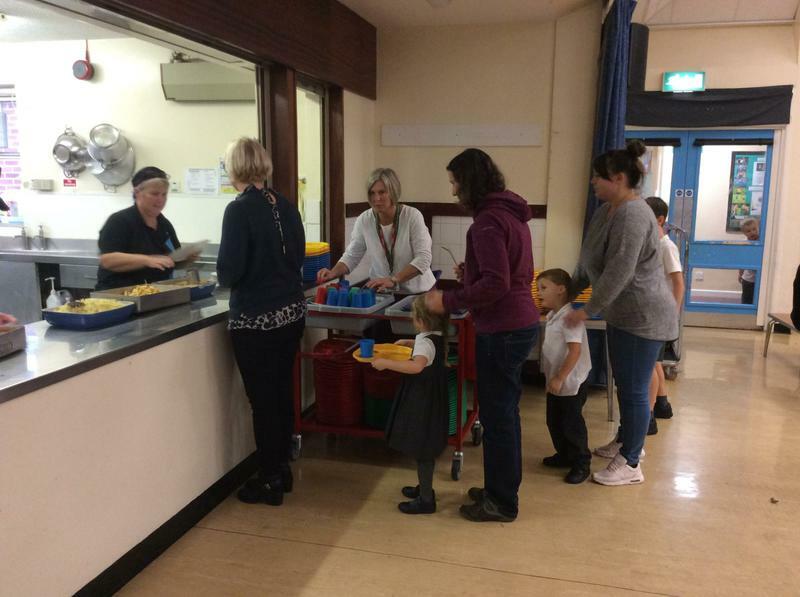 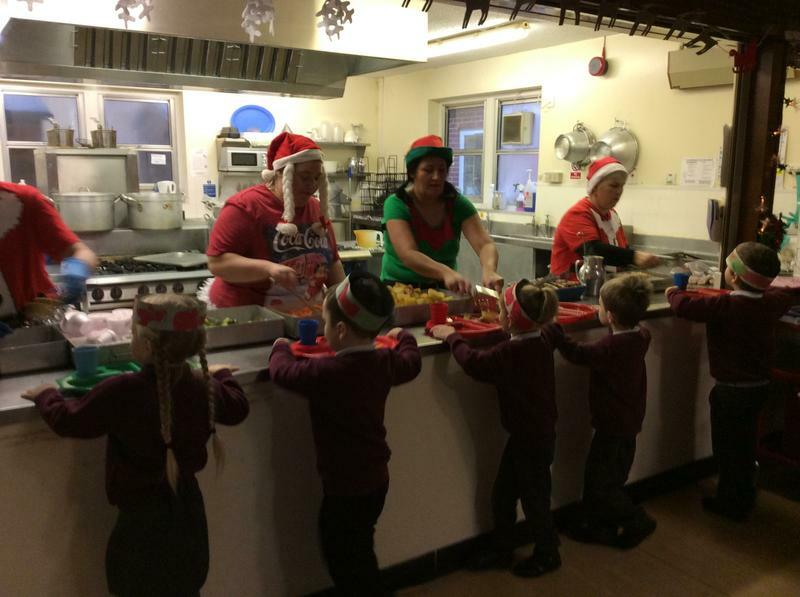 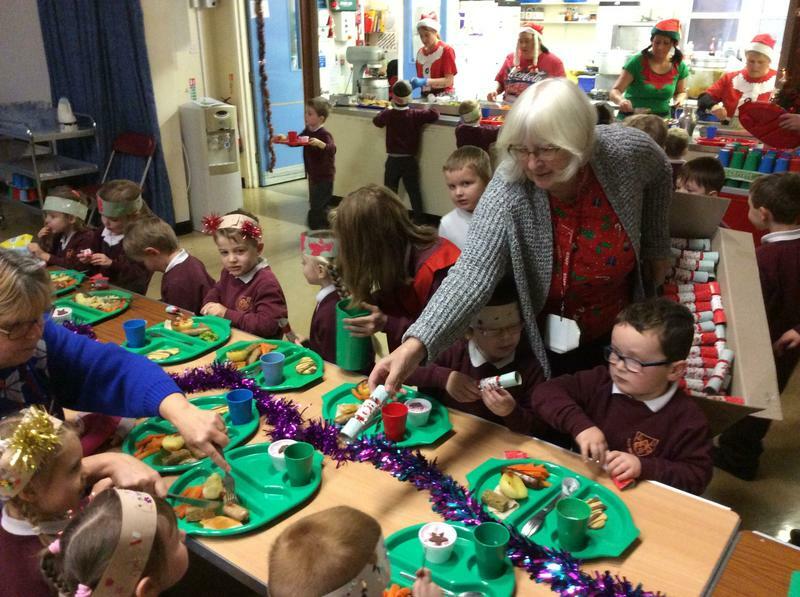 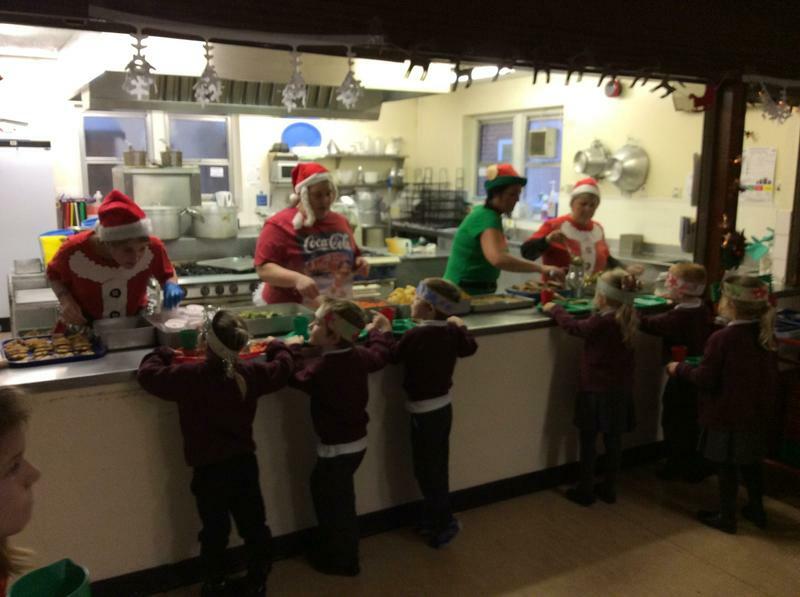 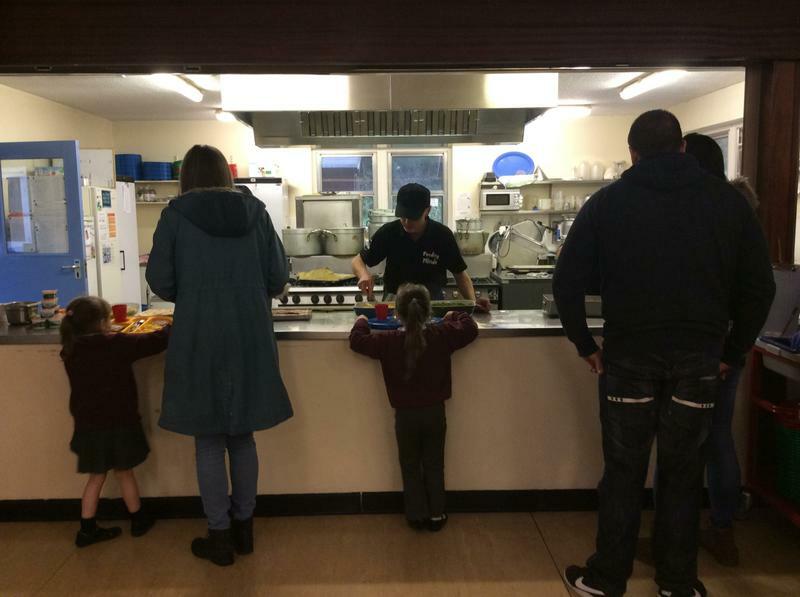 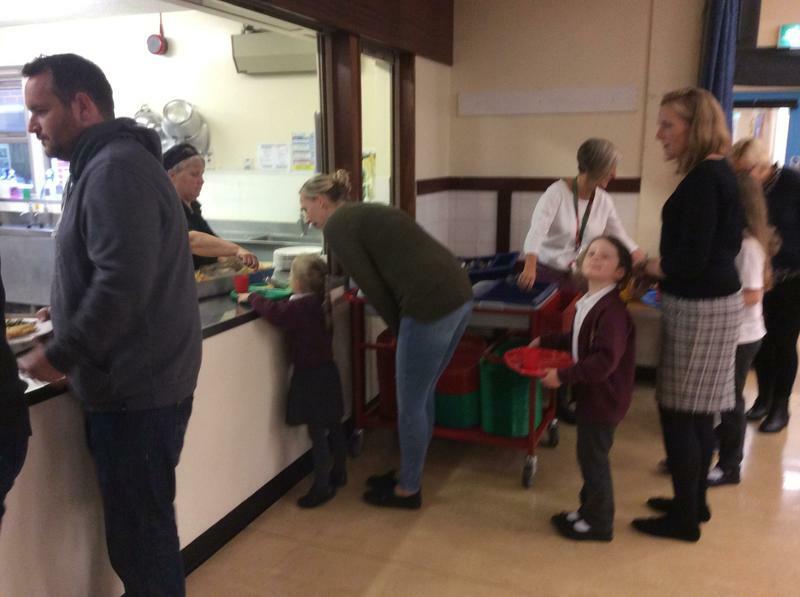 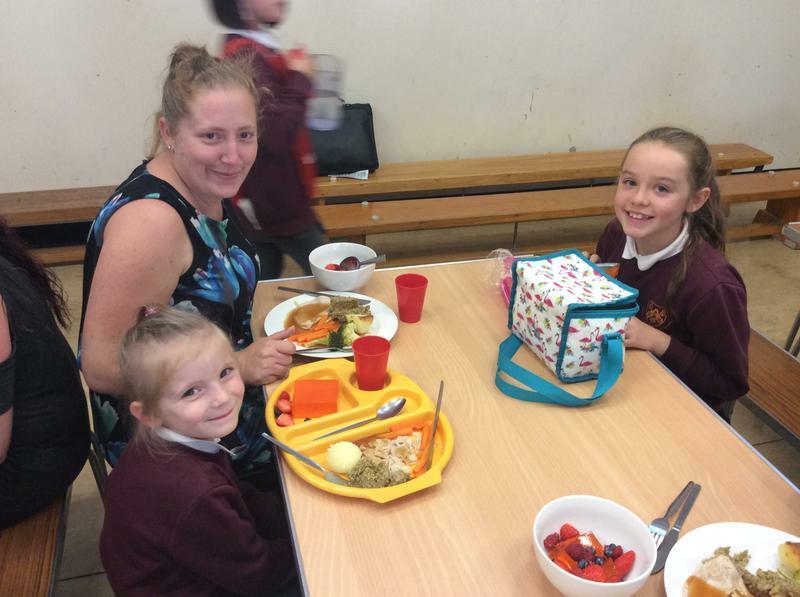 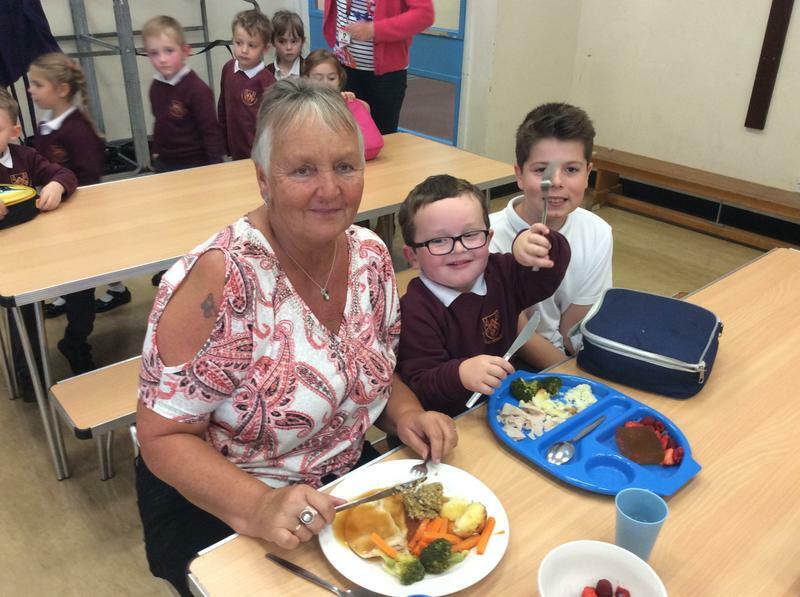 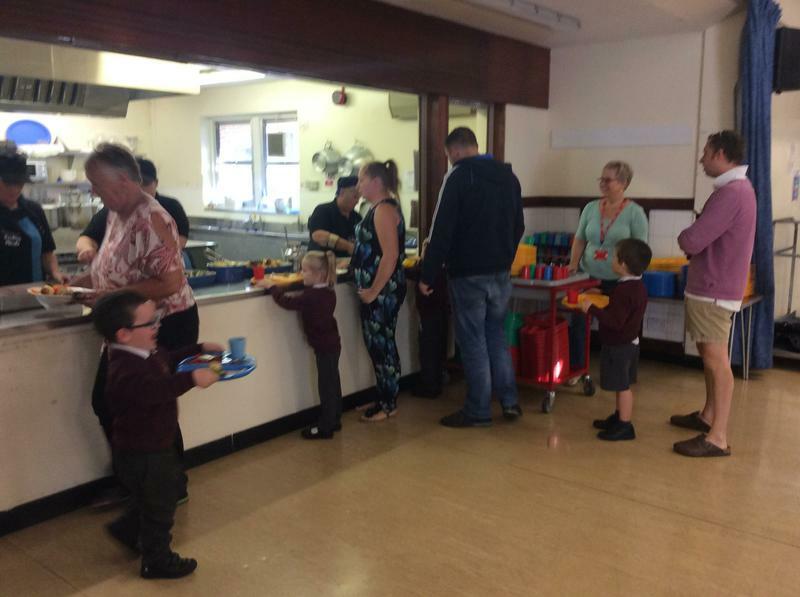 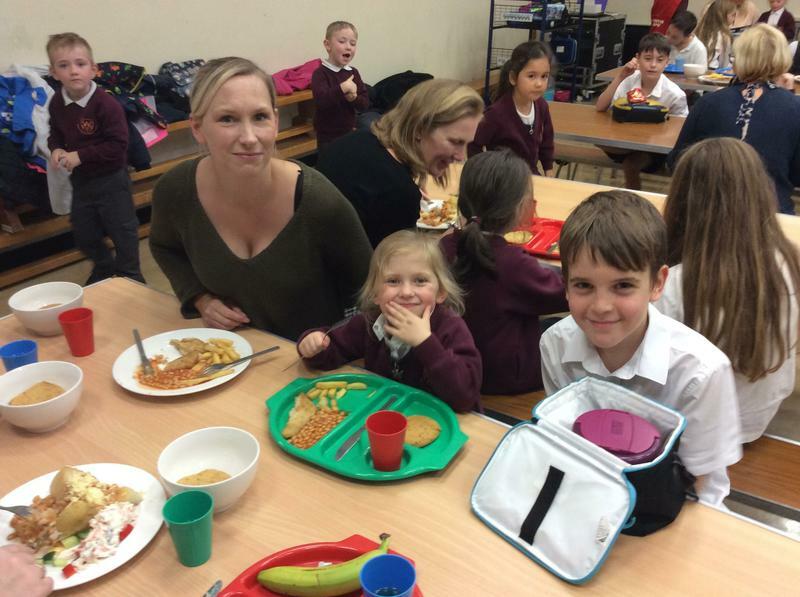 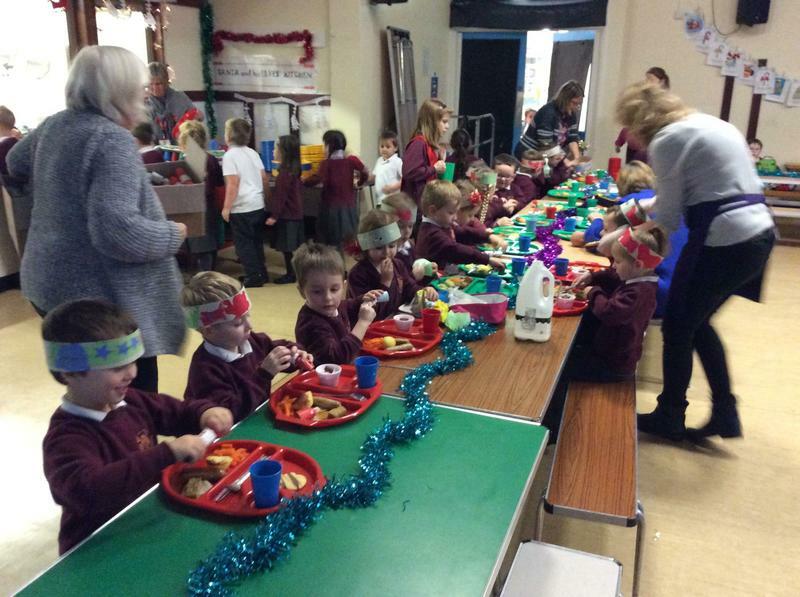 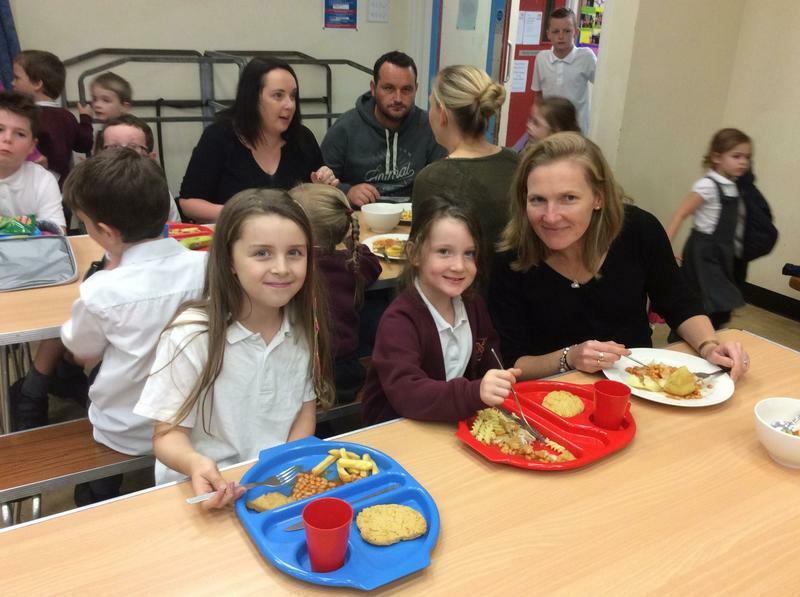 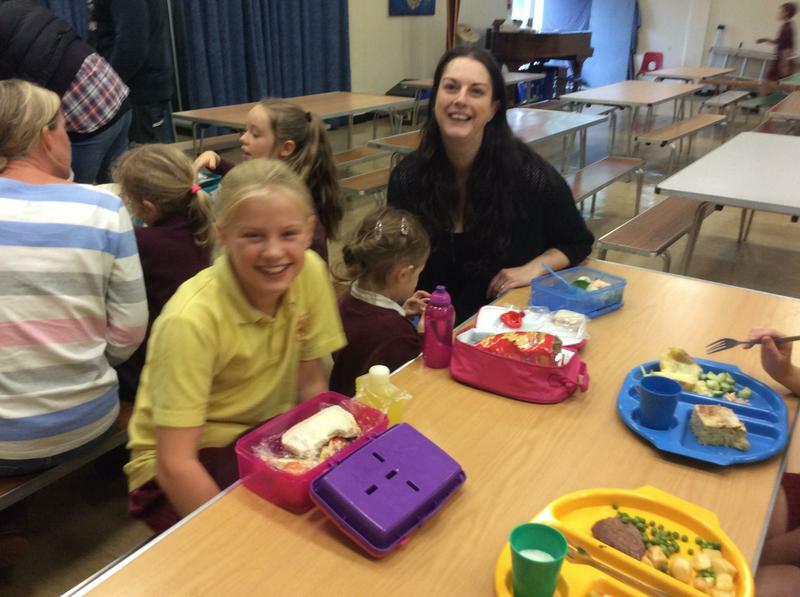 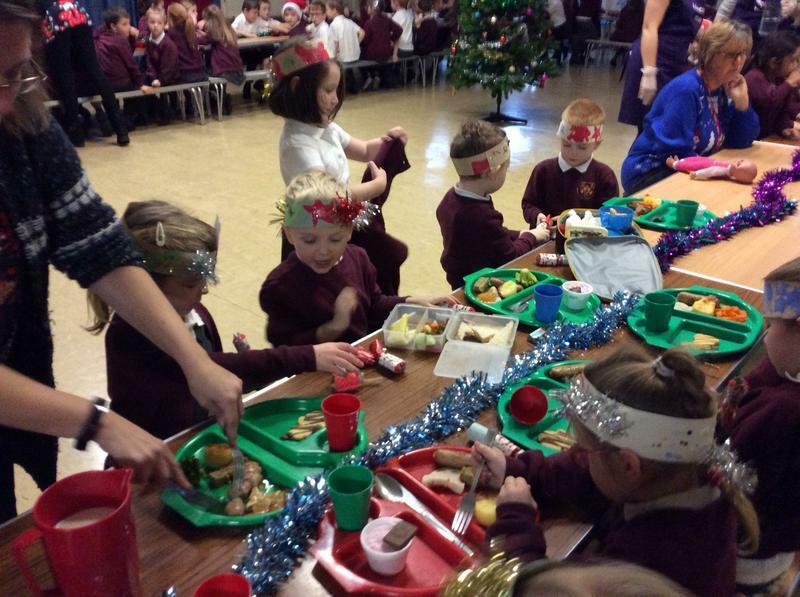 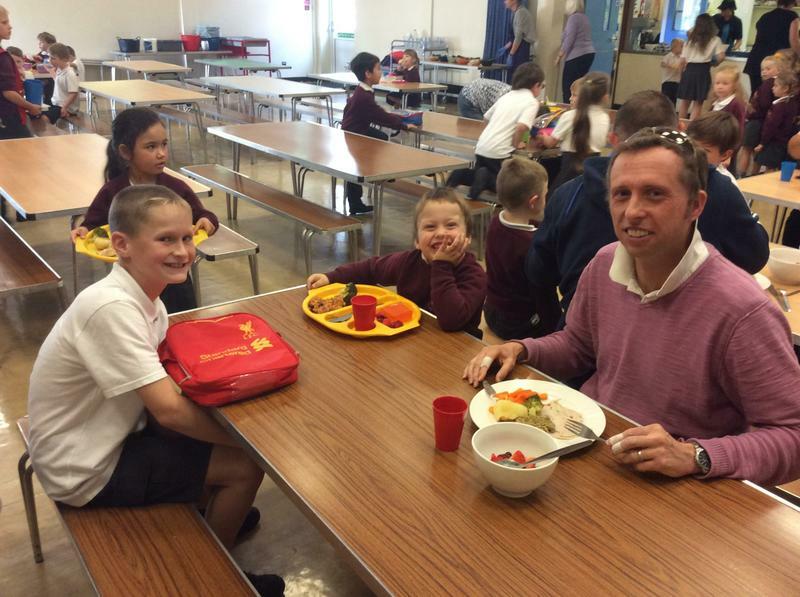 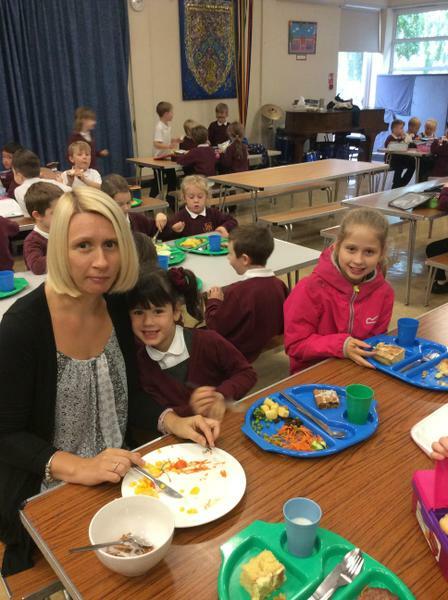 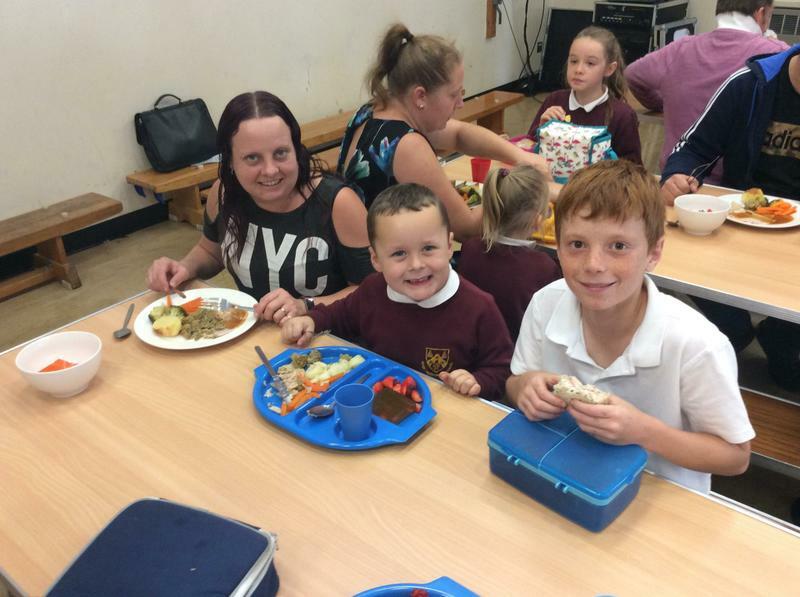 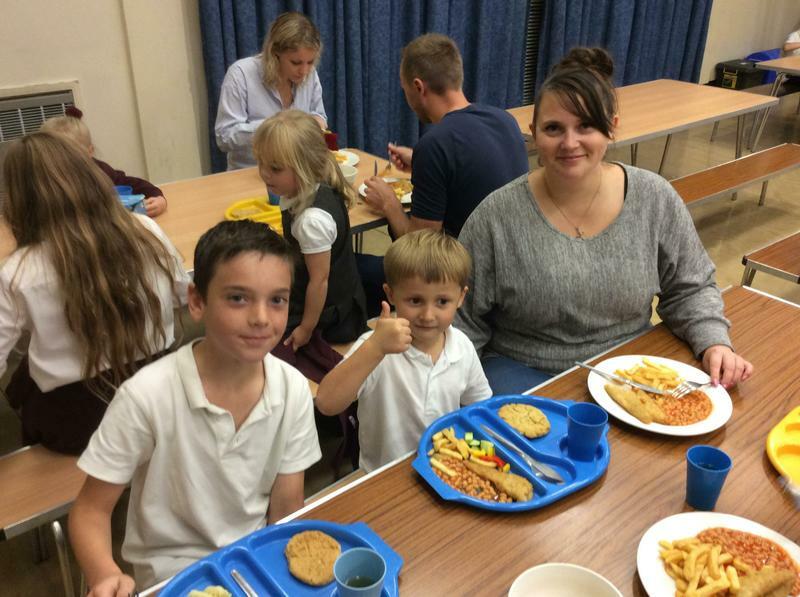 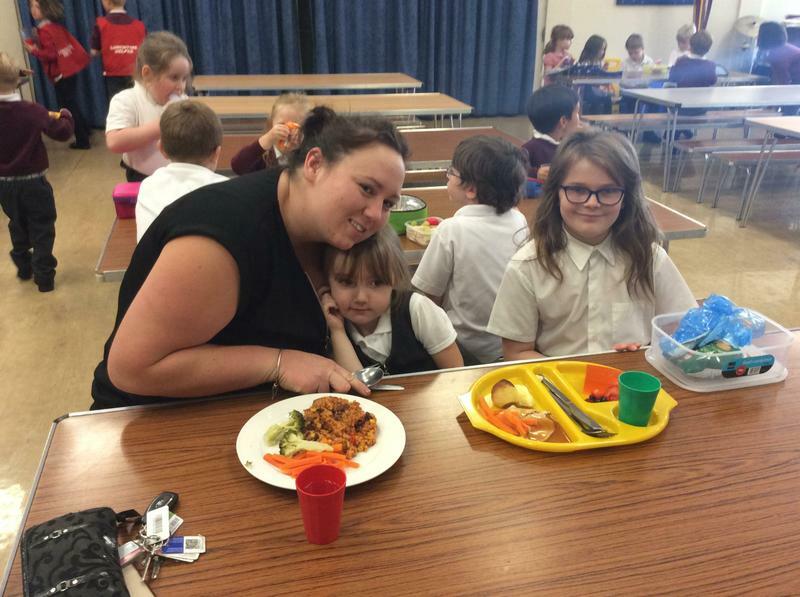 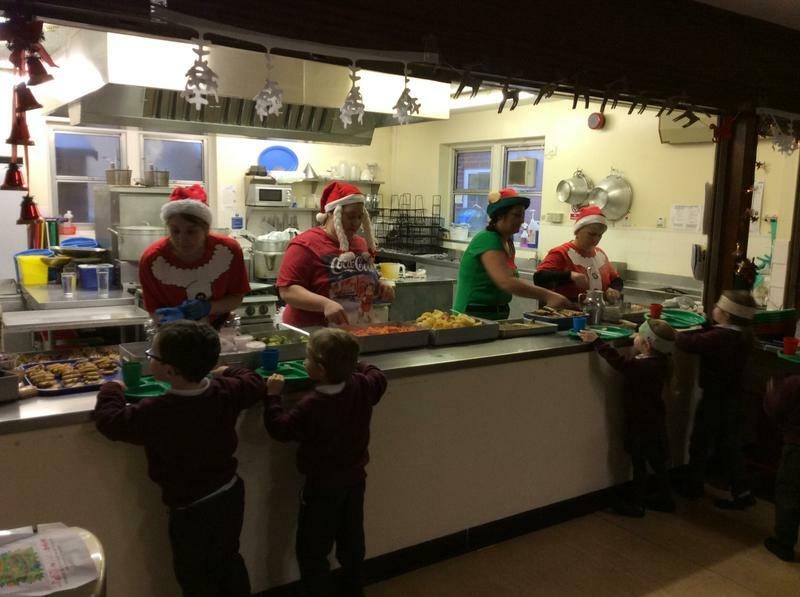 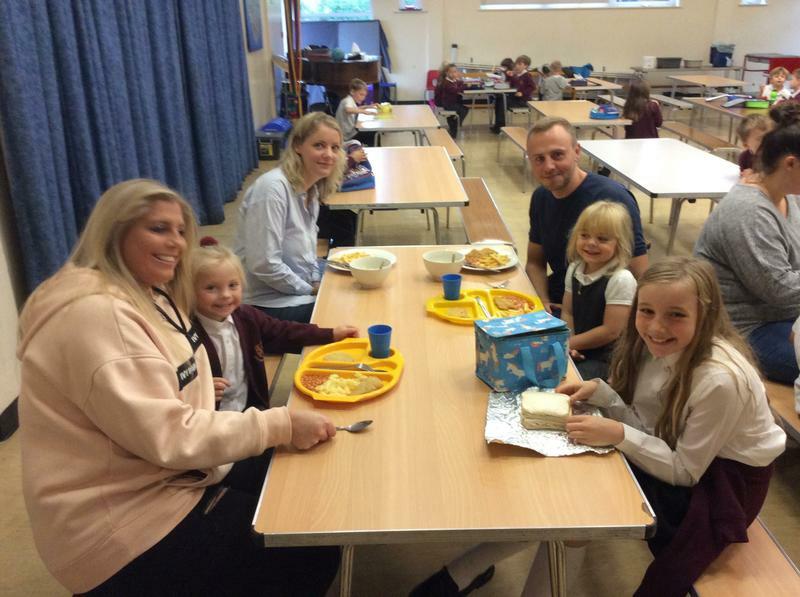 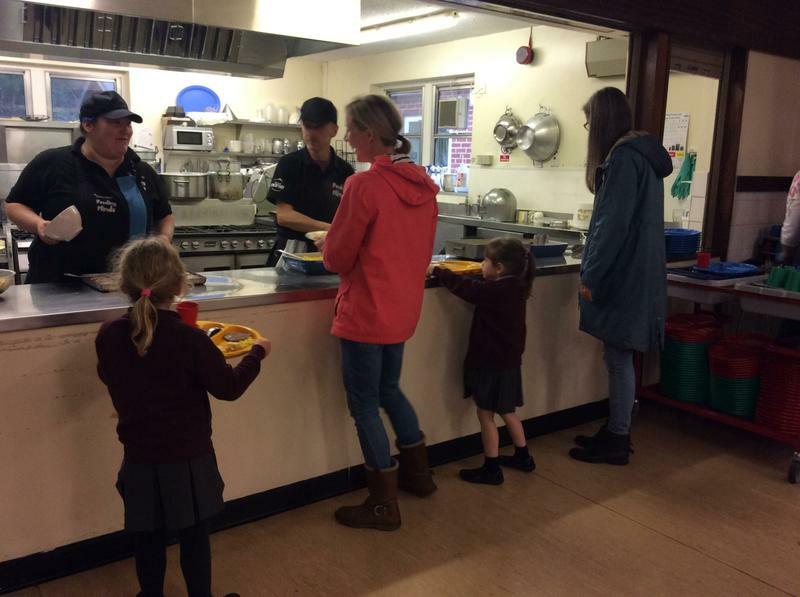 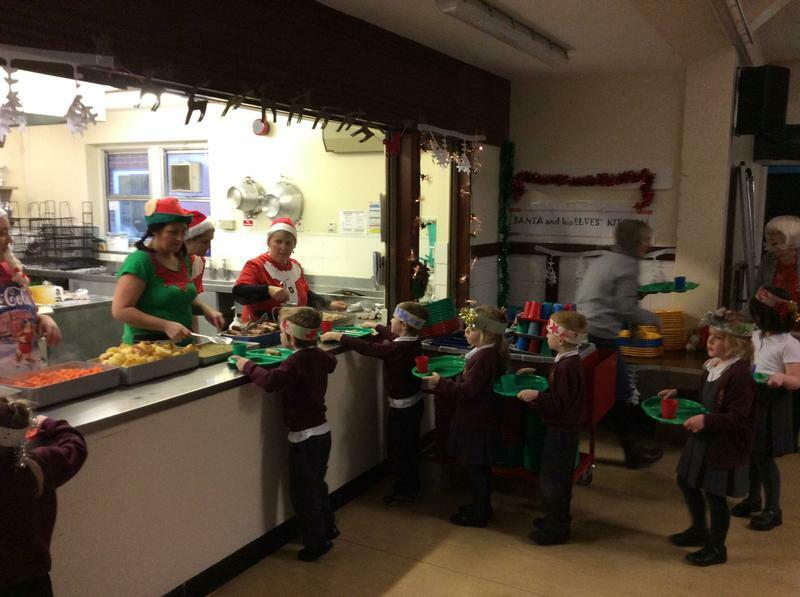 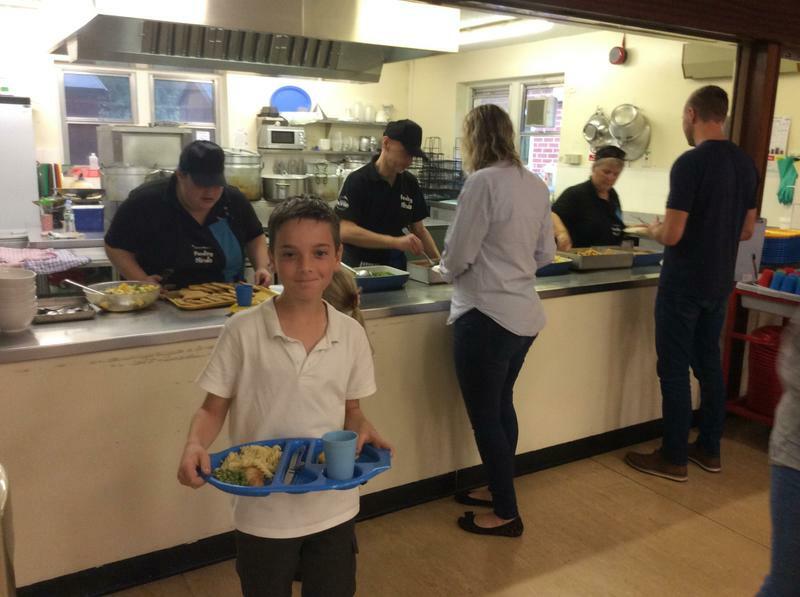 This week our families joined us for a scrummy school dinner. 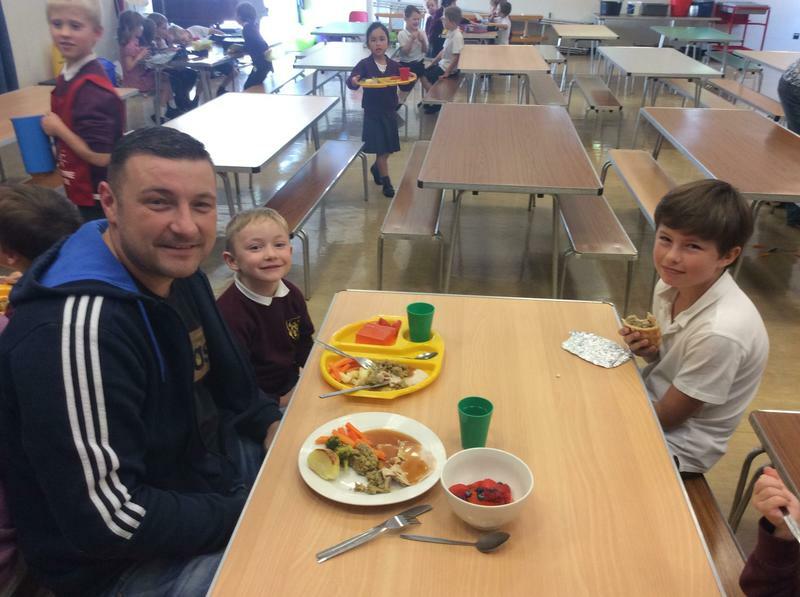 We invited our older buddies to join us too, so they could get to know our families more. 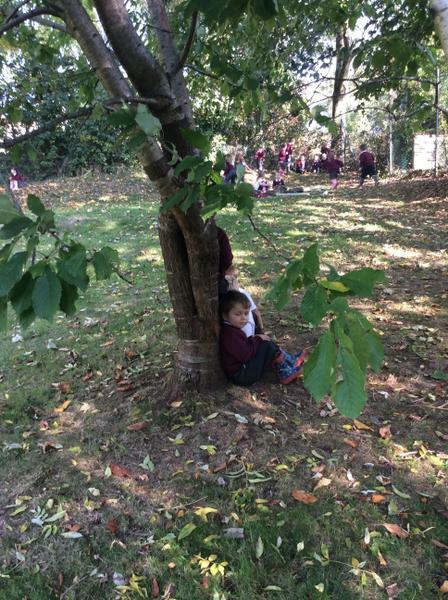 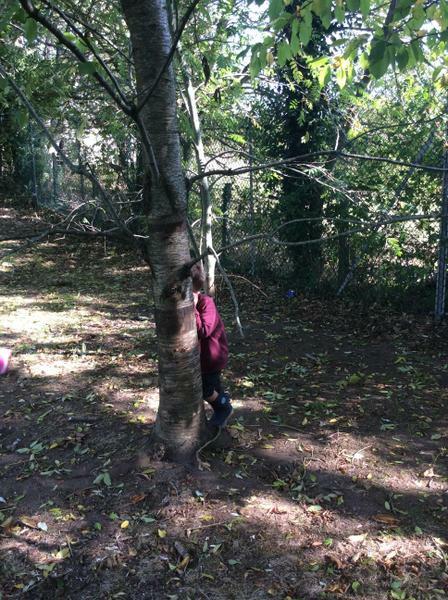 Strikey (our naughty class puppet) decided to hide from us on our welly walk this week. 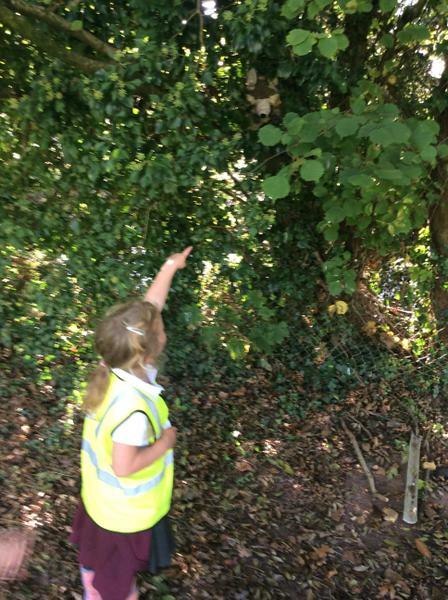 After lots of searching we found him up a tree! 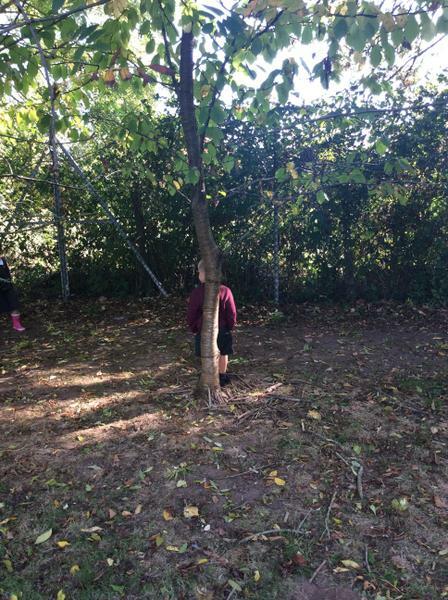 Then we all had a lovely big game of hide and seek. 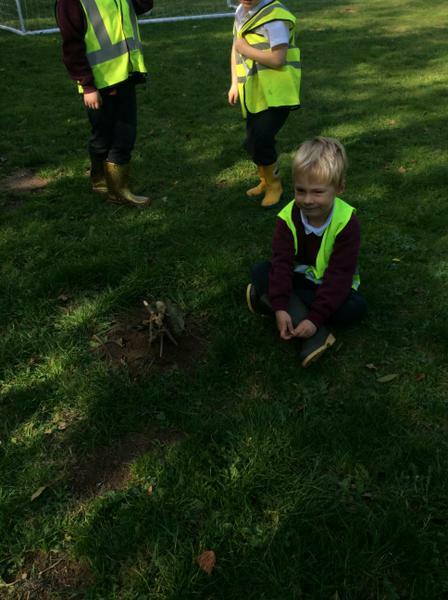 We all had a go at making little shelters or hides for small creatures before heading safely back to school (with Strikey)! 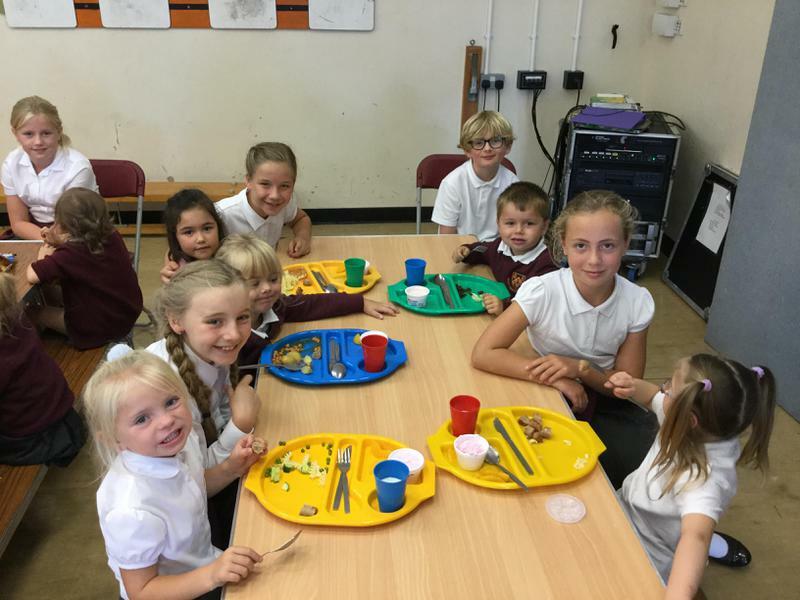 Congratulations to our first TOP DOJOs in Indio. 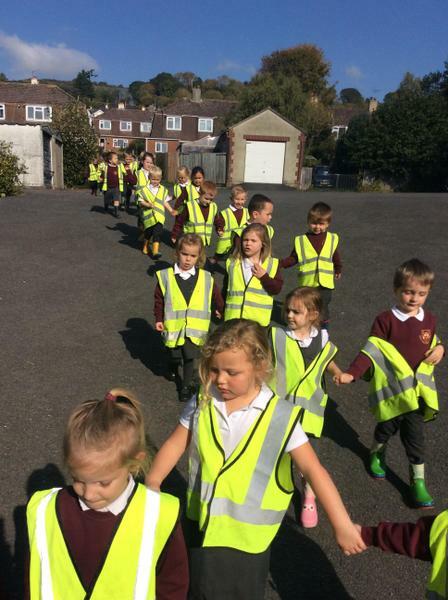 A Wonderful Wednesday Welly Walk! 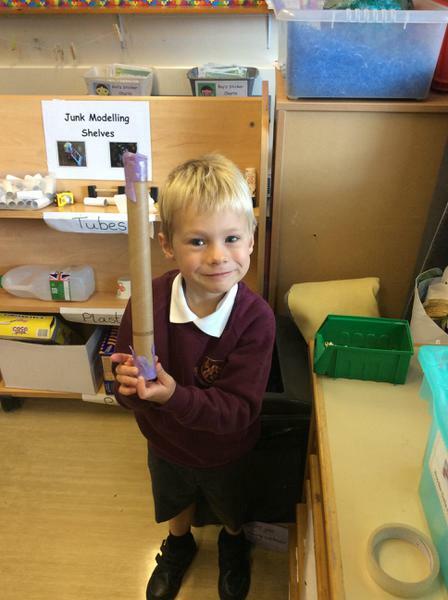 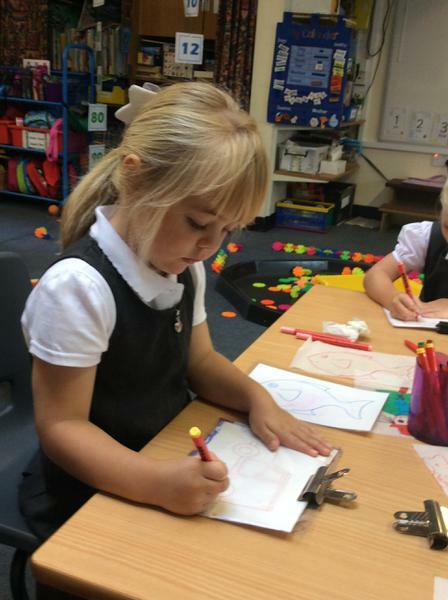 We have had lots of fun in class. 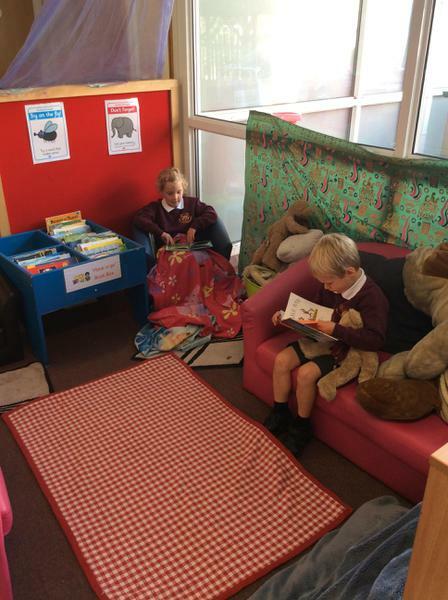 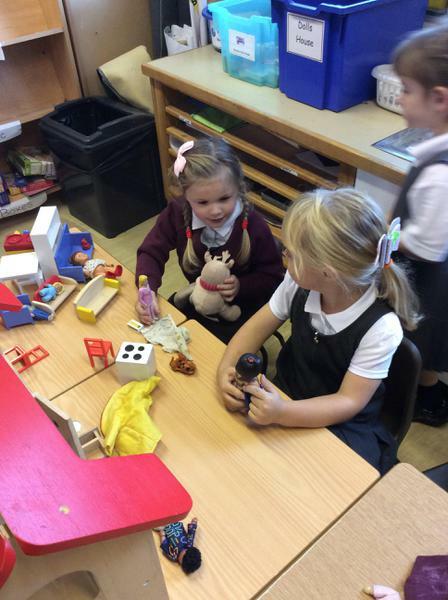 We are getting to know our new classroom and making lots of new friends. 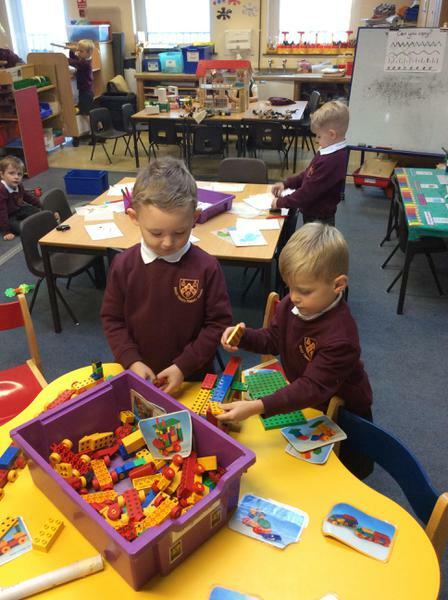 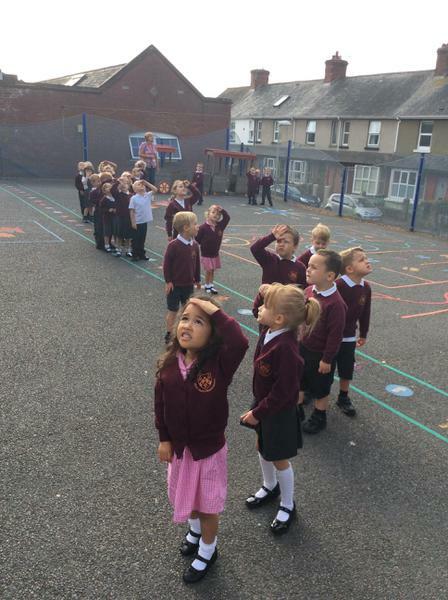 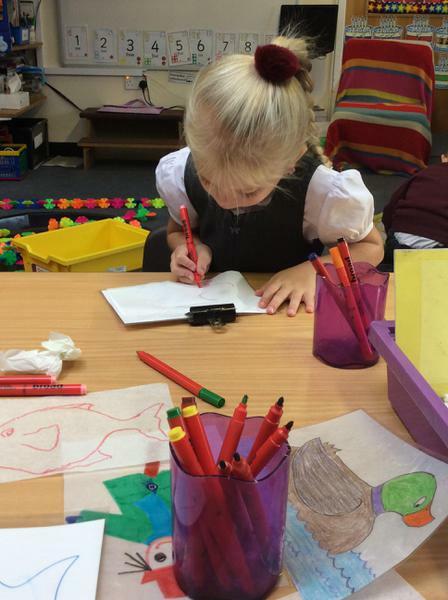 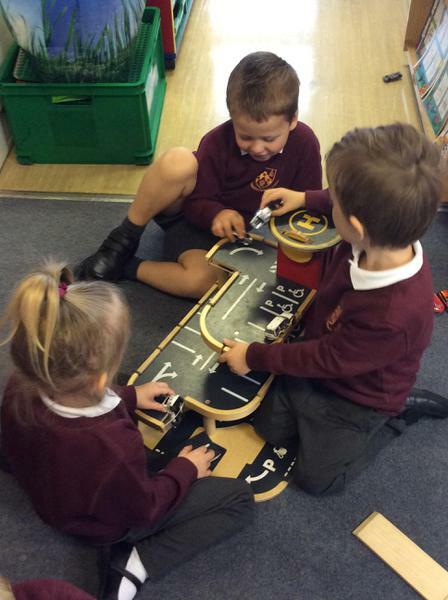 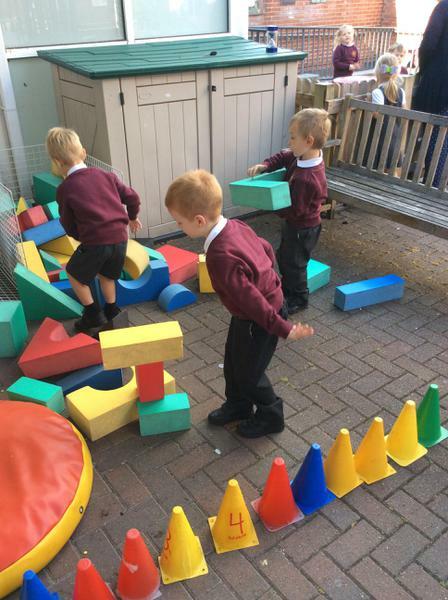 We have had so much fun in our first week at school. 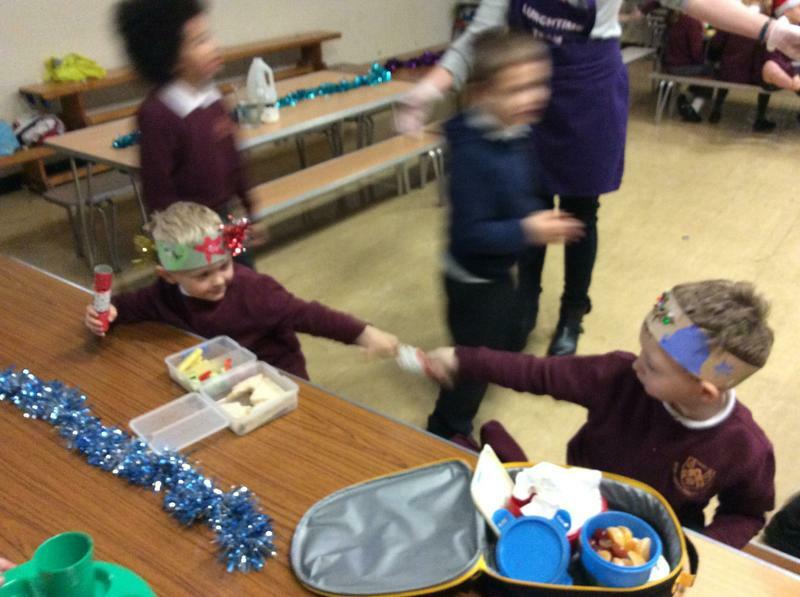 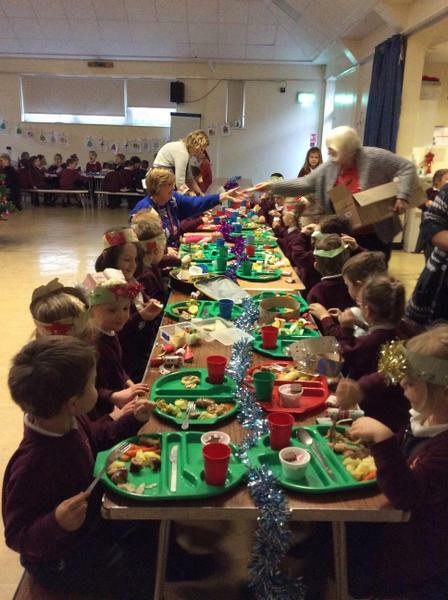 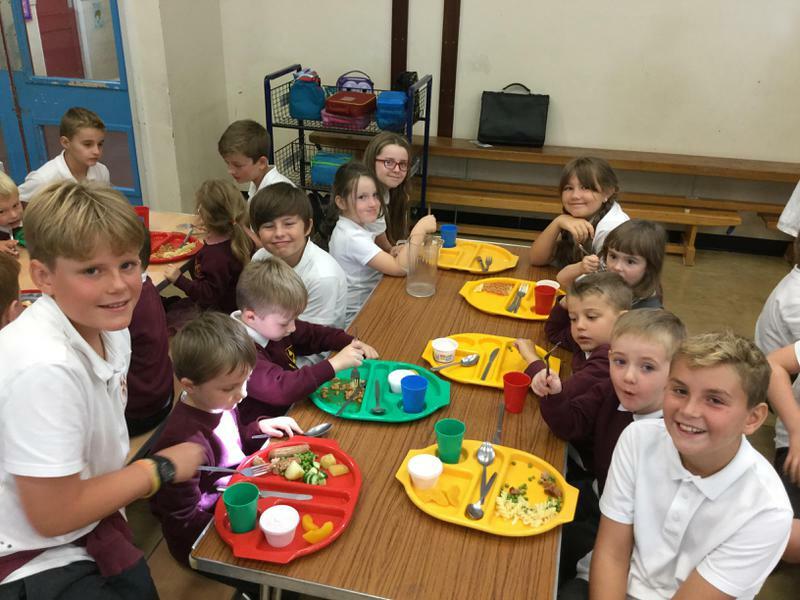 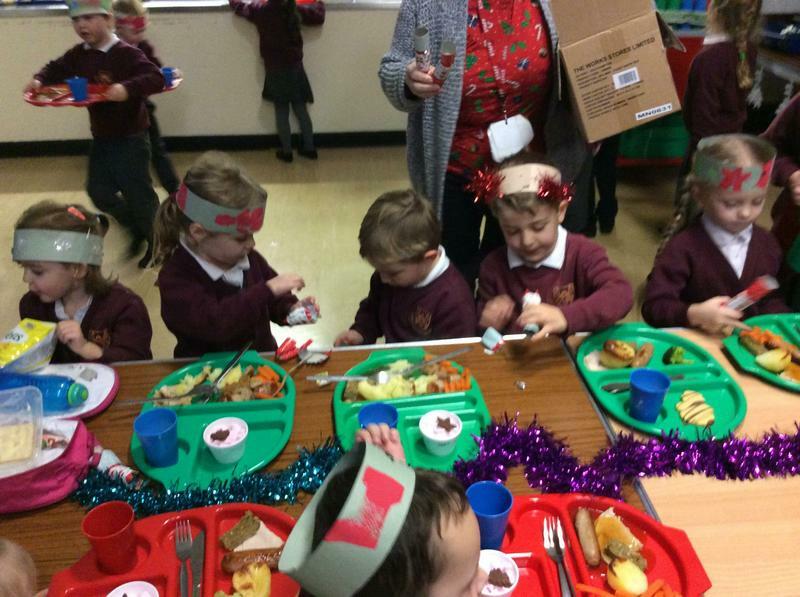 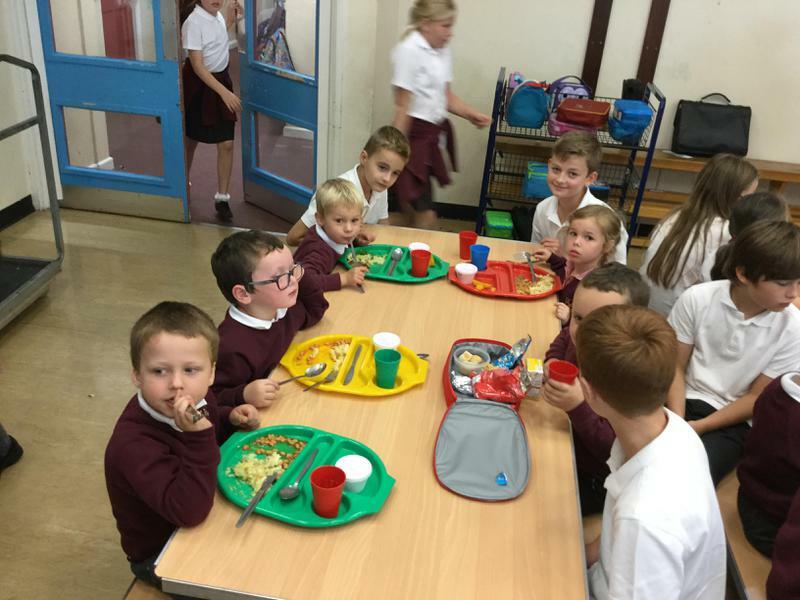 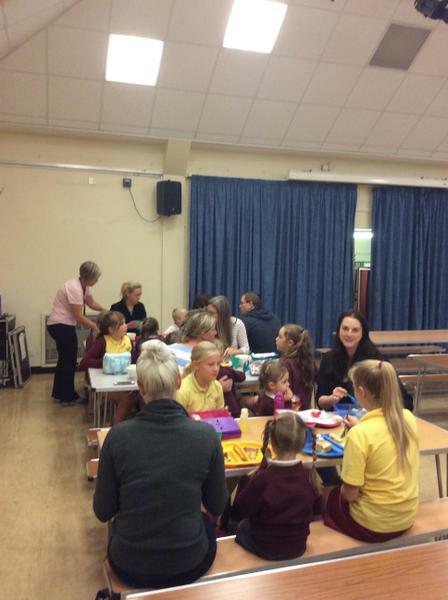 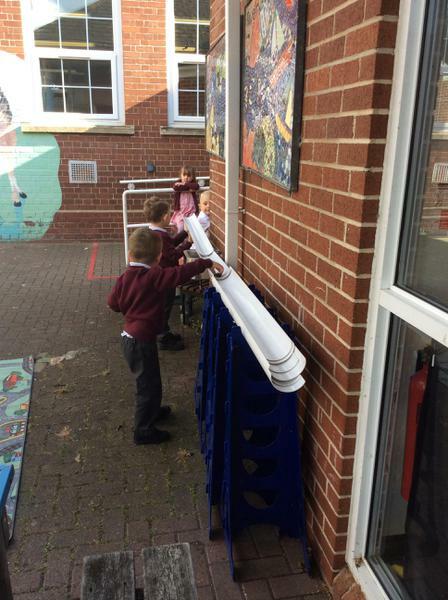 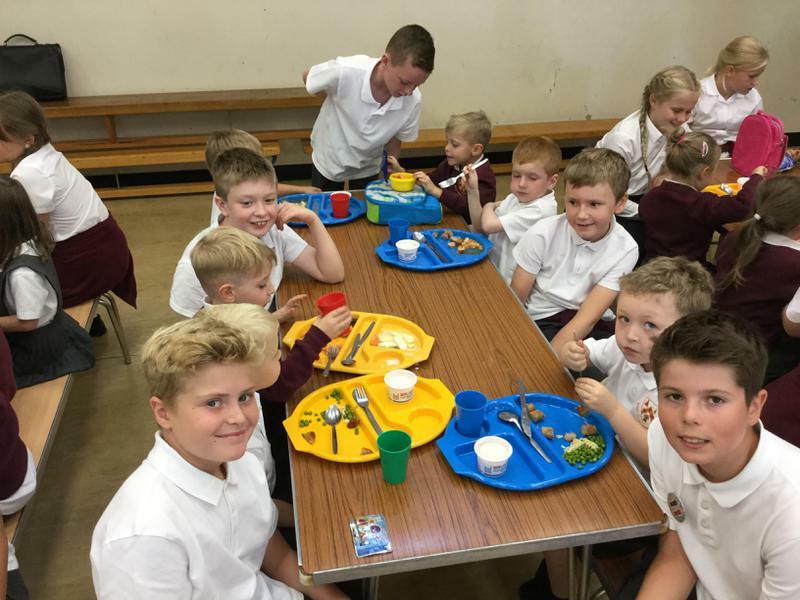 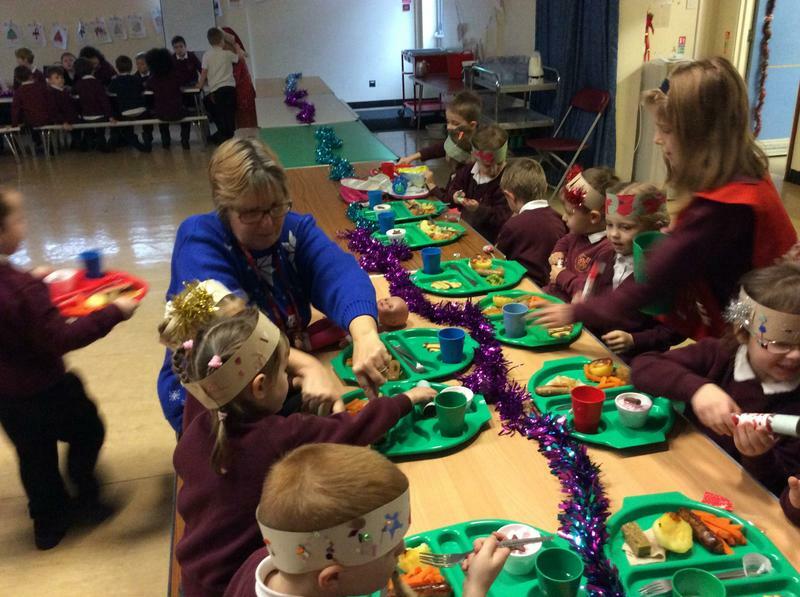 The children in Indio Class have especially enjoyed having lunch with their big buddies. 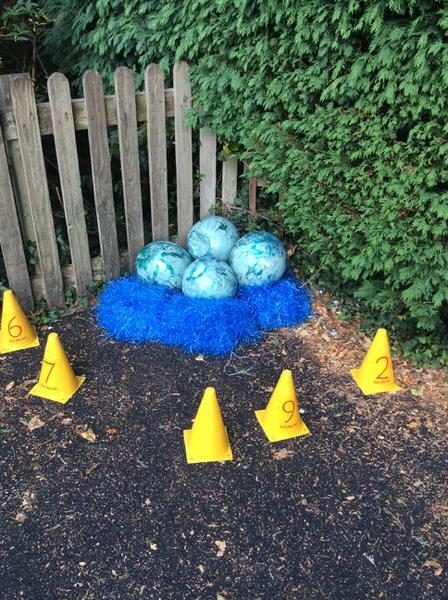 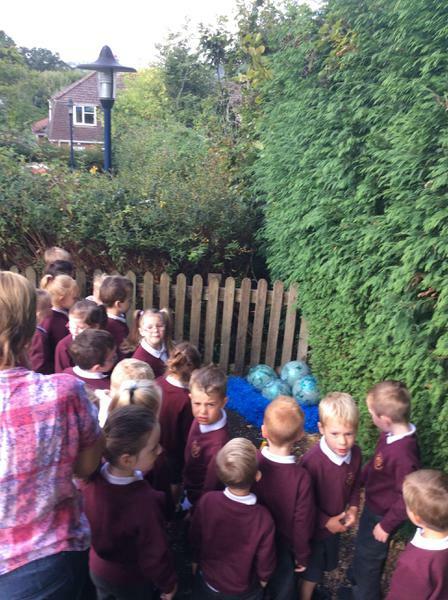 You will not believe what the children in Indio discovered in our school playground this week, a nest full of big, bright, blue eggs. 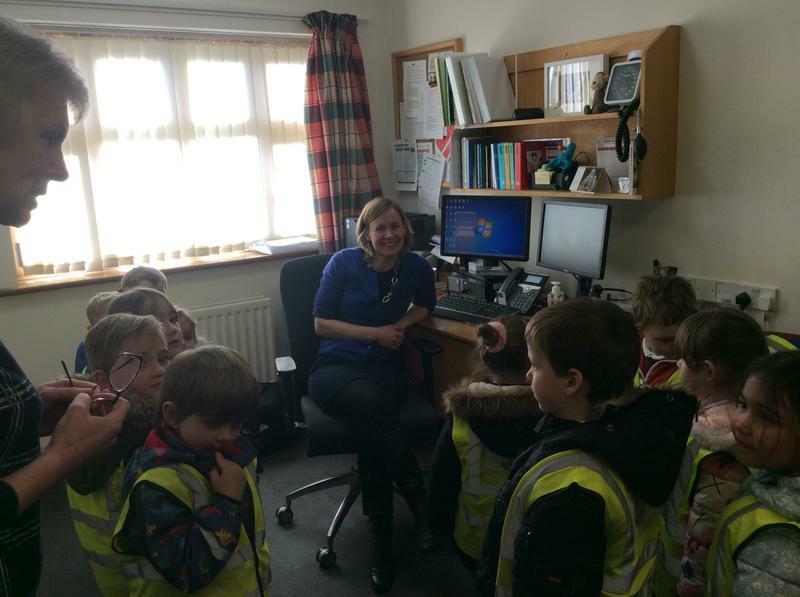 We are not sure what will hatch from the eggs so we have taken one into our class to look after it until it hatches! 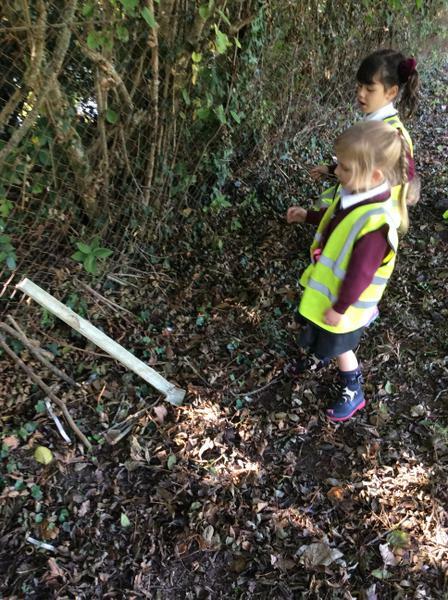 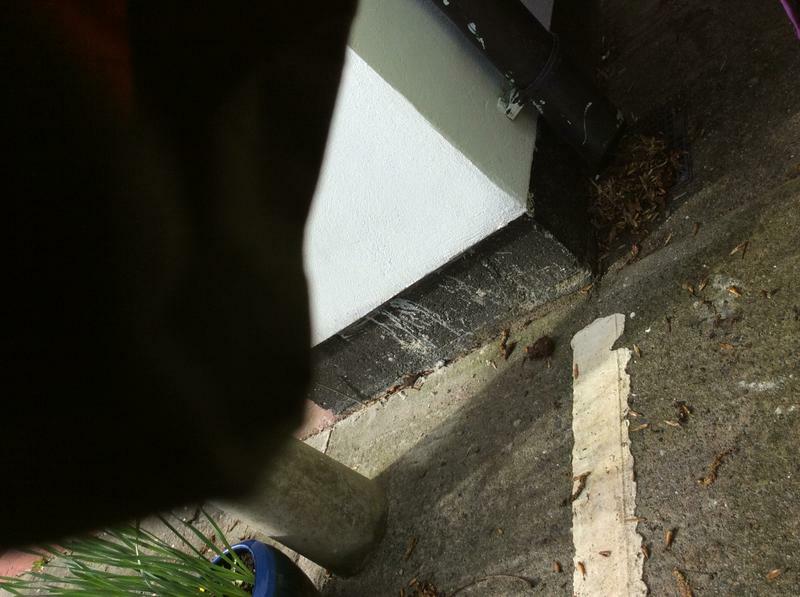 We have had lots of fun guessing what it may be. 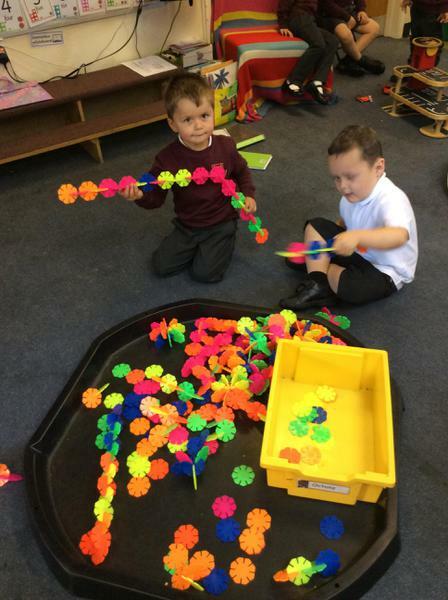 With lots of different ideas ranging from a T-Rex to an alien!